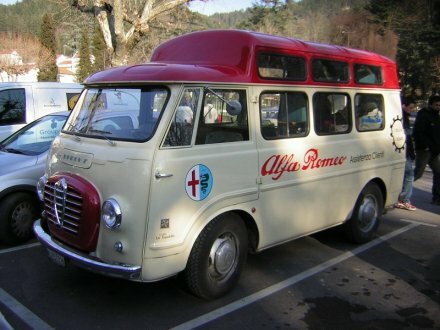 Italian company Alfa Romeo is famous for its passenger and sport cars, although its commercial department produced different commercial vehicles for nearly 60 years. 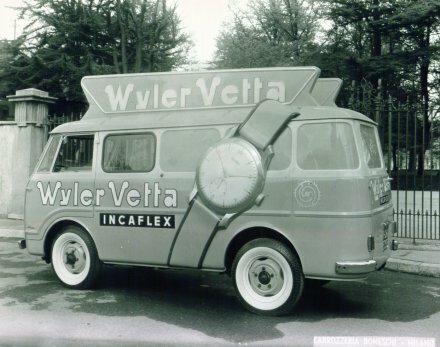 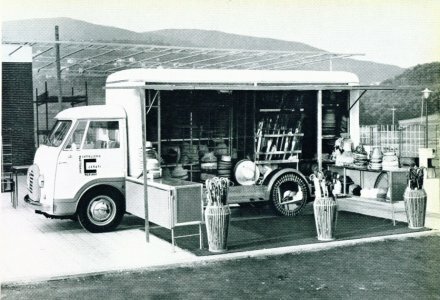 All started in 1929 when the crisis pushed the company to expand its model range. 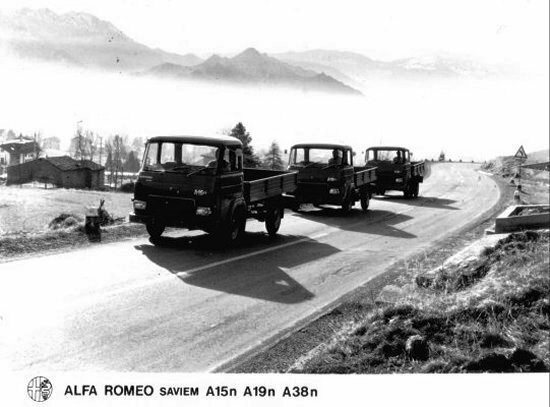 In the autumn of that year, Alfa Romeo signed the agreements with German companies Bussing and Deutz, and began license production of heavy trucks and diesel engines for it. 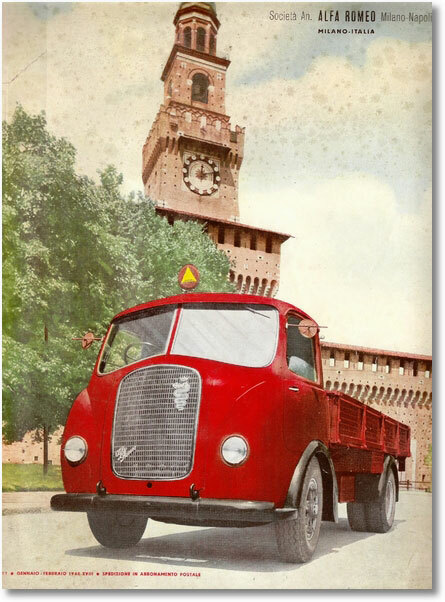 In 1930 a commercial department of Alfa Romeo company was founded, and a year later from the factory’s gates in the Portello near Milan went out the first 6-ton truck Alfa Romeo Biscione. 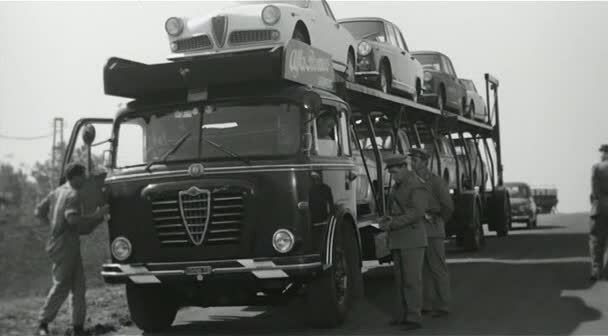 But such heavy and expensive trucks didn’t found a great demand in Italy, and since 1935 Alfa Romeo’s range was complemented by a lighter 4-ton truck. 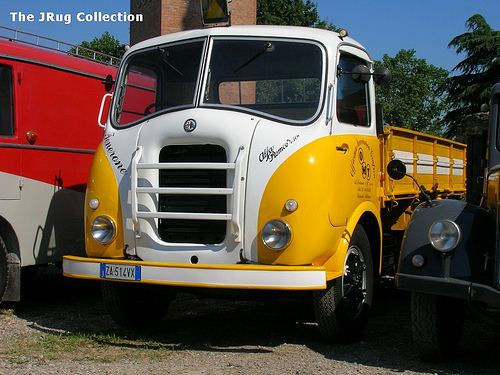 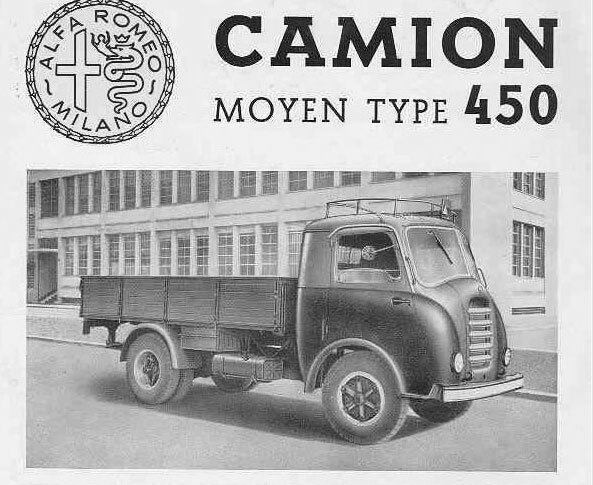 In 1940, Alfa Romeo decided to cancel production of bonneted trucks and concentrate on new cabover models “430” and “800”. 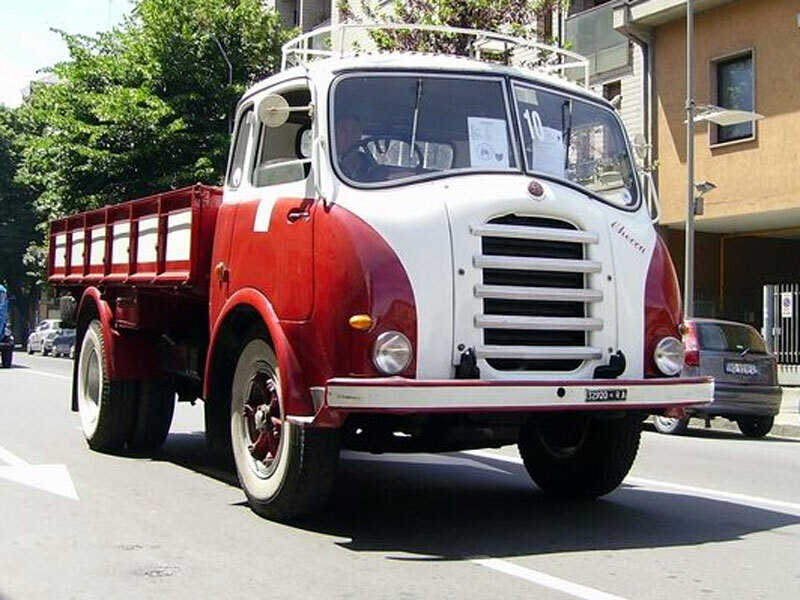 The design of these trucks was made in a style of Alfa Romeo’s passenger cars that made new truck range recognizable, trendy and prestigious, almost like a racing cars of the company. 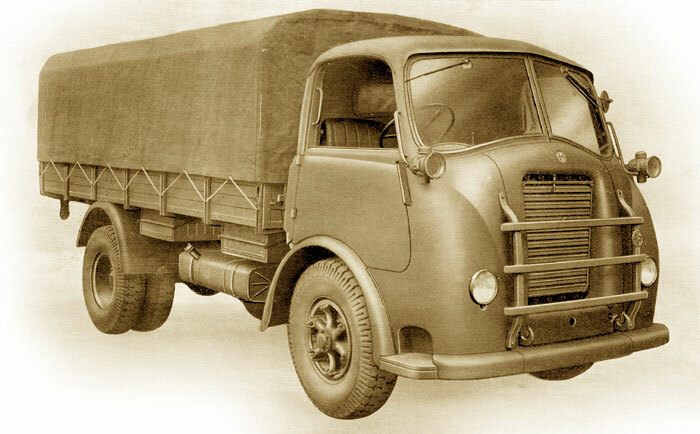 Production of heavy duty trucks was discontinued in 1964 due to difficult economic conditions and strong competition from the side of larger manufacturers. 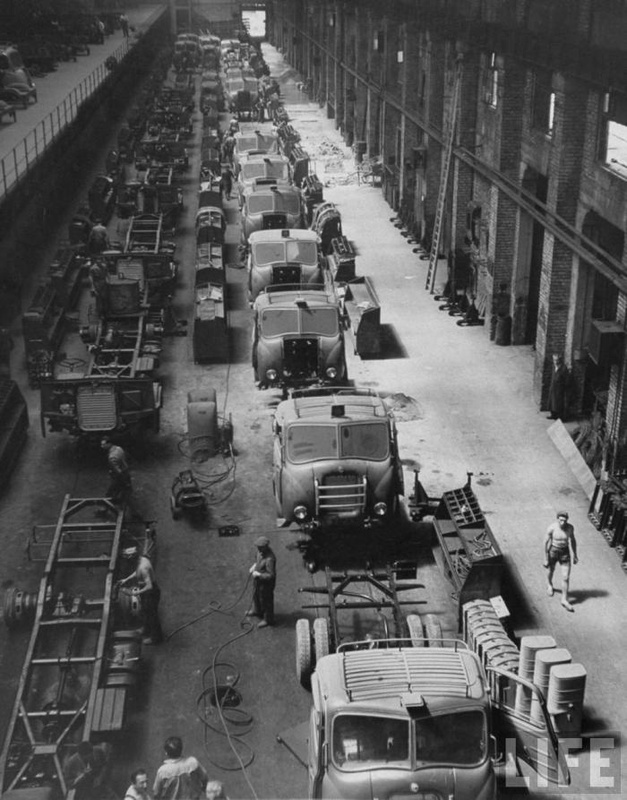 But the production of light trucks, vans and special vehicles based on them have been continued. 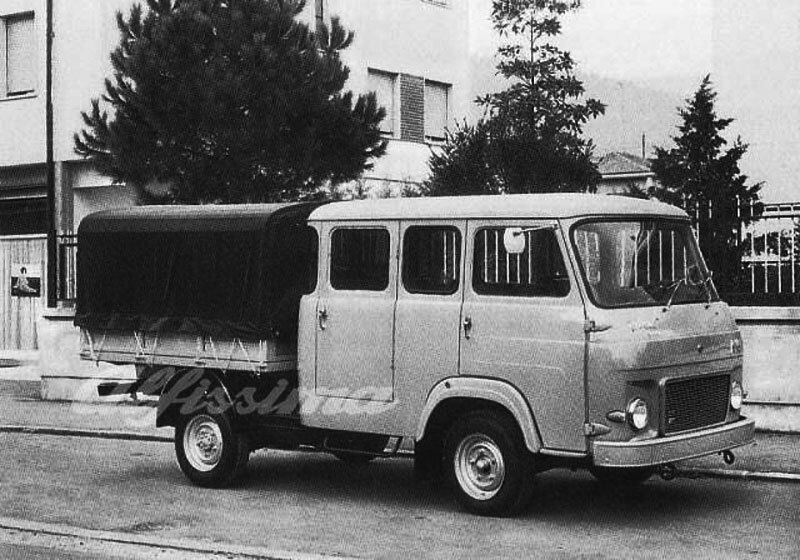 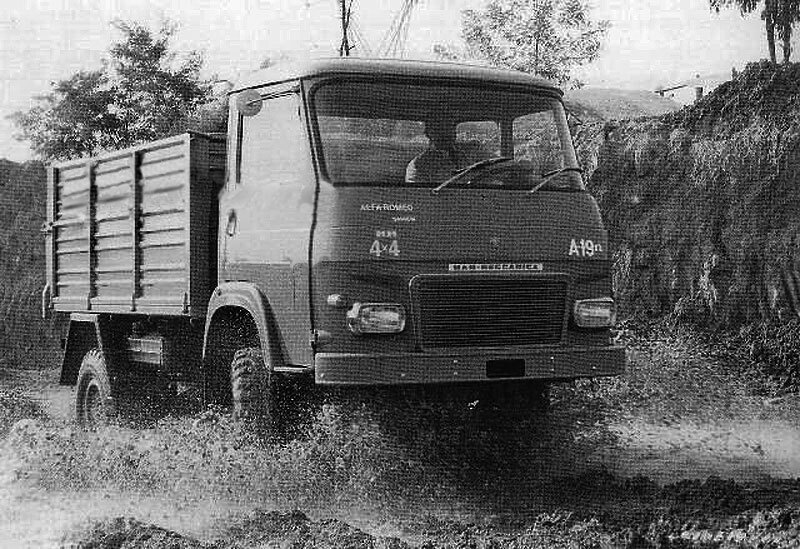 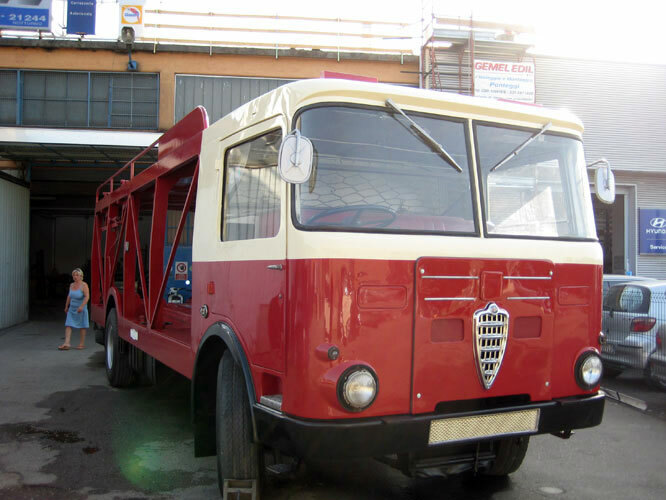 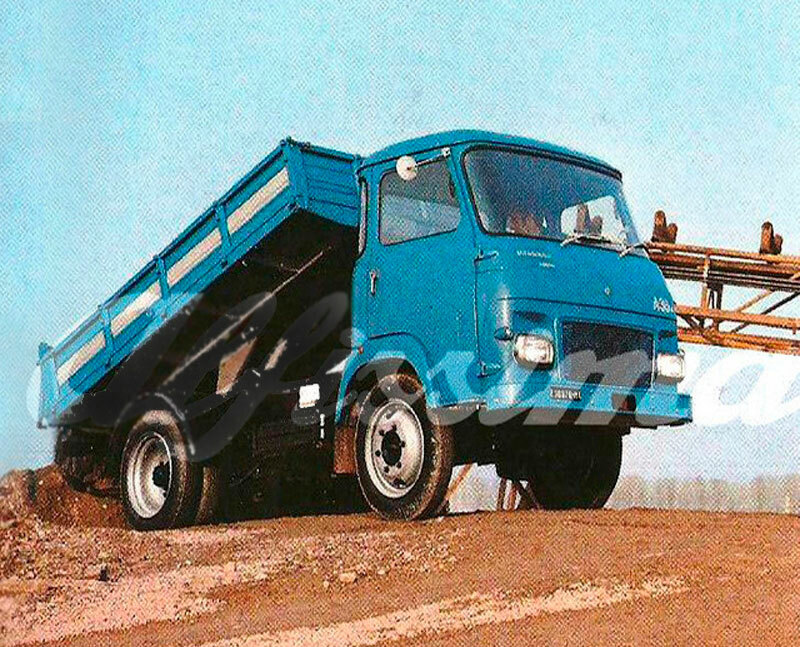 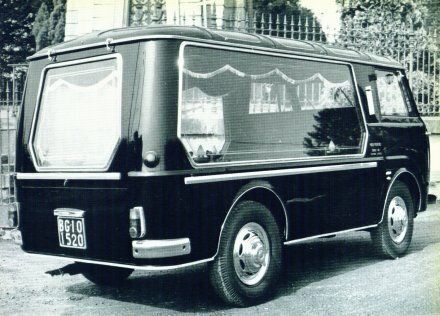 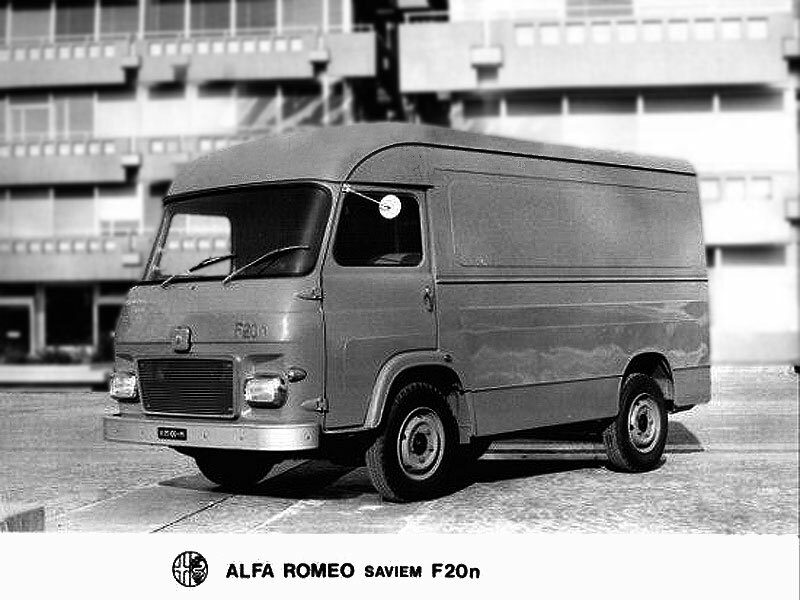 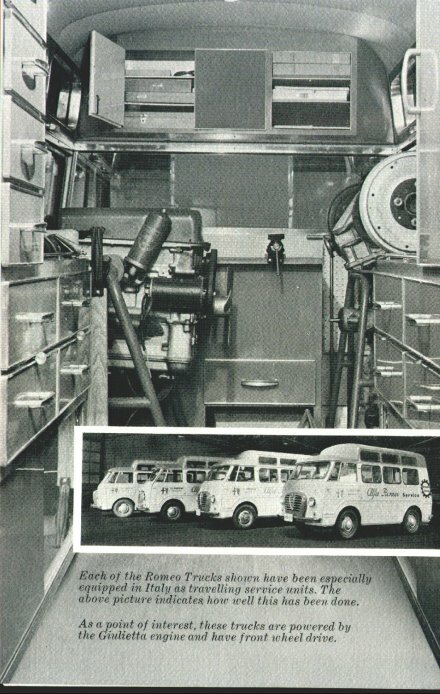 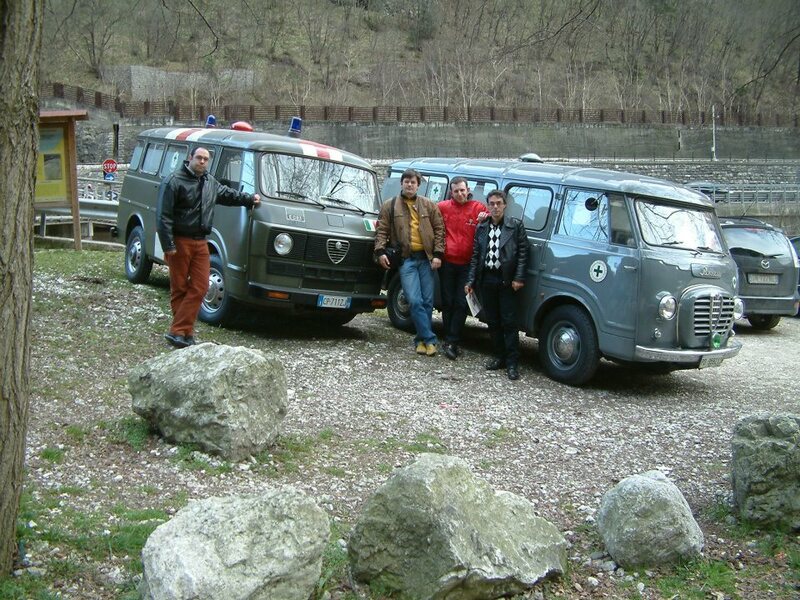 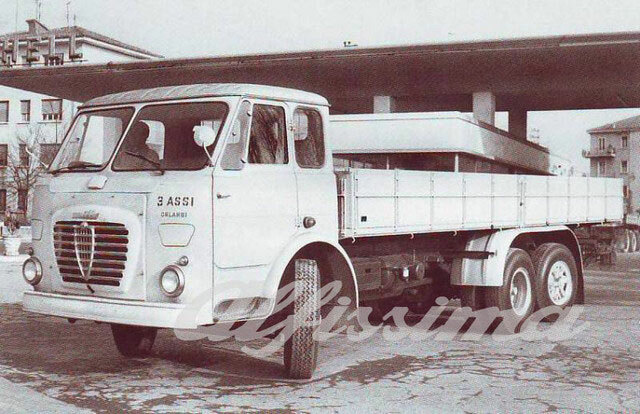 So, in cooperation with the SAVIEM company since 1967, Alfa Romeo was producing light trucks, similar to French models SG2 and SG4. 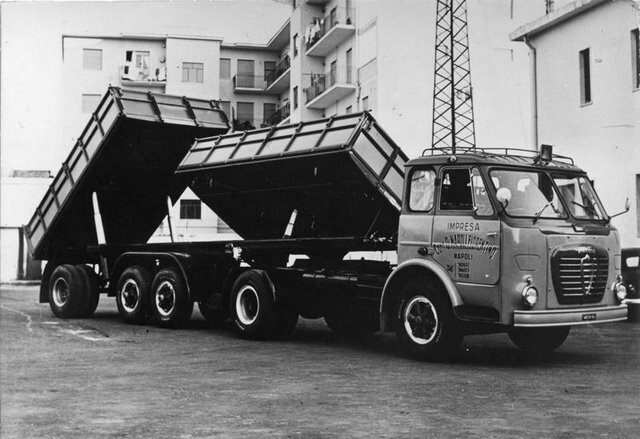 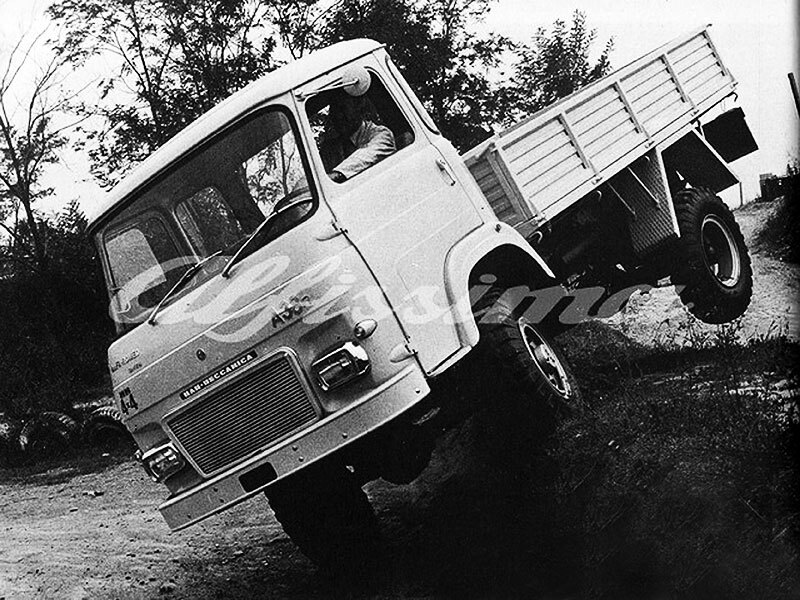 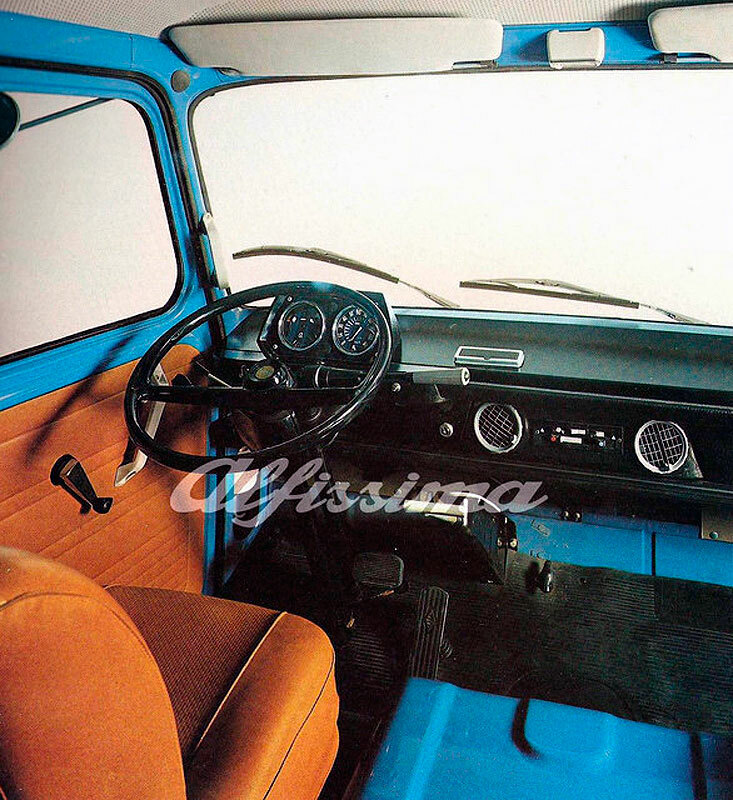 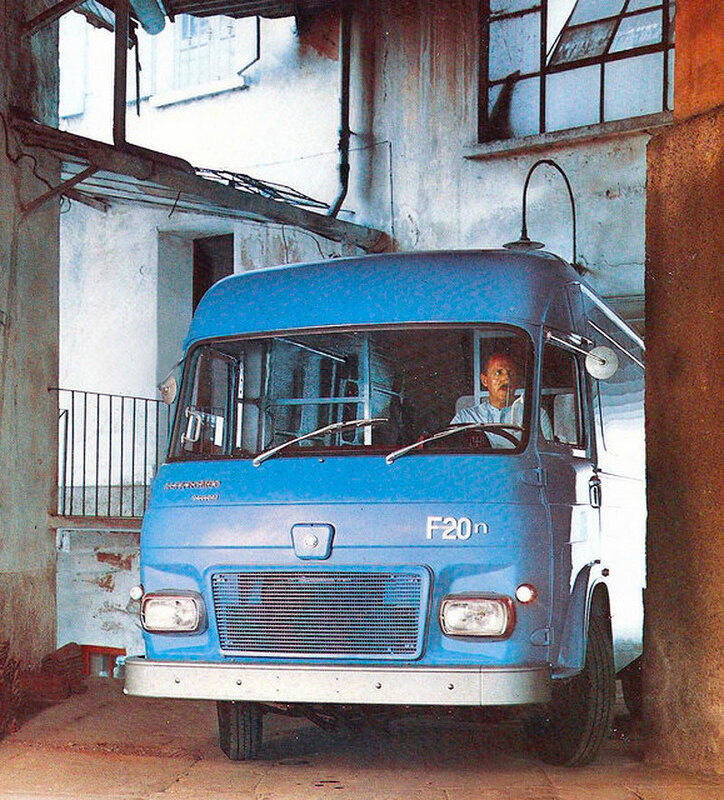 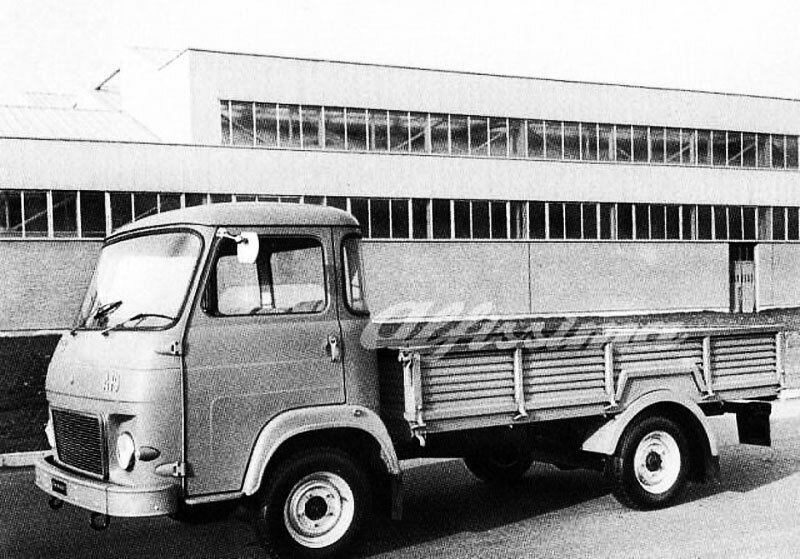 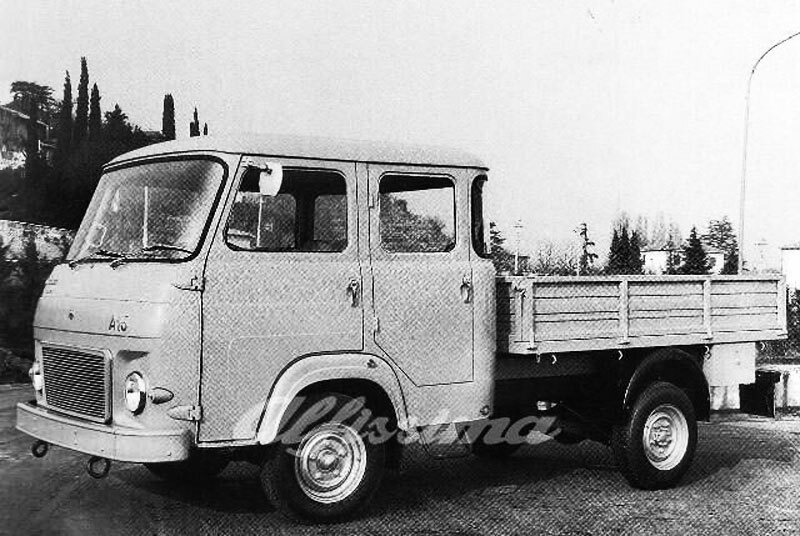 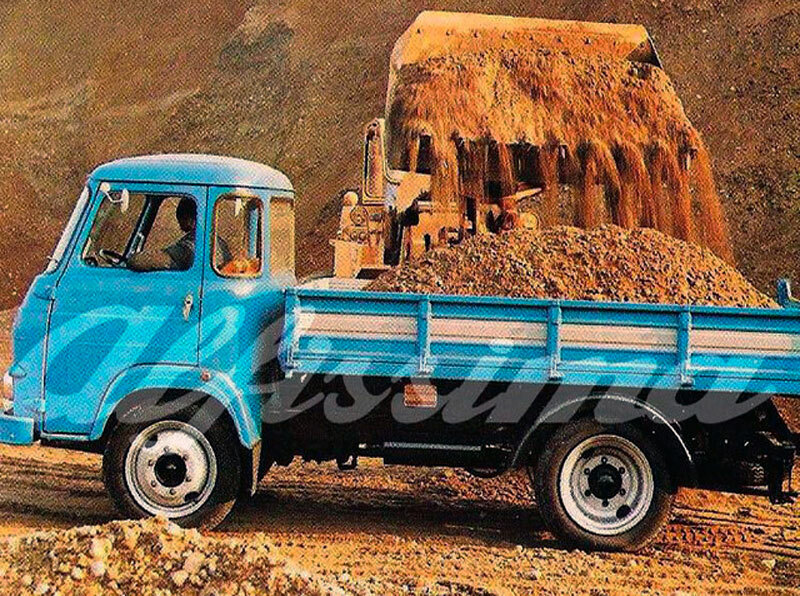 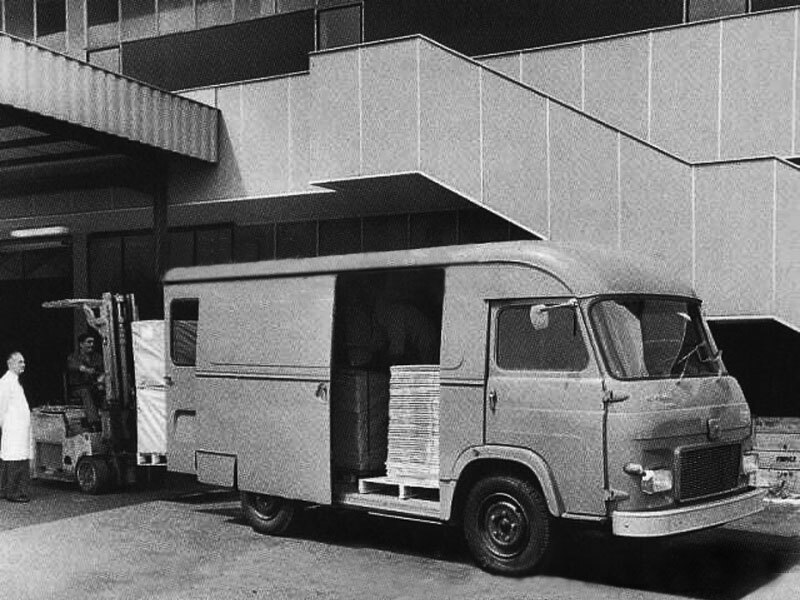 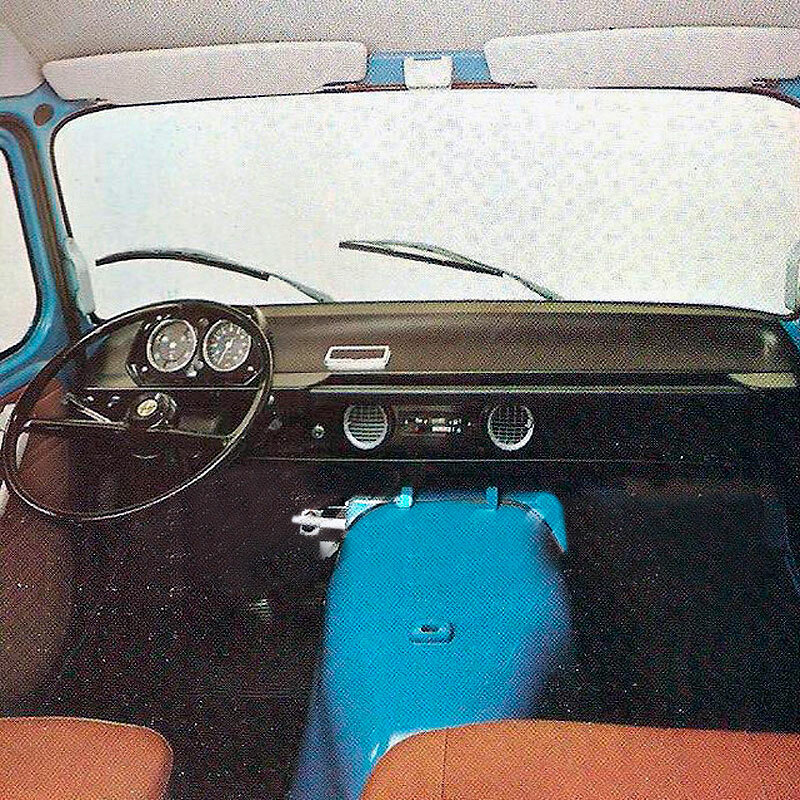 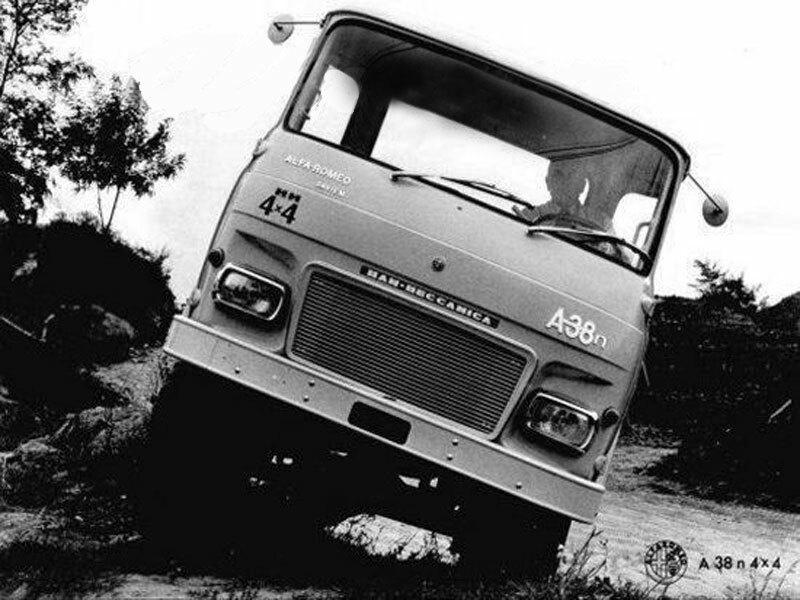 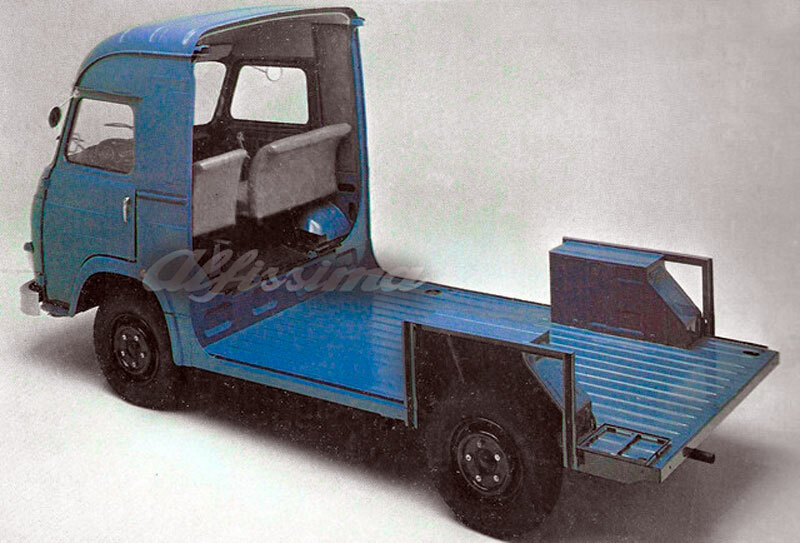 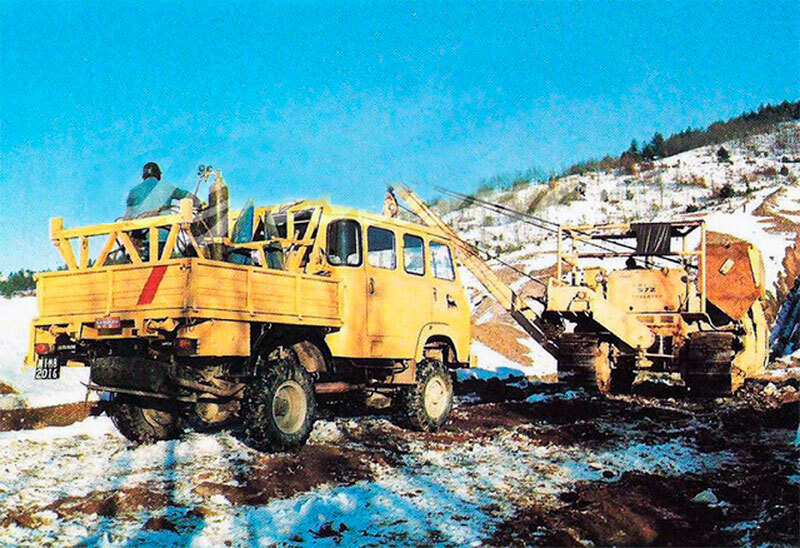 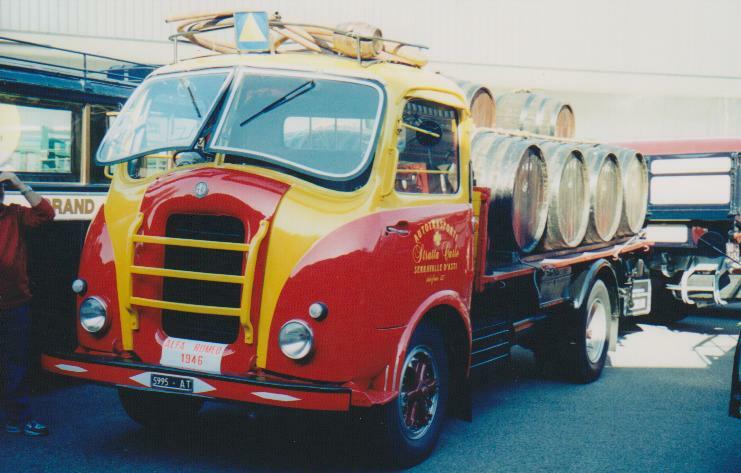 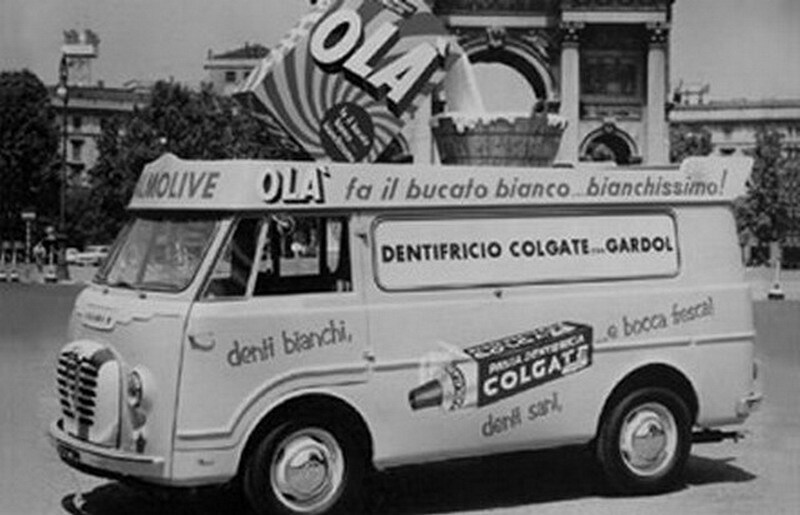 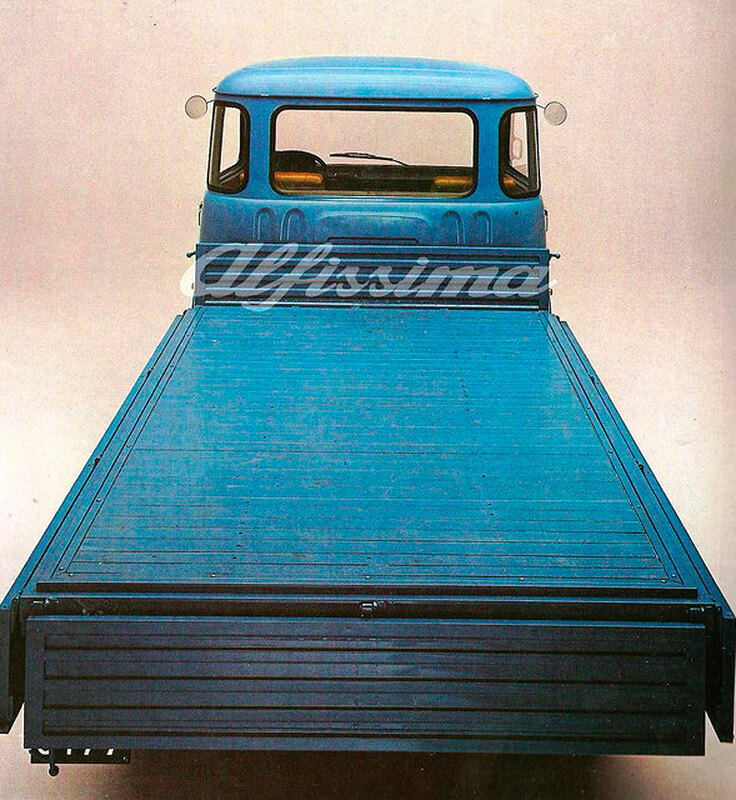 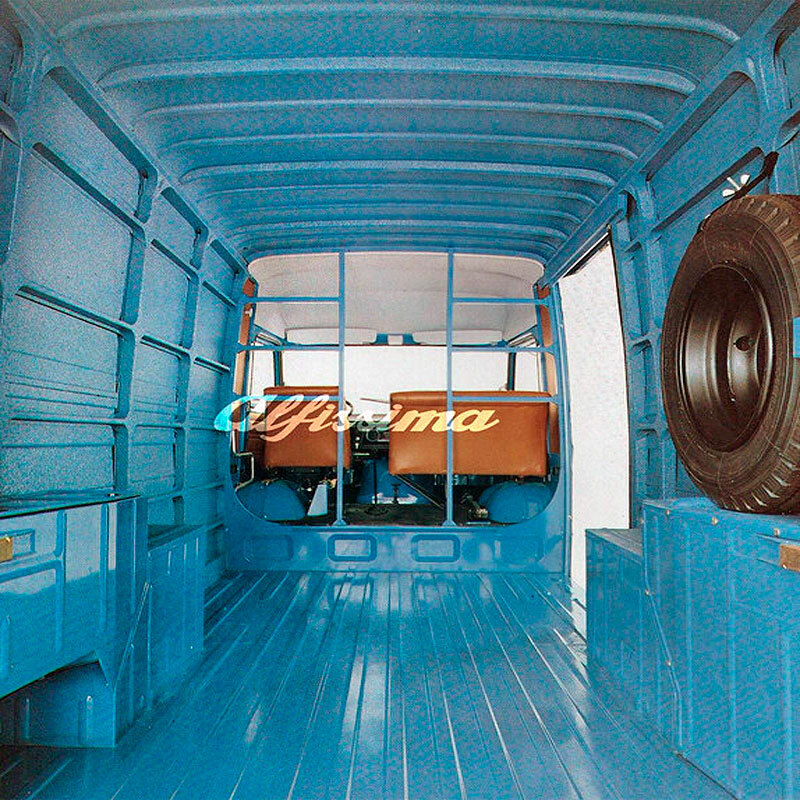 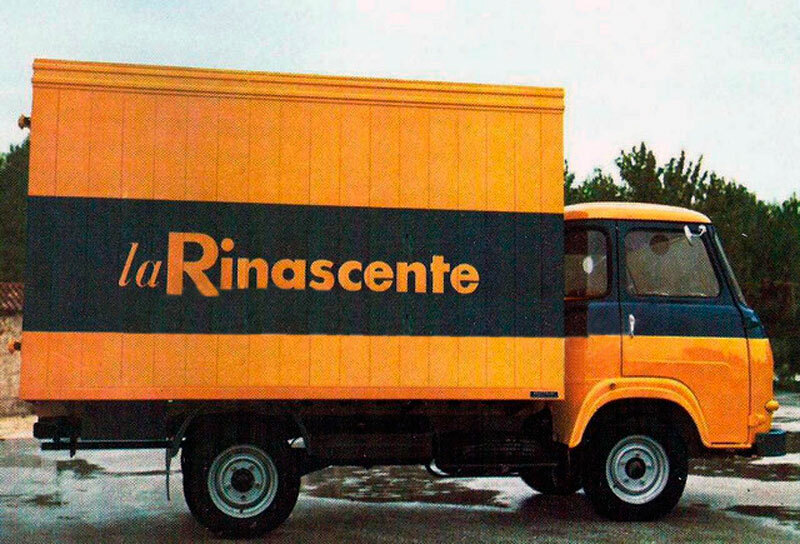 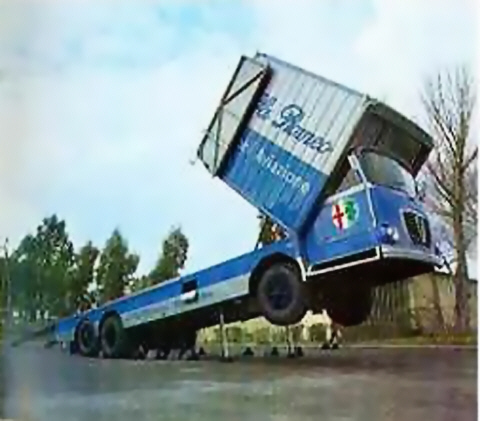 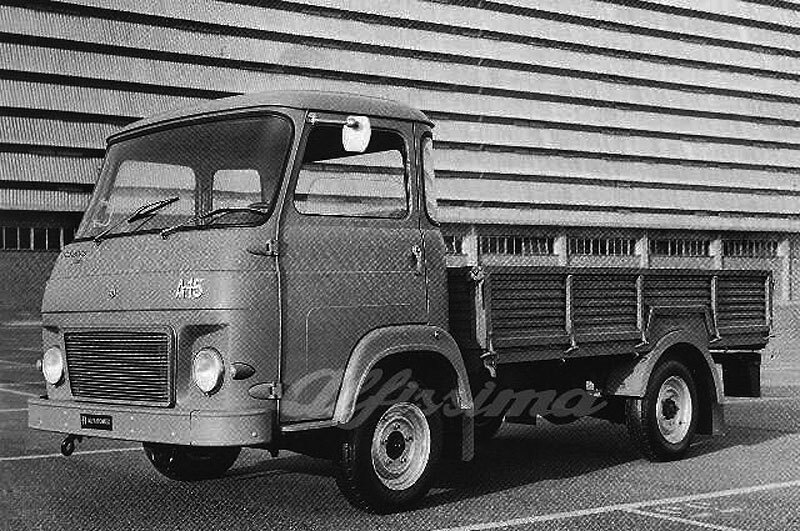 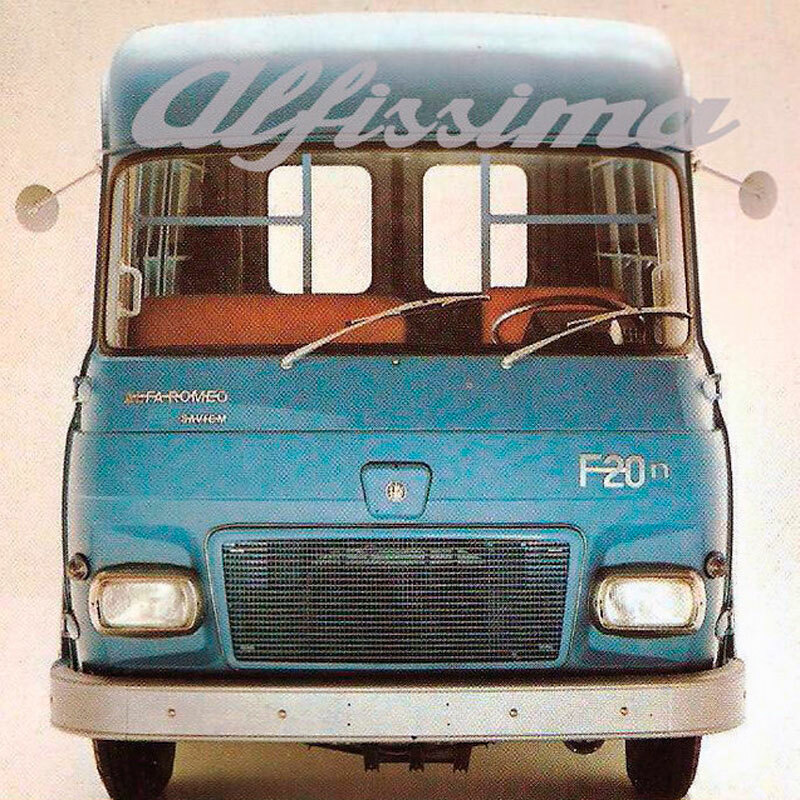 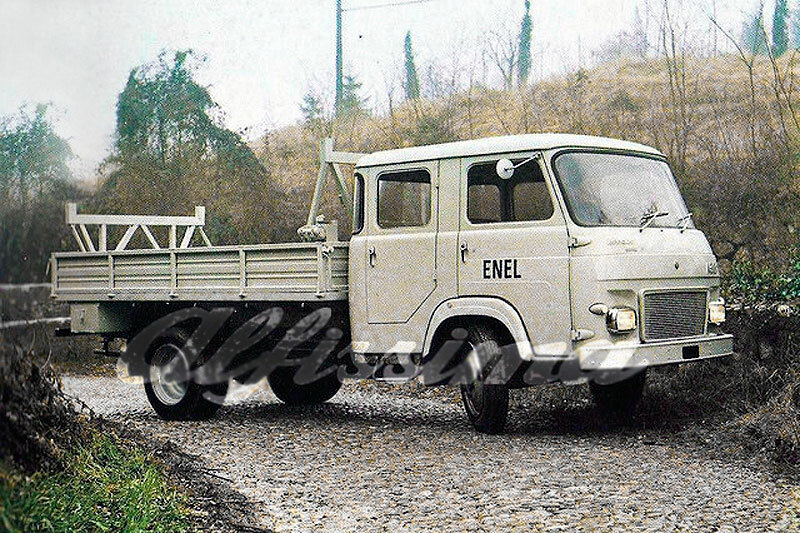 In 1968 the factory in Pomigliano d’Arco near Naples, has been redeveloped for the production of light trucks. 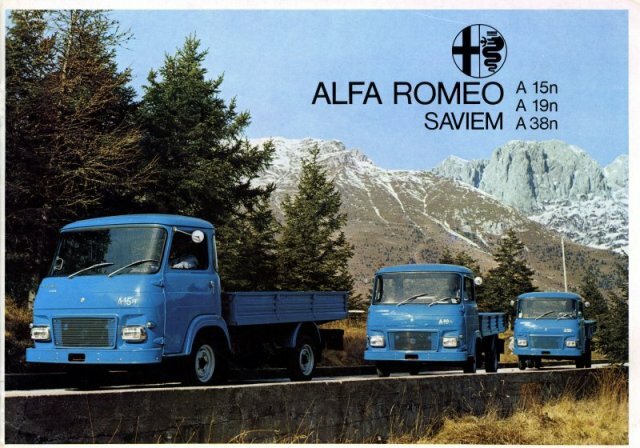 Along with the newly formed holding IVECO, Alfa-Romeo took part in the construction of motor plant SOFIM, where, since 1978, engines for light trucks IVECO Daily were produced. 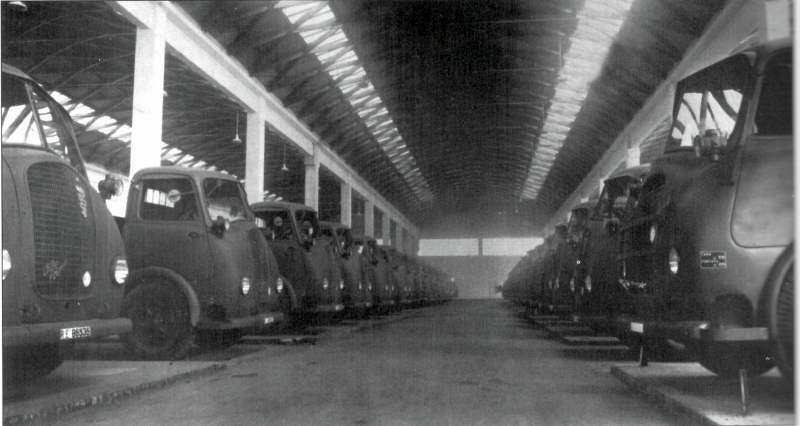 The success of these vehicles has forced the Alfa Romeo company to organize the assembly of it on the plant in Pomigliano d’Arco. 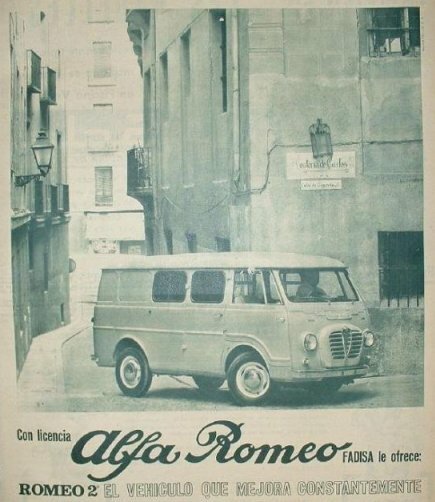 In November 1986, Alfa Romeo joined the group FIAT and the production of identical vehnicles under different brands lost all meaning. 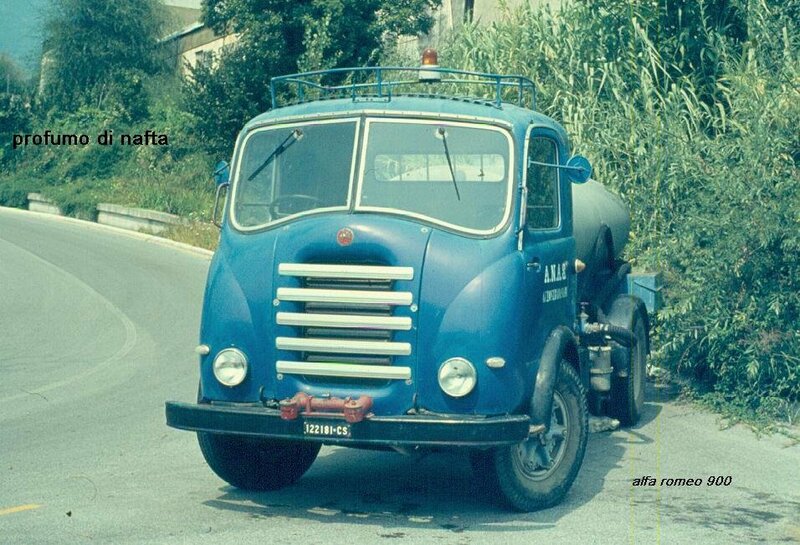 That is why in 1989, production of trucks under Alfa Romeo brand has been discontinued. 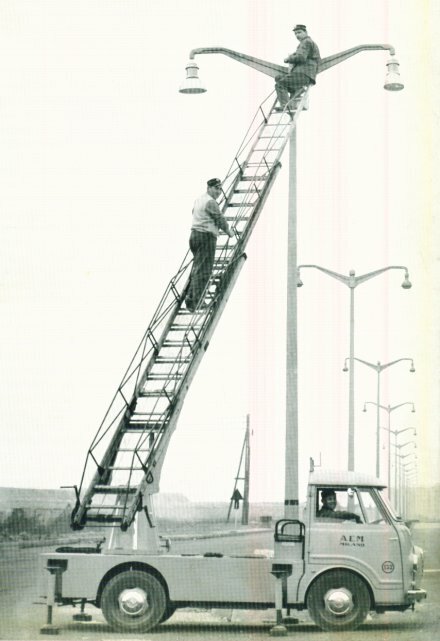 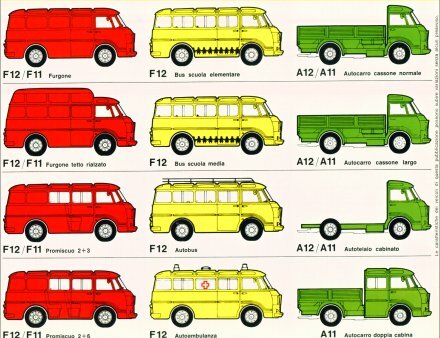 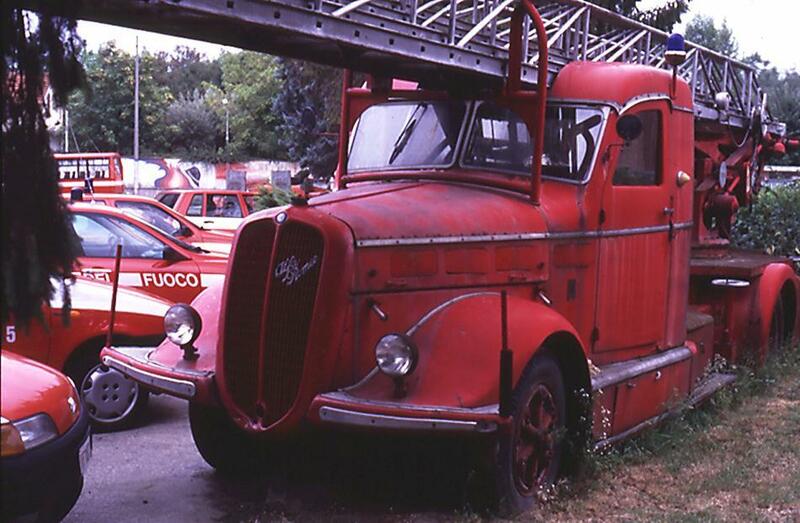 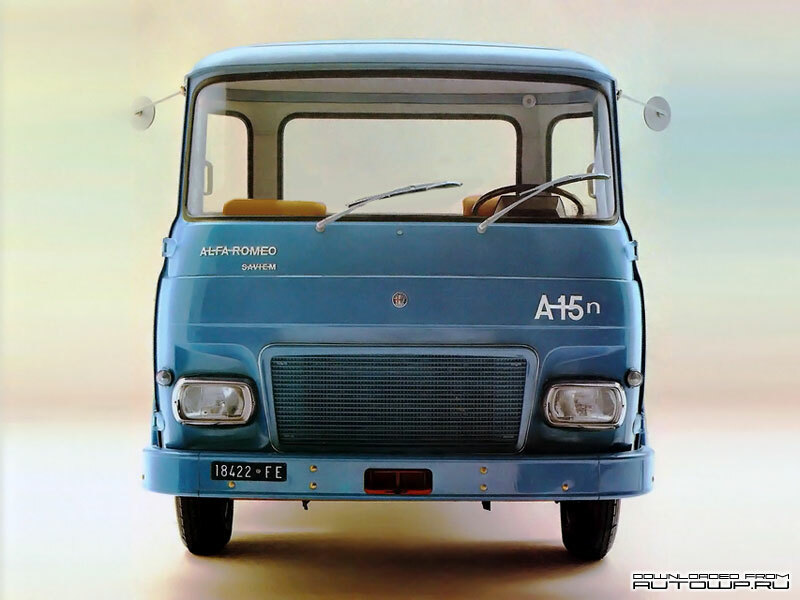 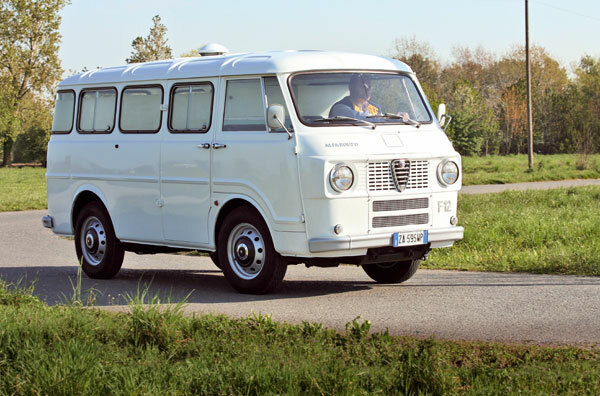 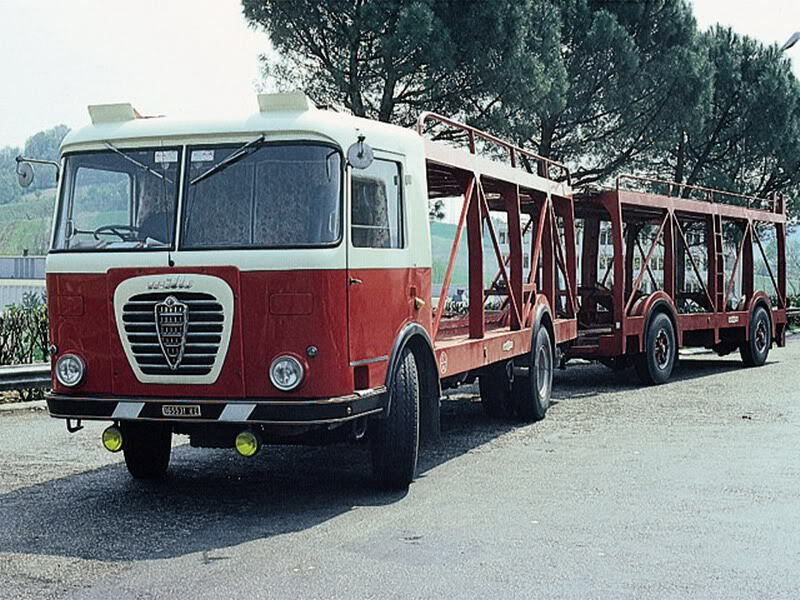 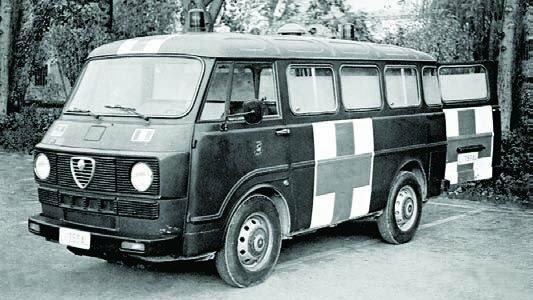 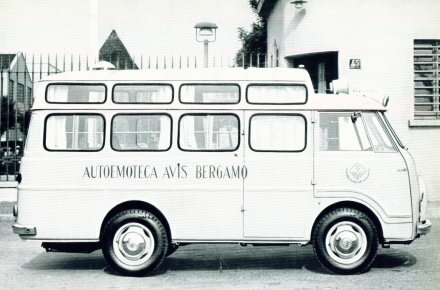 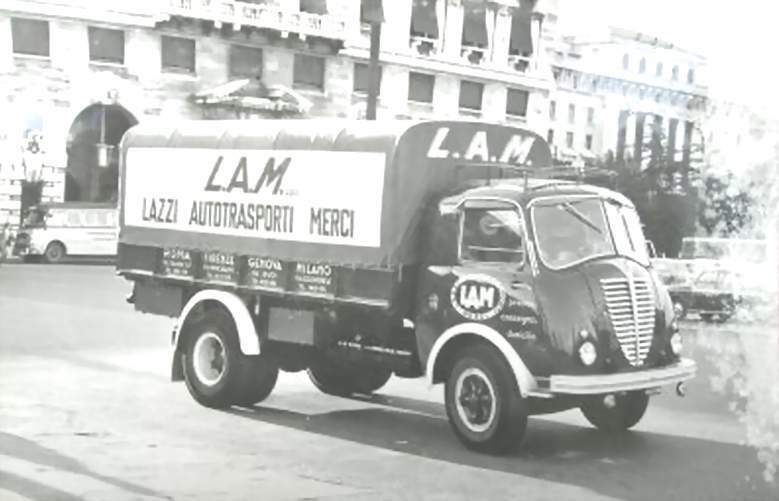 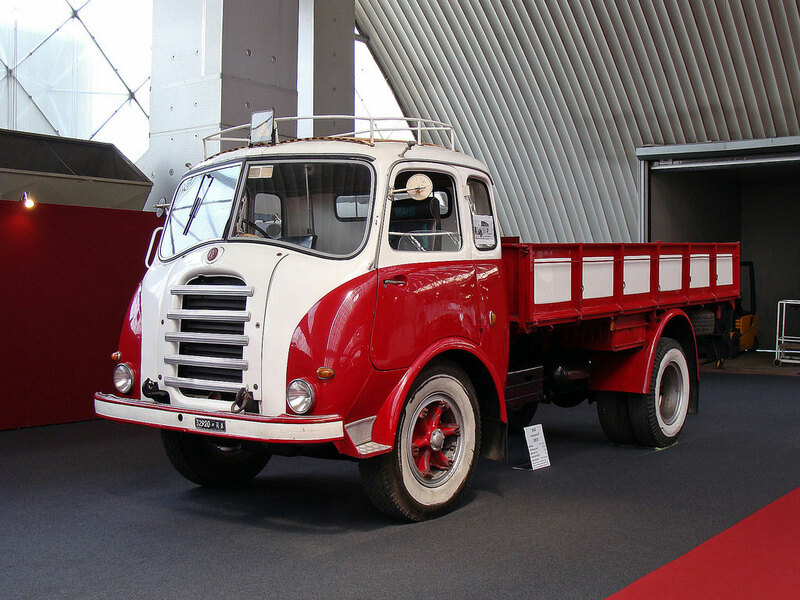 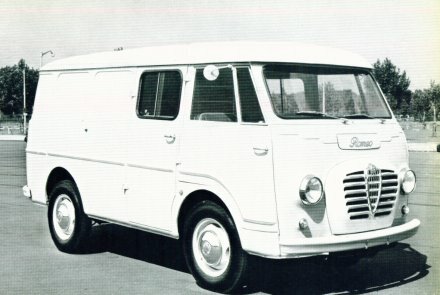 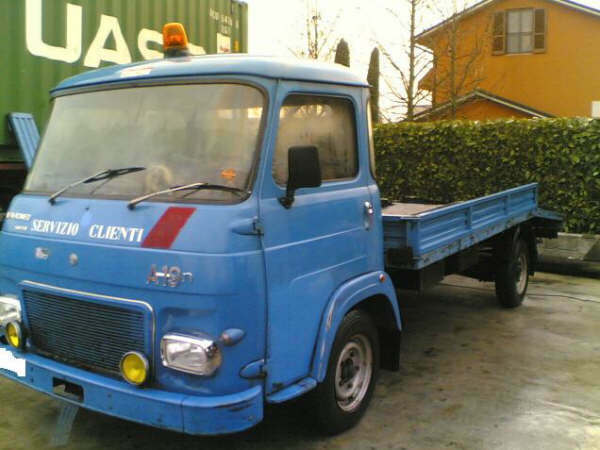 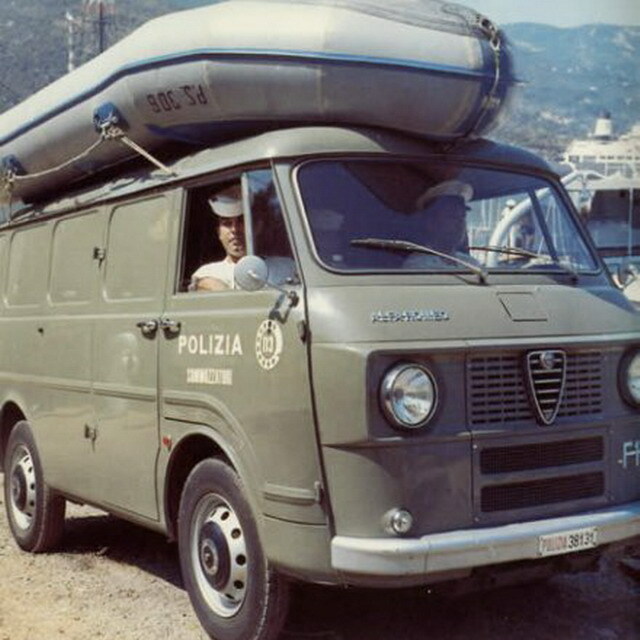 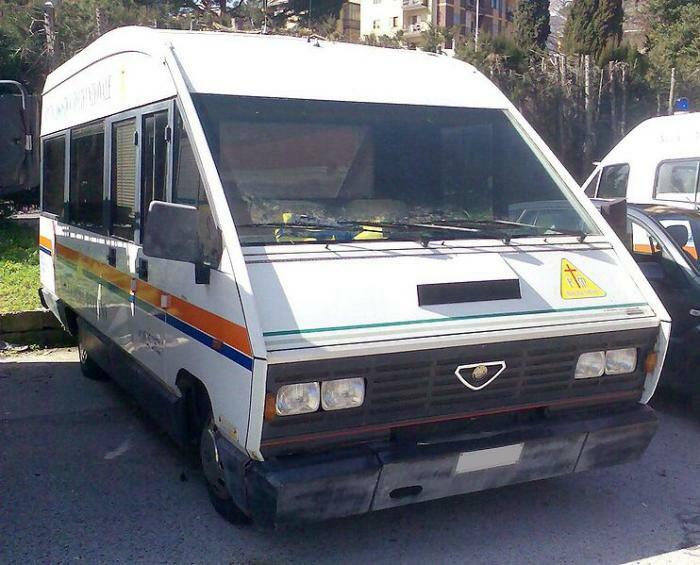 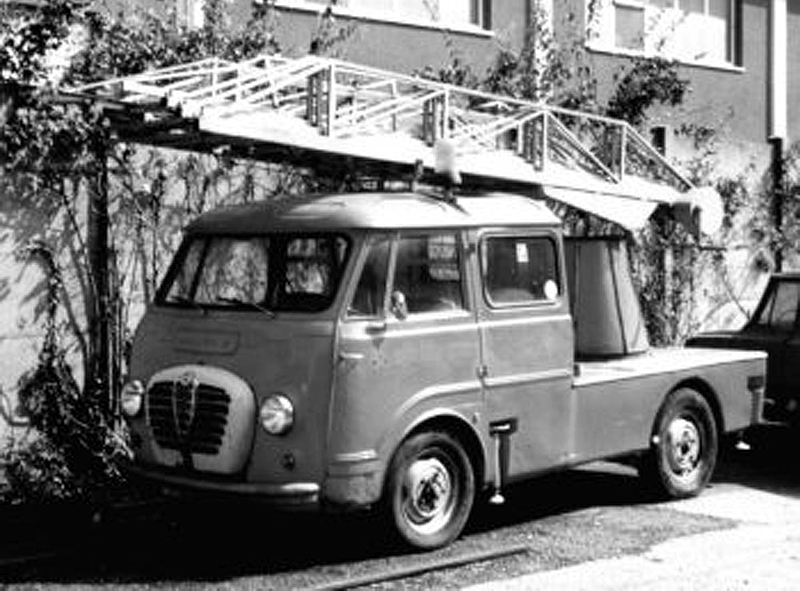 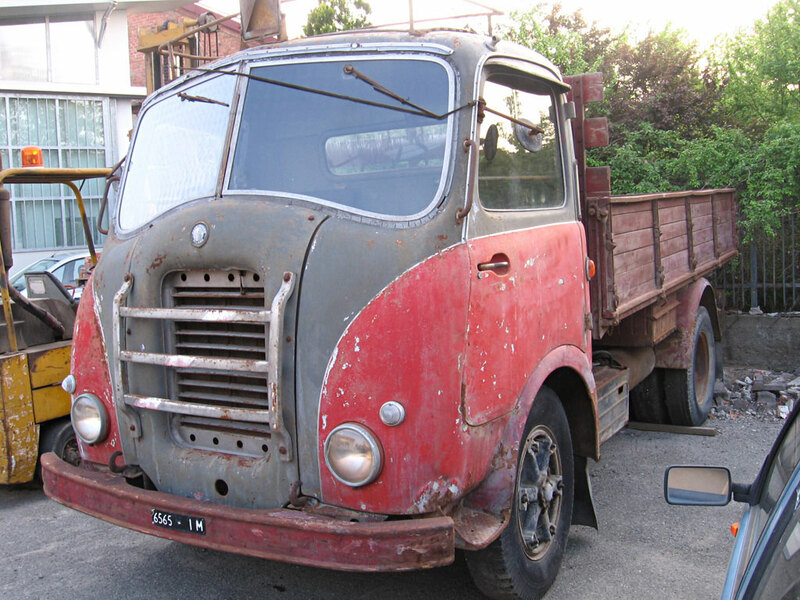 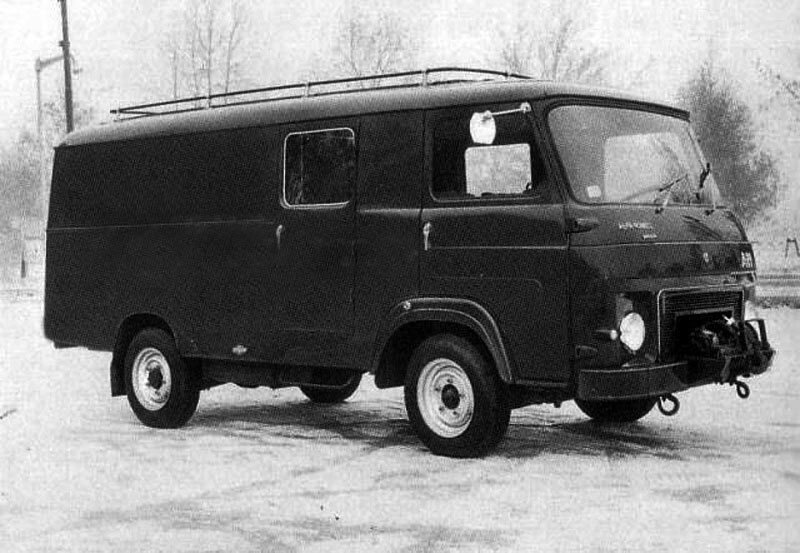 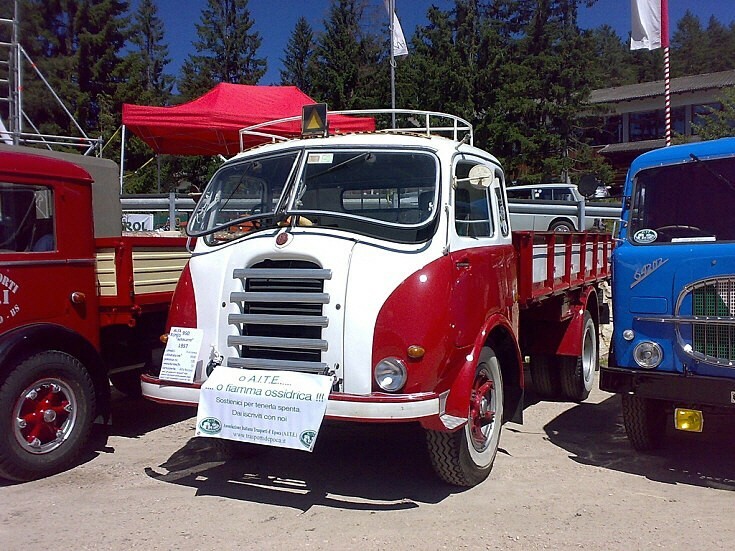 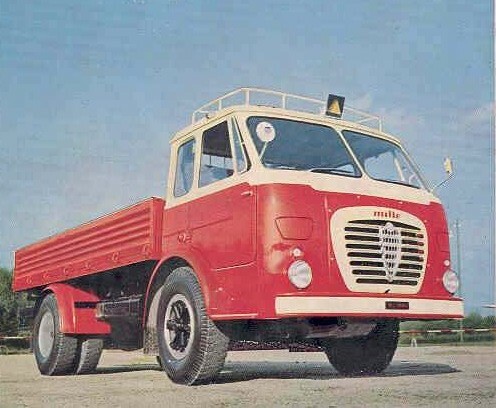 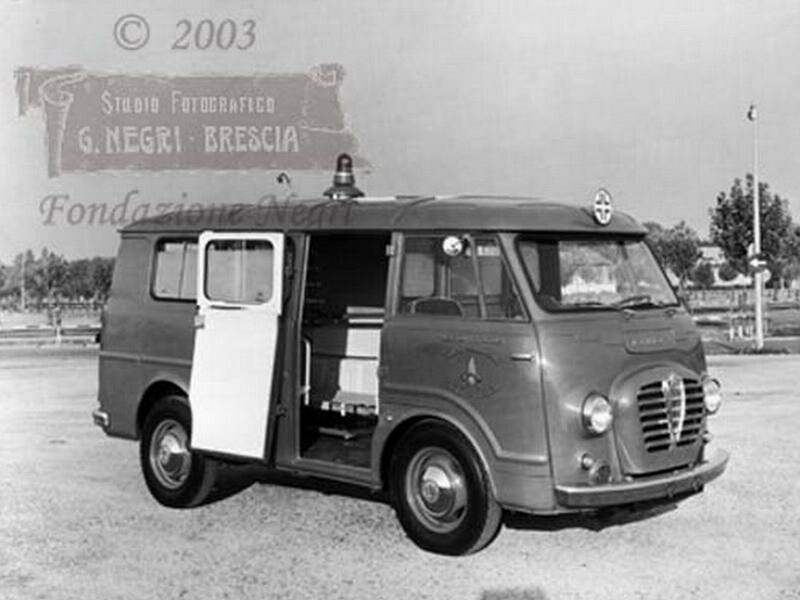 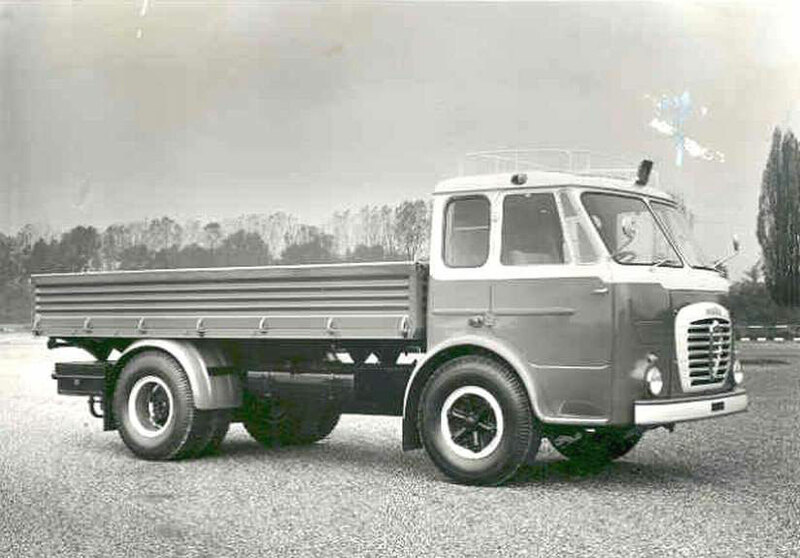 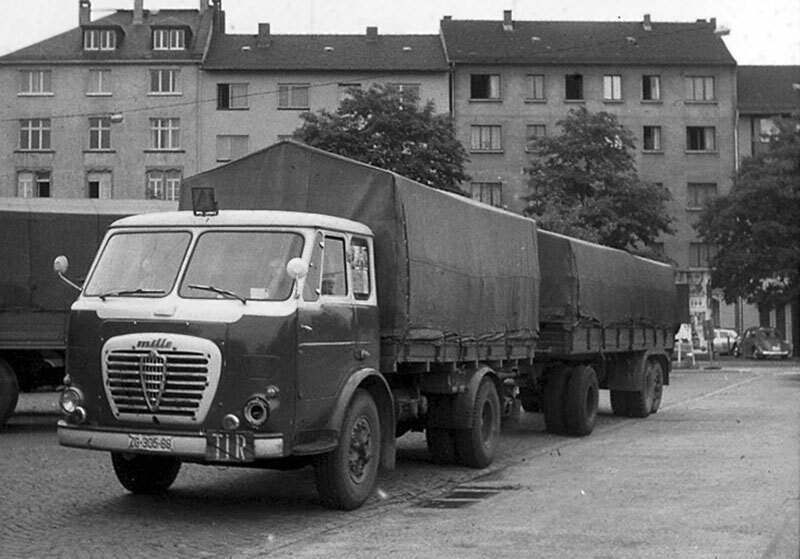 Since 1967, in cooperation with the French company SAVIEM, Alfa Romeo produced light trucks A15 / A19 / A38, similar to the French models SG2 and SG4. 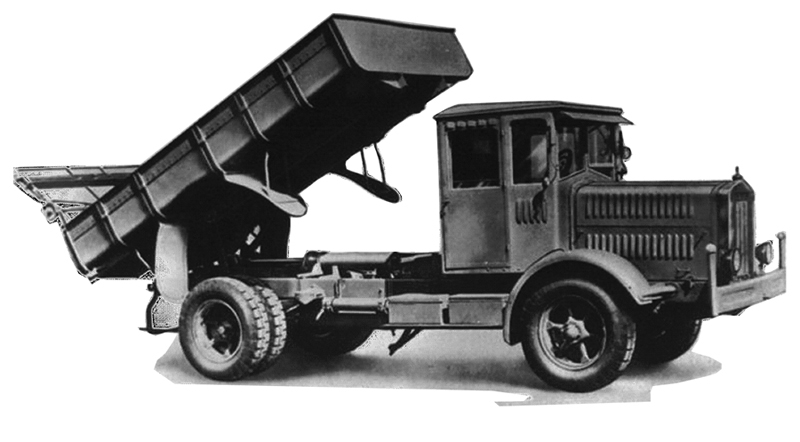 The lightest in the range model A15 had a total mass of 3500 kg, and the next in a series the model A19 – the total mass of 3900 kg. 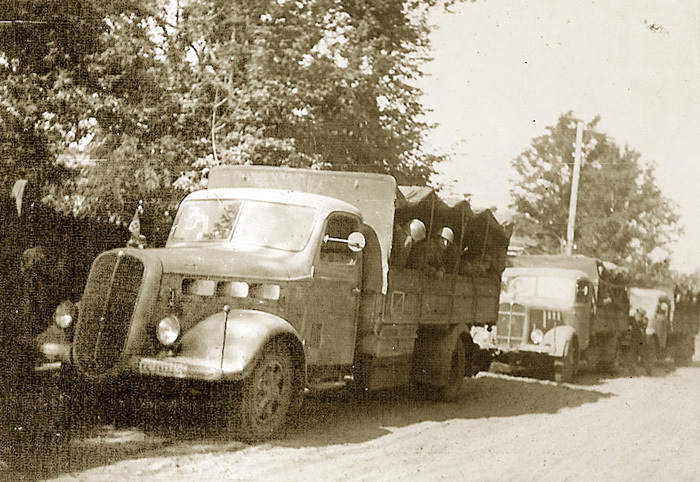 These trucks were equipped with a 72 hp engine and had a top speed of 92 km/h. 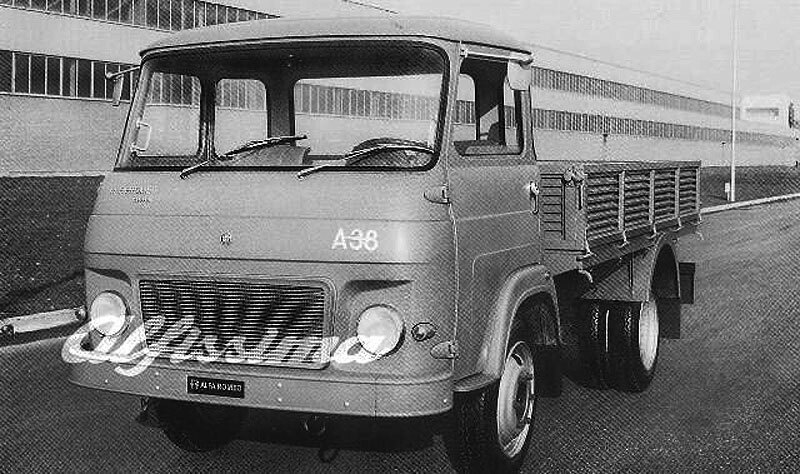 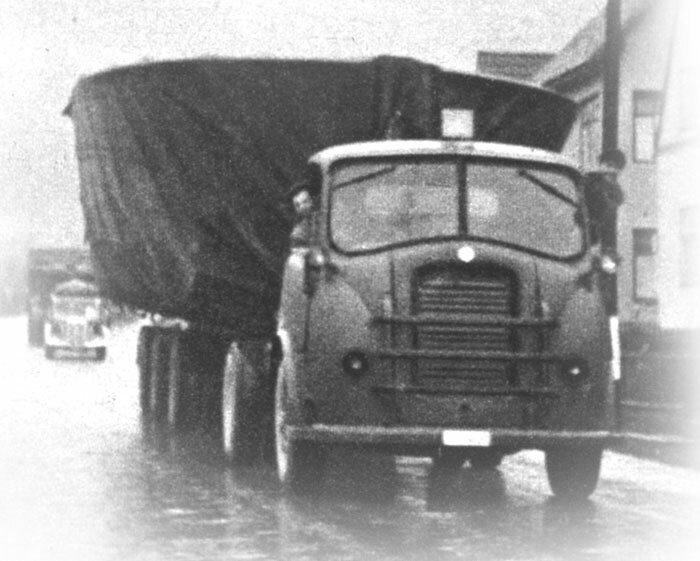 The heaviest model A38 had a total mass of 6300 kg and was available in three variants with a wheelbase of 2660 (A38), 3240 (A38/L1) and 3640 (A38/L2) mm. 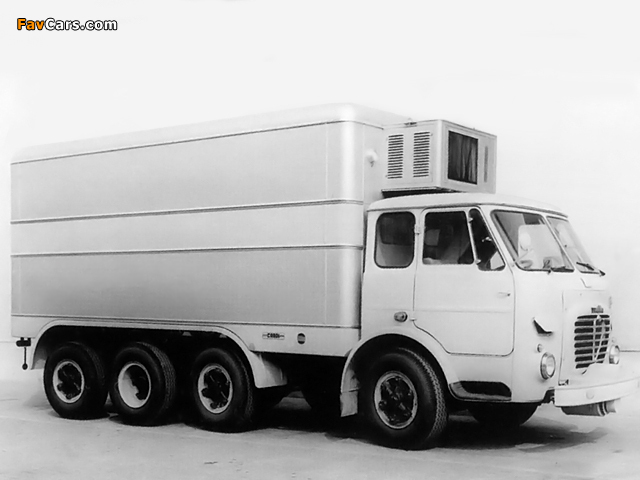 It had a more powerful 77 hp engine. 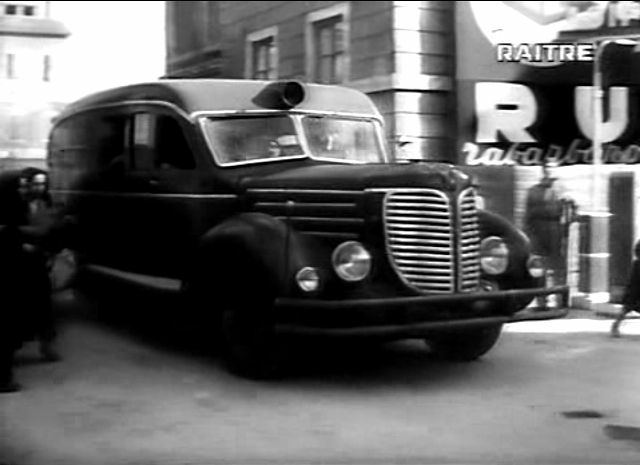 Maximum speed was 79 km/h. 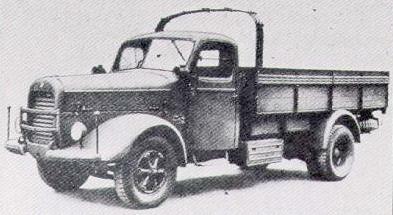 The Model A38 was available in a four-wheel drive version. 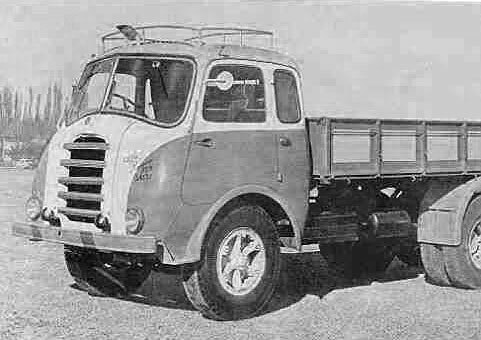 In addition to flatbed trucks and chassis there was a all-metal van F20 with a total weight of 4300 kg and engine power of 72 hp. 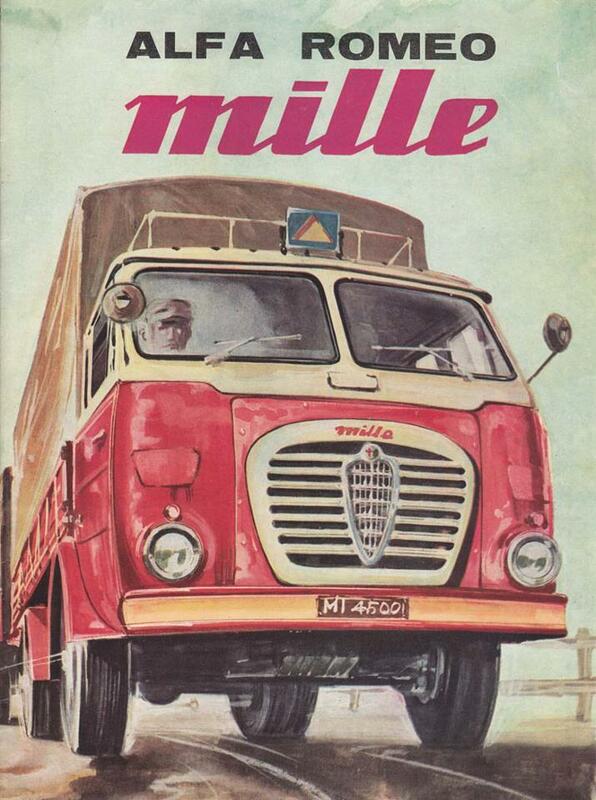 In 1958, Alfa Romeo introduced its new model “1000” or Mille with a capacity of 8-11 tons. 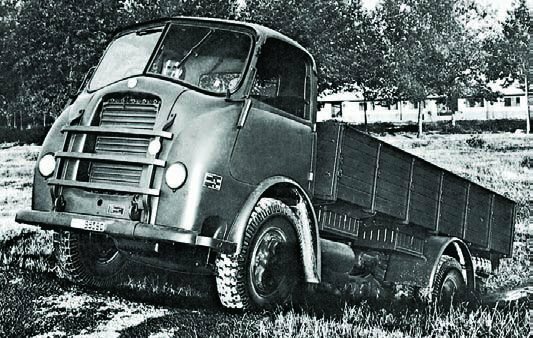 The trucks were equipped with a new 11-liter engine with an output of 163-174 hp, 8-speed gearbox and a new spacious sleeper cab. 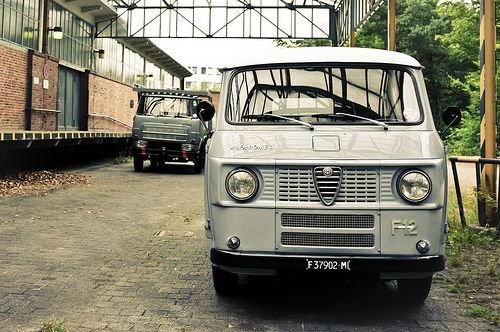 The grille has original Alfa Romeo’s stylized shield. 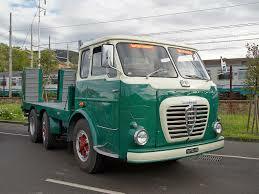 The truck has been called one of the most elegant and innovative truck for its time. 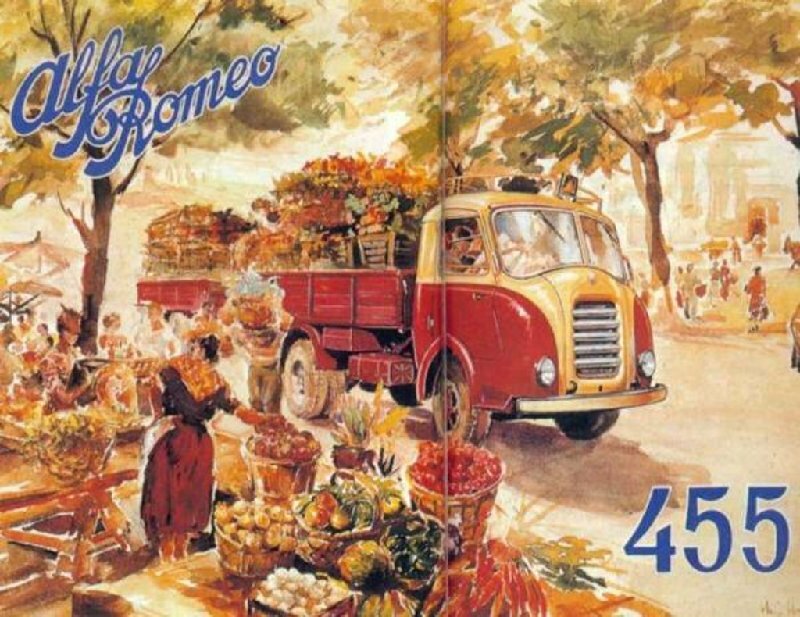 But because of the difficult economic situation and strong competition from larger companies, it was produced only until 1964. 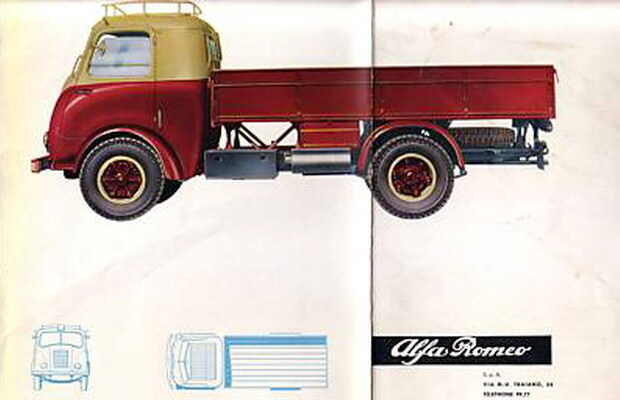 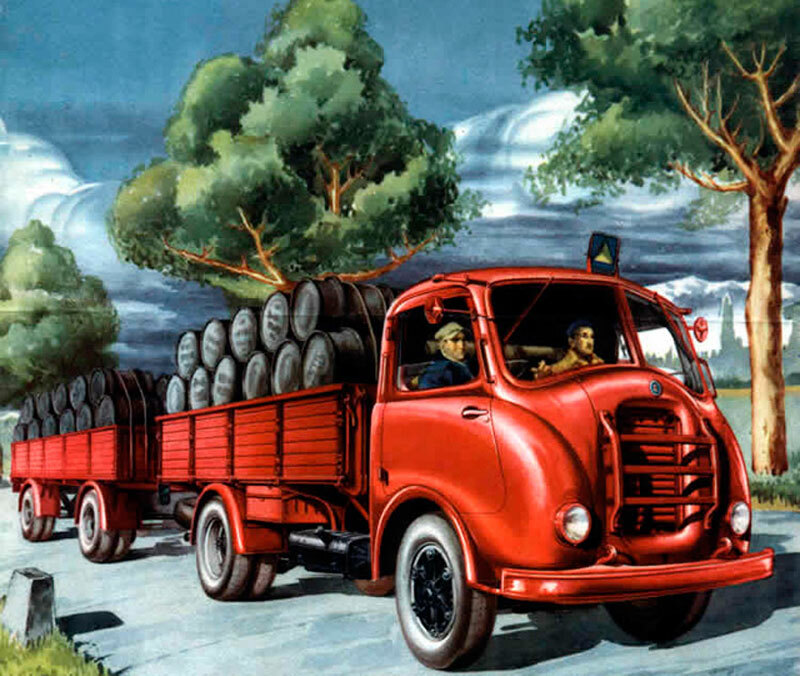 That time Alfa Romeo has ceased production of heavy trucks. 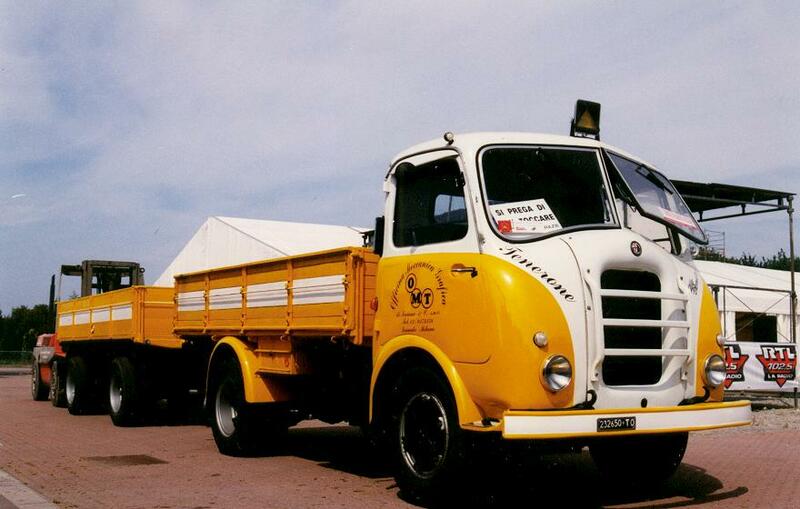 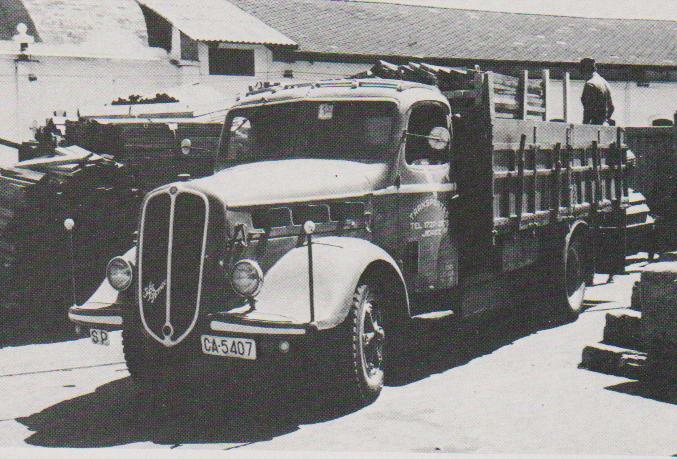 In 1956, the license for the production of the Mille was acquired by the Brazilian company FNM and was producing these trucks under its own brand until 1980. 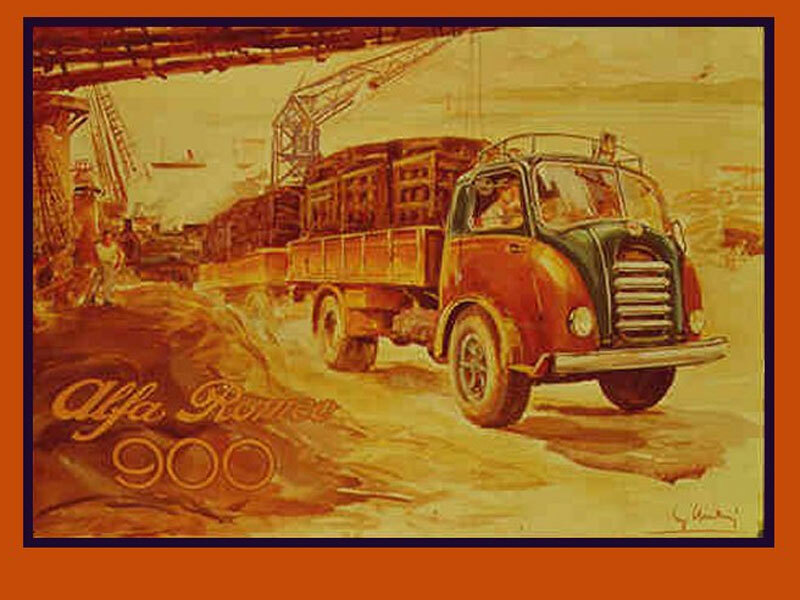 By the mid-’50s the Model 900 was updated and became known as the Model 950. 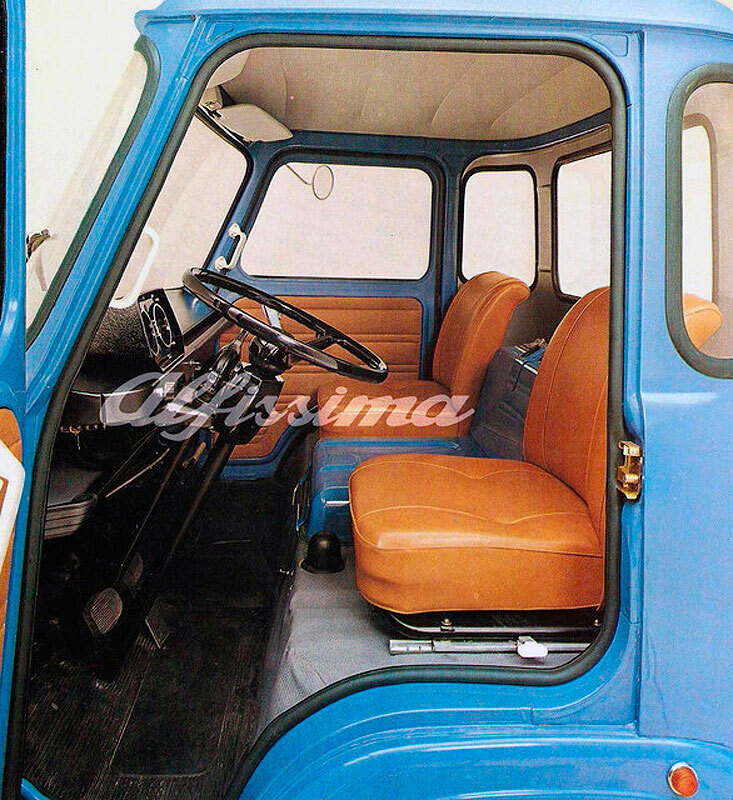 The main difference between two models is small windows behind the front doors of the cab. The model 950 was produced until 1958, when it was replaced by an absolutely new model Mille. 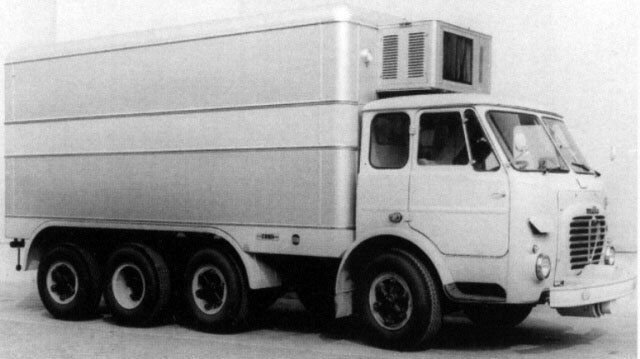 This truck is a hybrid produced by an unknown company. 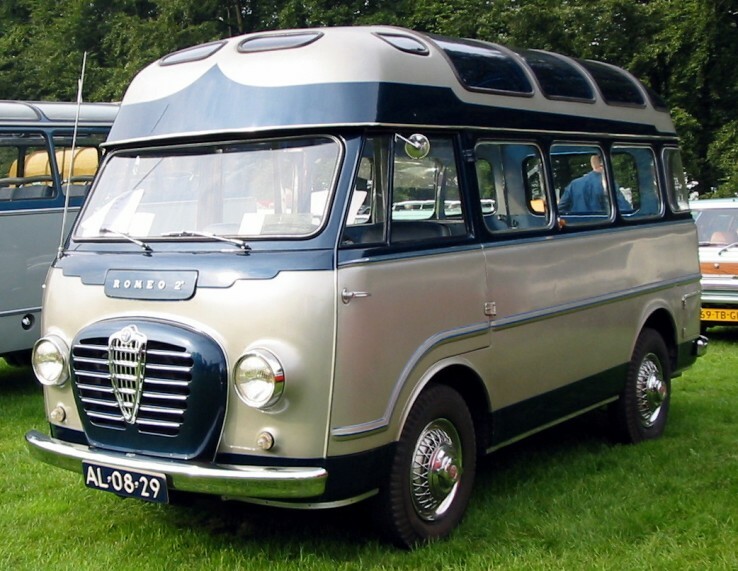 It has the cabin from the Model 950, and the grille from the Model 900A bus. 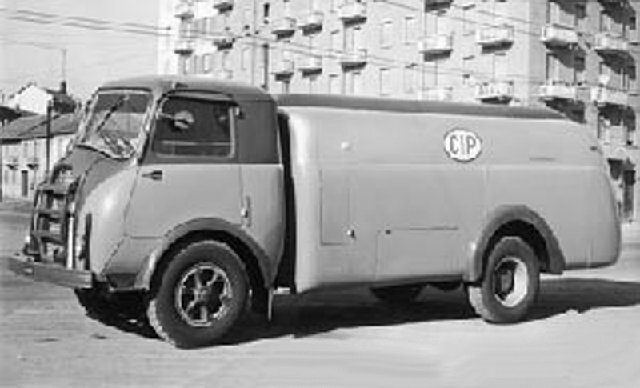 Chrome was widely used in decor of a truck. 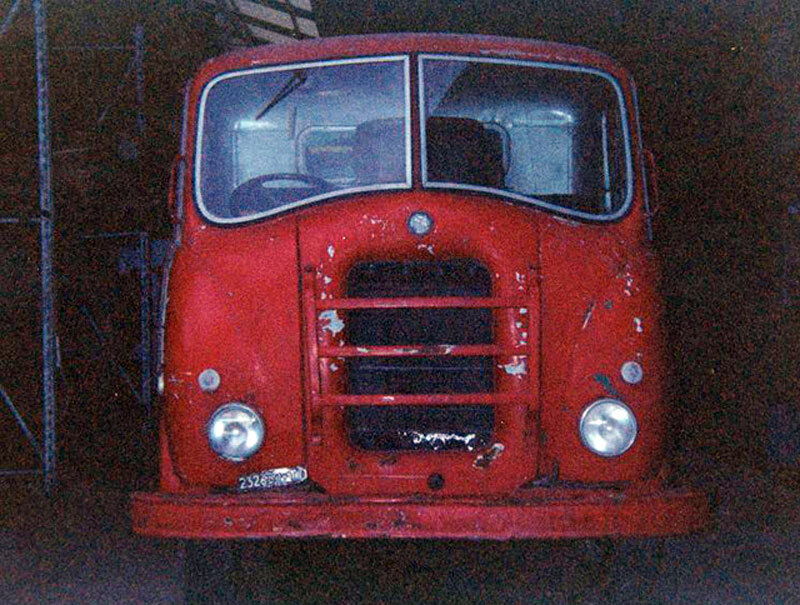 So the bumper was almost chromed and headlights received chrome visors. 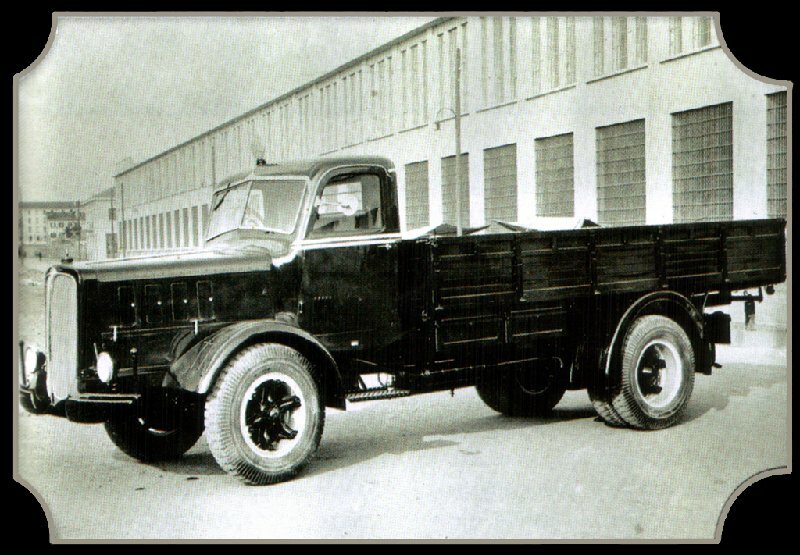 It is unknown how many of these trucks were made. 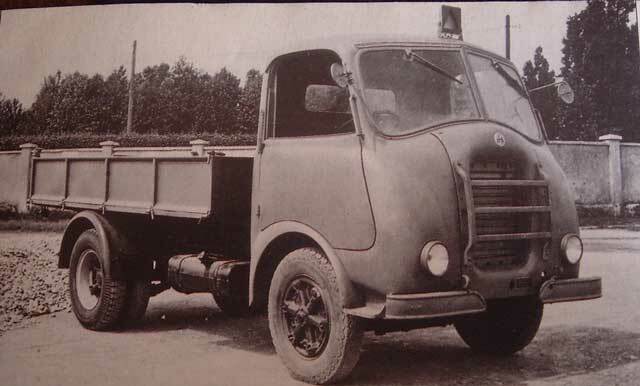 About 1947 the Model 800 was upgraded. 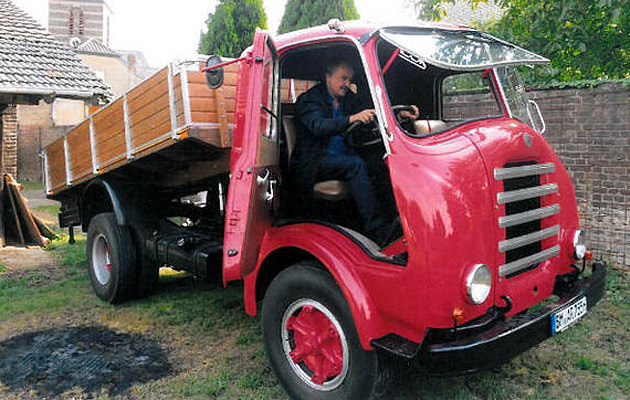 The new truck received 130-hp engine with capacity of 9,500 cm3 and the index 900. 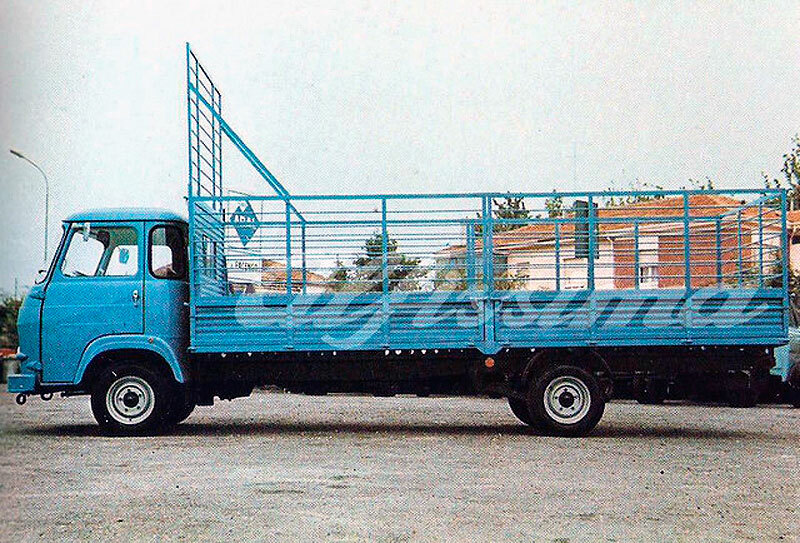 Carrying capacity of the new truck increased to 9 tons. 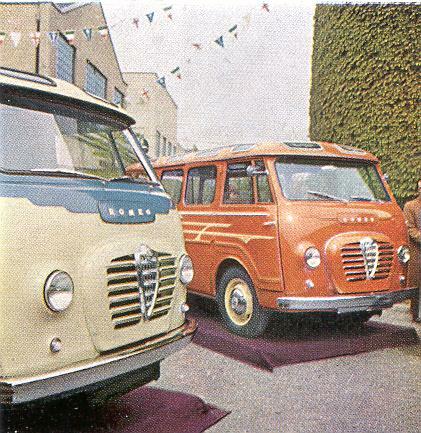 But externally, the old and new models were almost identical. 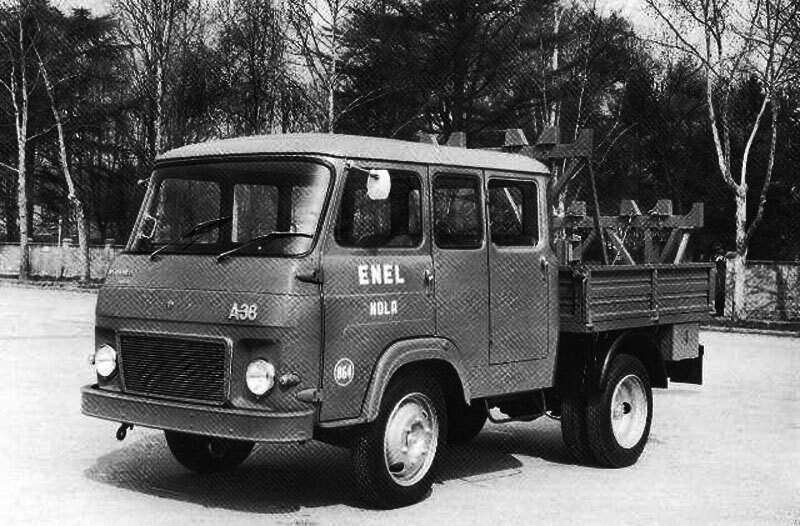 The 900 range included tri-axle model with 6×2 wheel configuration and rear drive-able axle. 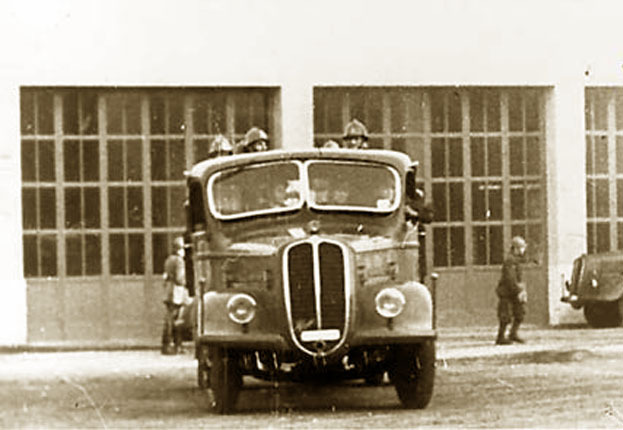 Production of civilian version of the Alfa Romeo 800 began after the World War II. 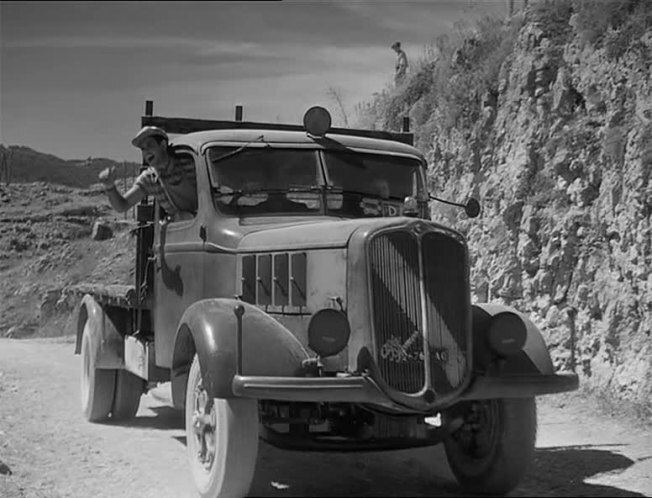 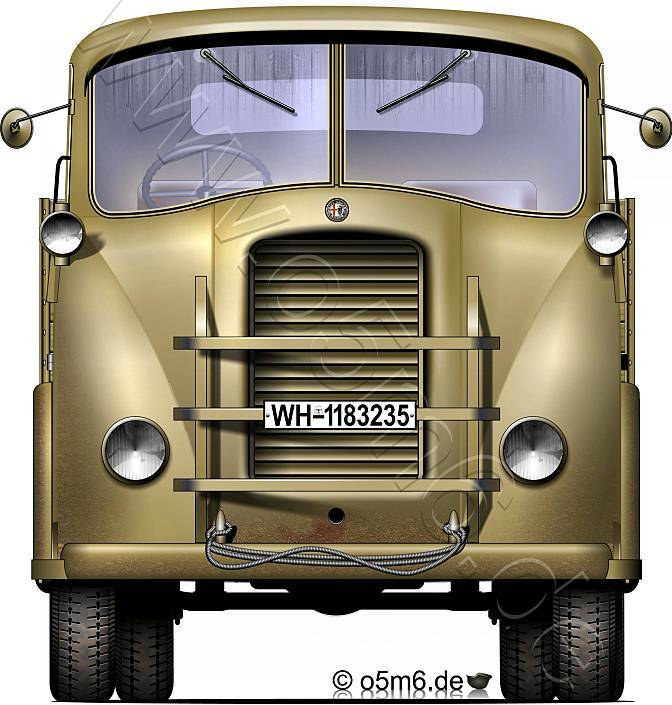 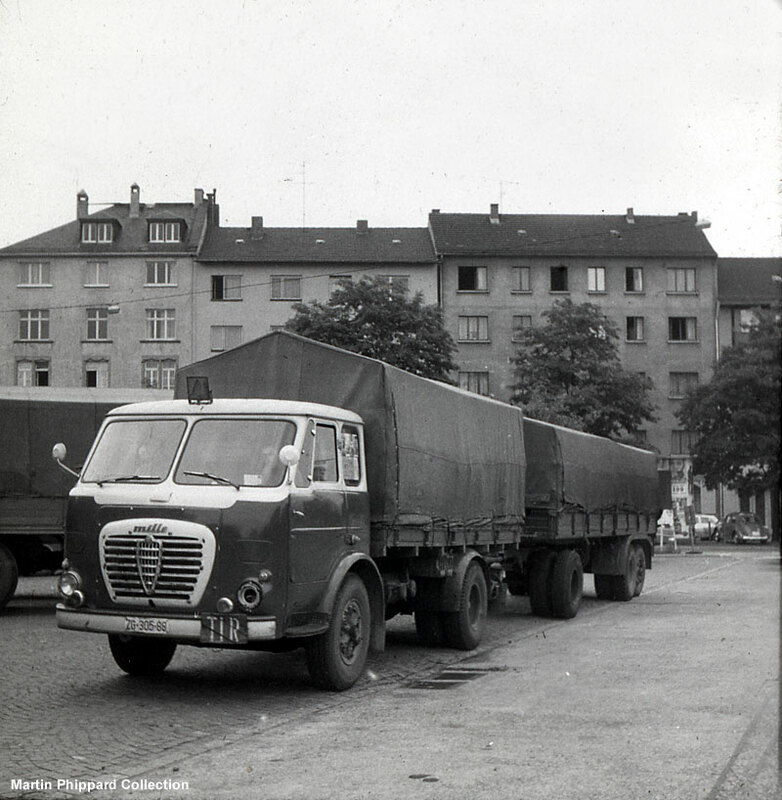 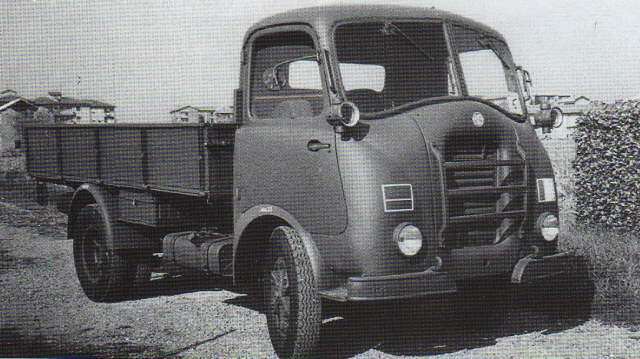 The civilian trucks got the grille with 5 horizontal bars (but the first civilian truck had the fine mesh or similar to military trucks 800RE grille) and extended cab for better comfort of the driver and passenger. 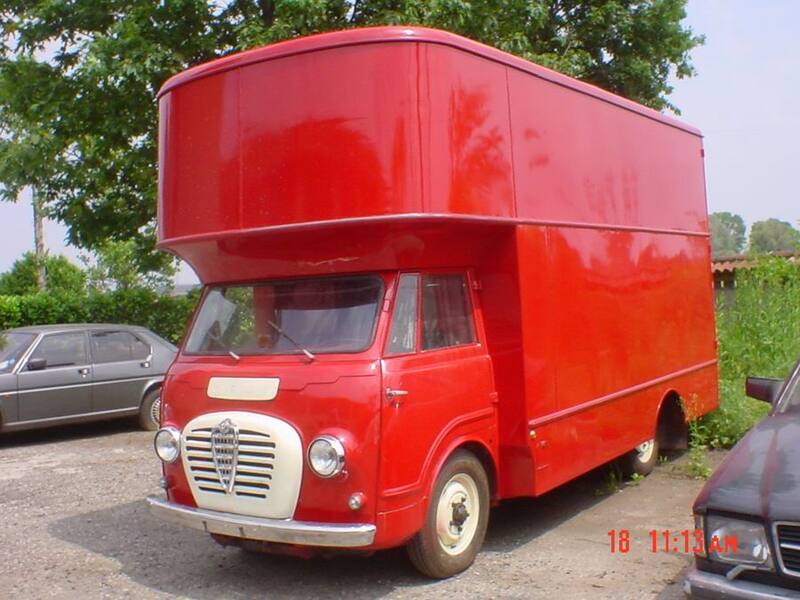 There was a version with sleeper cabin too. 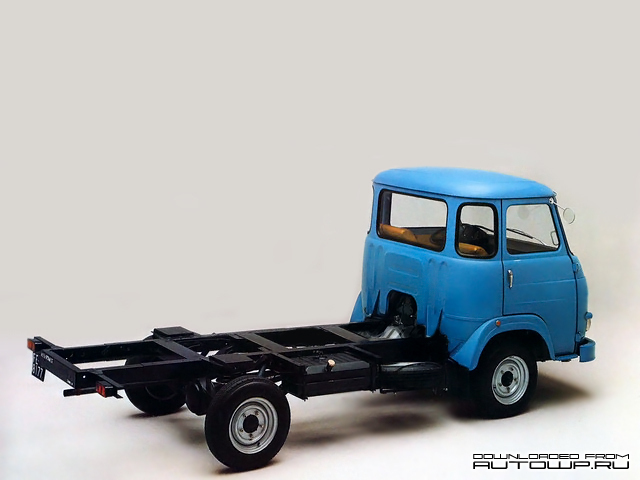 Soon, the Model 800 has been replaced by the Model 900 with a more powerful engine. 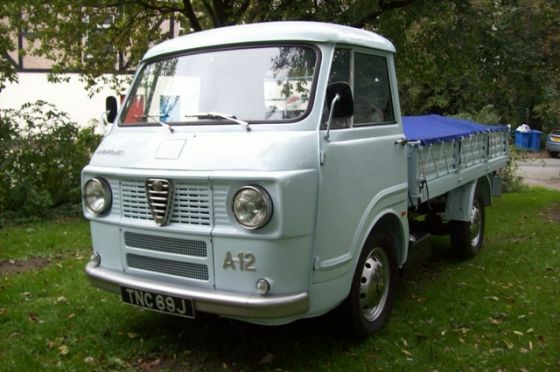 Alfa Romeo Model 450 was the successor of the Model 430. 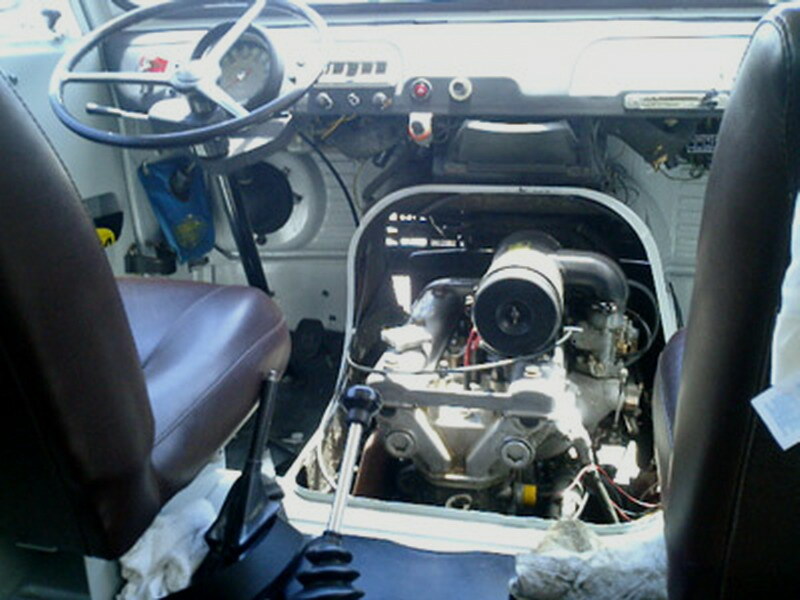 The main difference is the engine of 90 hp (instead of the 80 hp of the Model 430). 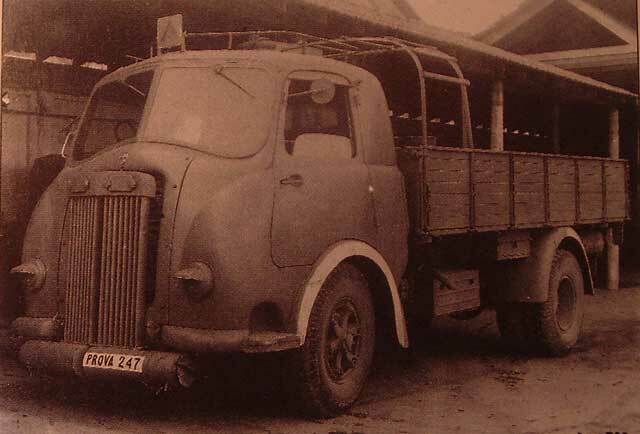 The radiator grille now has 5 horizontal bars instead of three on the Model 430. 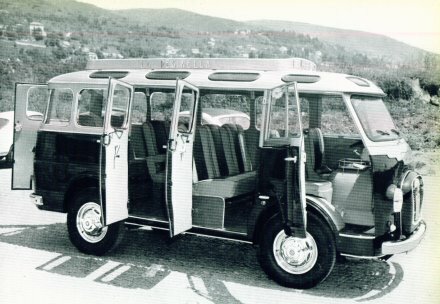 The cabin was lengthening in the back and became more spacious. 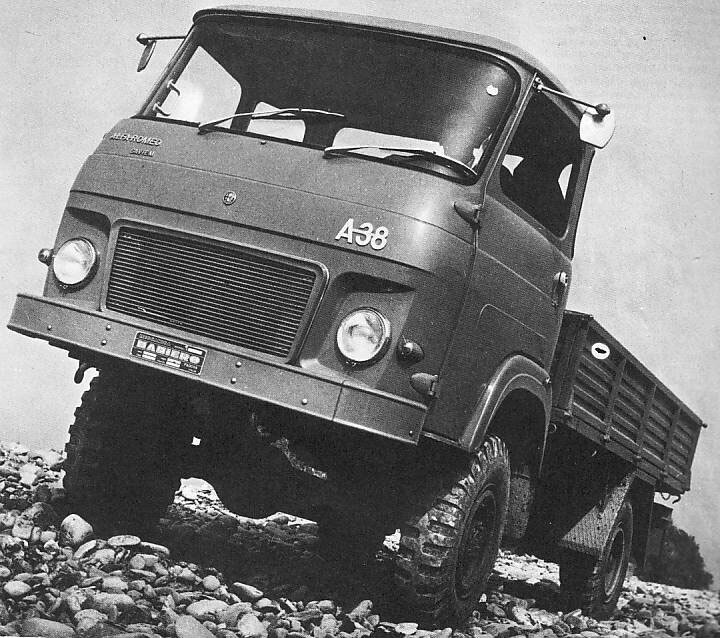 There was all-wheel drive version with a 4×4 axle configuration also. 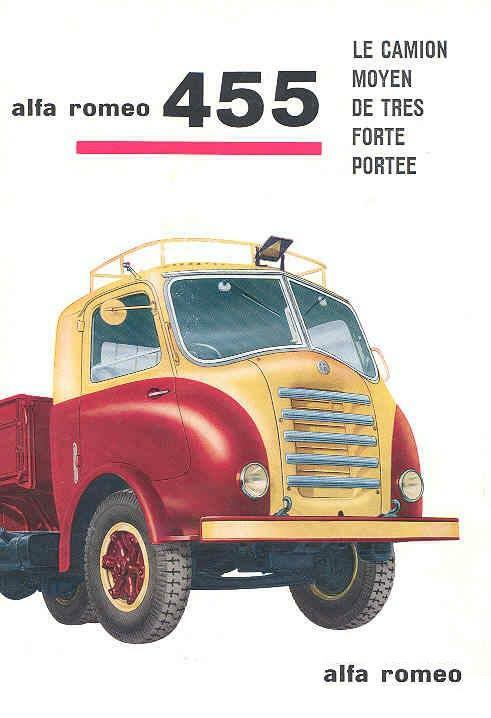 In the late 50s truck has been updated and the model index became 455. 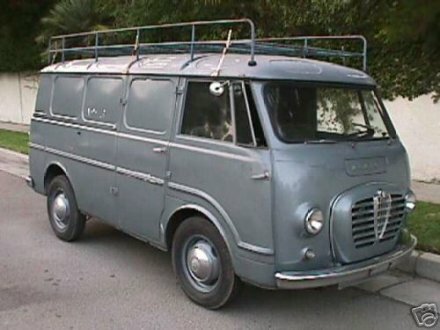 This model was produced until the early ’60s. 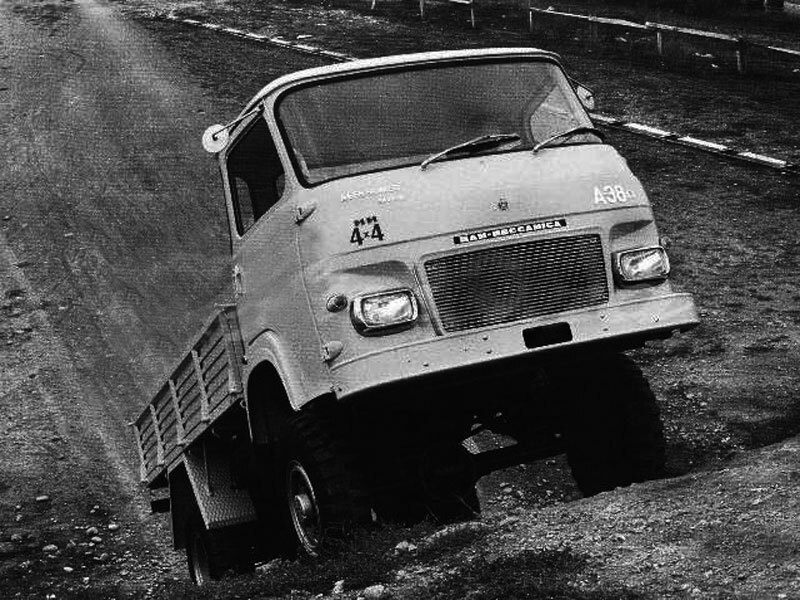 There was many different aftermarket bodies on the chassis of 450 / 455, including all metal vans. 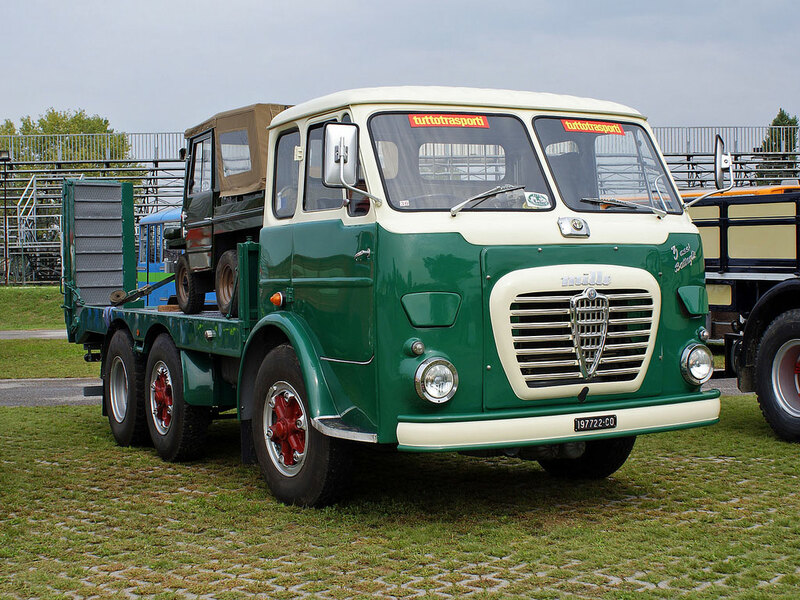 At the begins of 40th Alfa Romeo stopped producing and developing of conventional trucks and focused on a new cab over series 430 and 800. 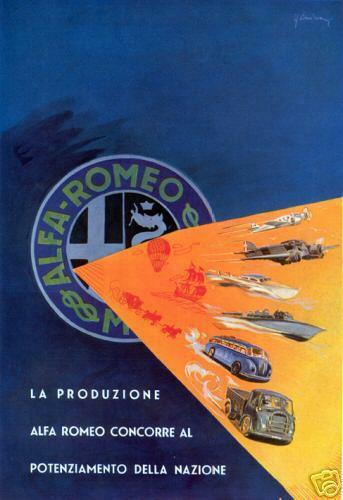 After the War Alfa Romeo began producing of commercial version of military model 430RE. 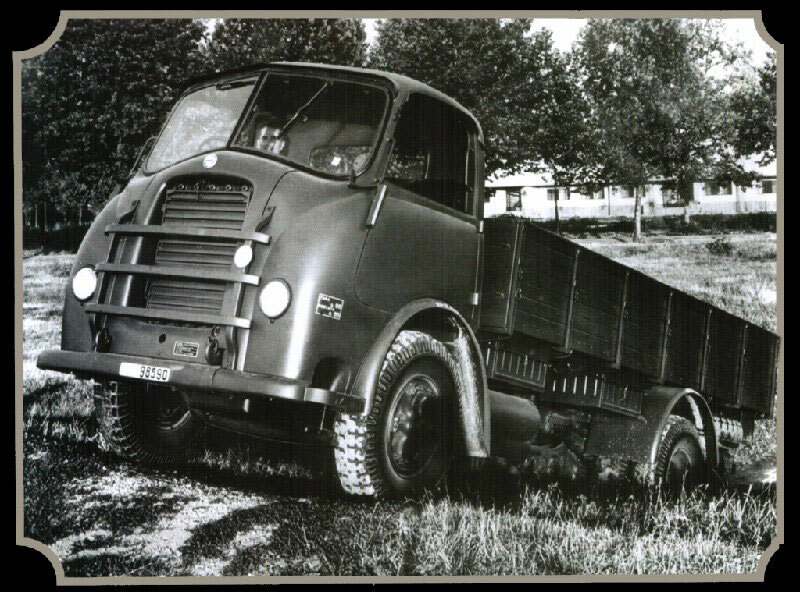 This 5-ton model 430 was equipped with a 4-cylinder diesel engine producing 80 hp and 4-speed transmission with two-speed transfer gearbox. 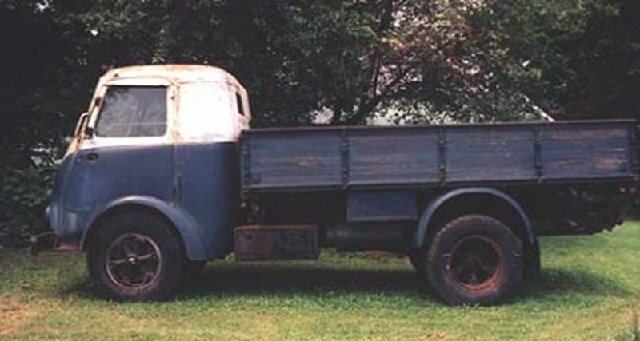 The doors of 2-place short cabin were opened counter-movement of the truck, and the front grille was made of three horizontal bars. 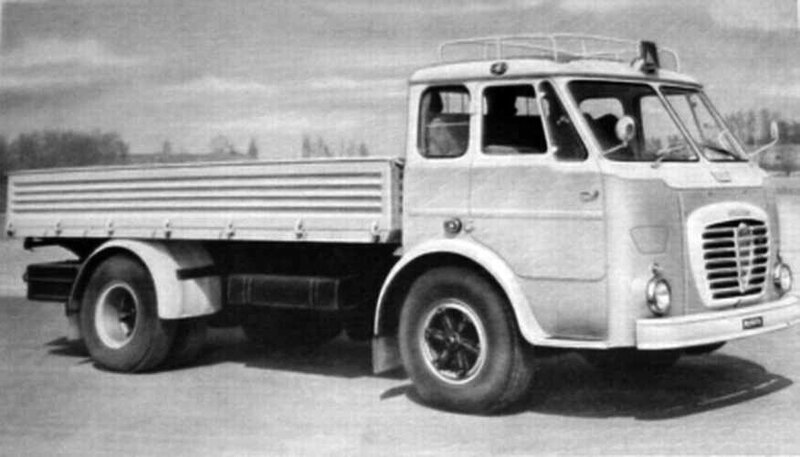 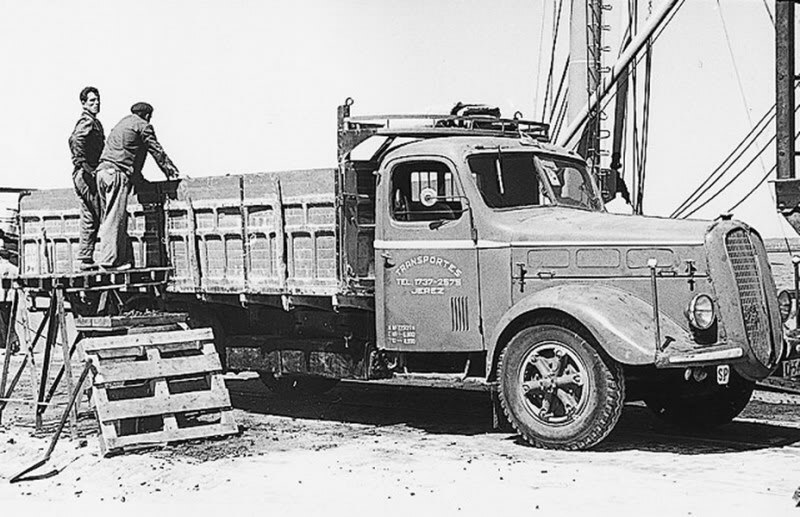 The model 430 was produced as a chassis, flatbed truck or truck tractor with 4×2 axle configuration. 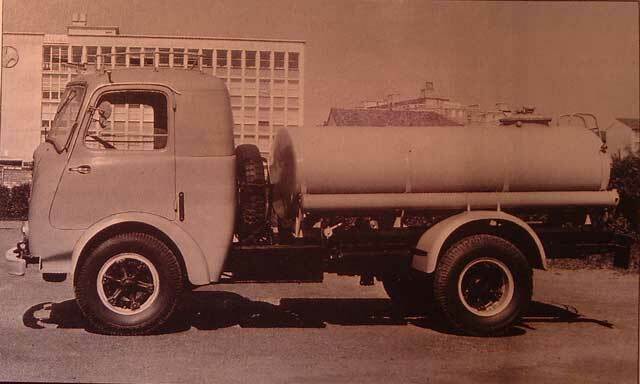 In the late ’30s a new 3-ton model 500 was presented, which probably replaced the Model 350. 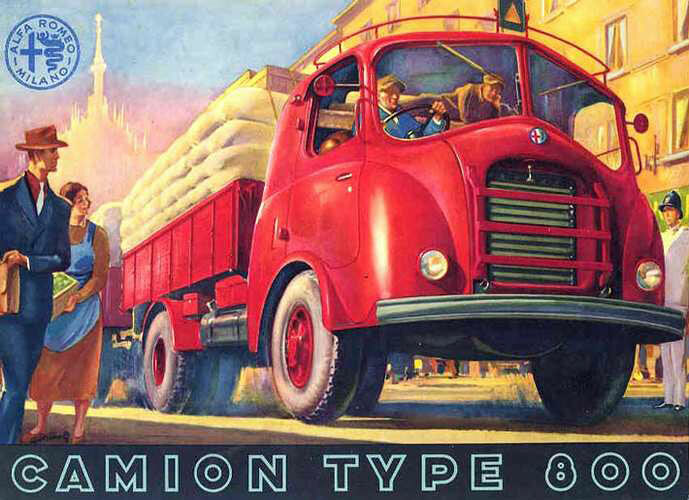 The trucks in this series were really beauties with streamlined cabin, hood and fenders. 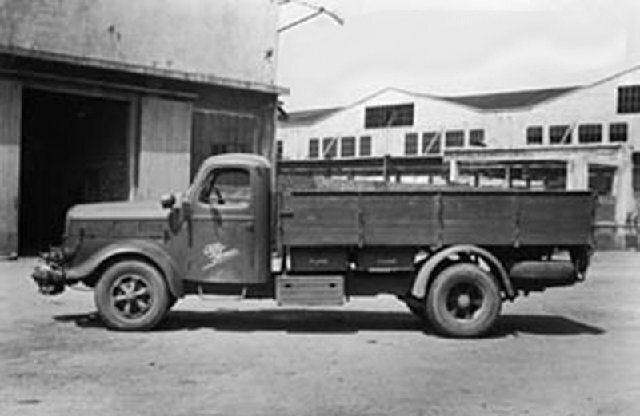 At the first Model 500 trucks the grille was vertical and fenders have standard shape. 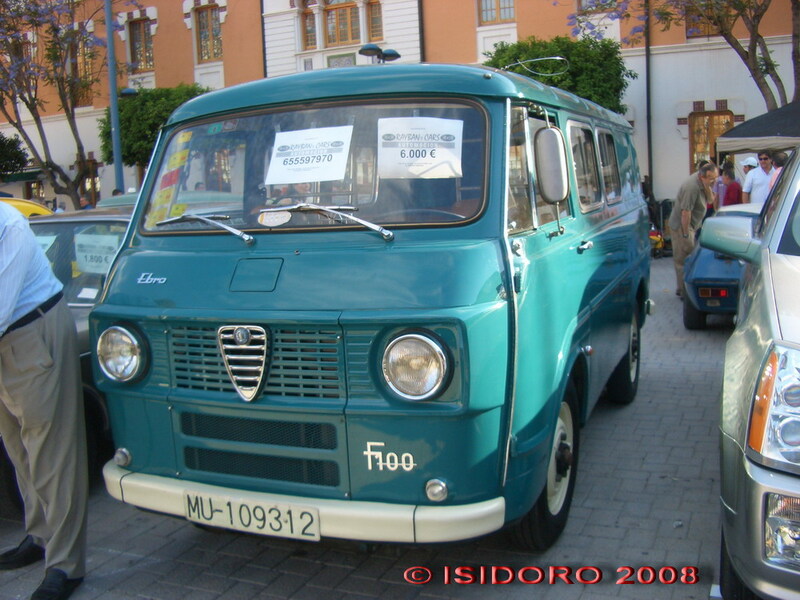 But soon, the grille was placed at an angle, it became convex, and the front fenders received a streamlined shape. 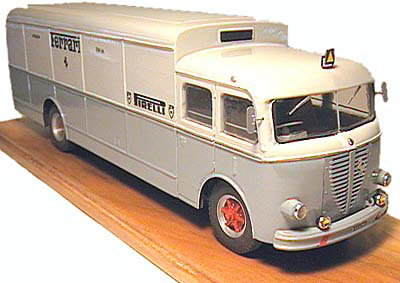 This model was popular in the army during World War II. 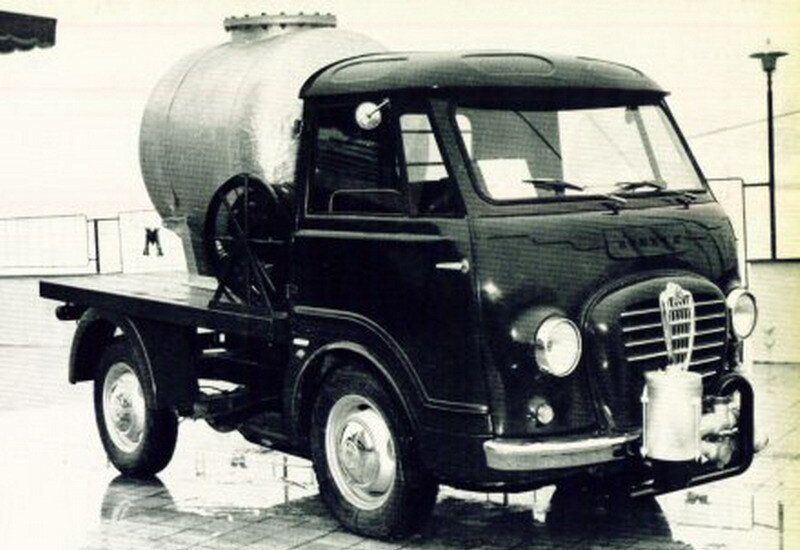 Along with petrol and diesel versions, the gas-generator 500BR model was produced. 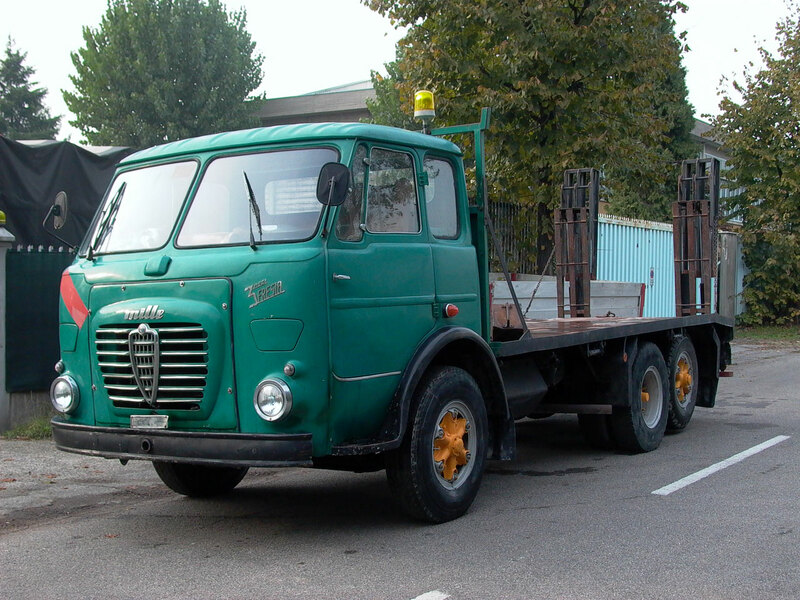 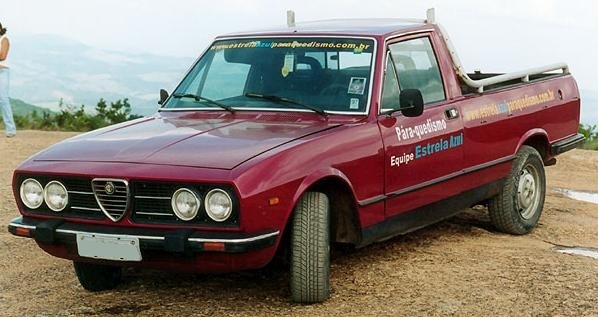 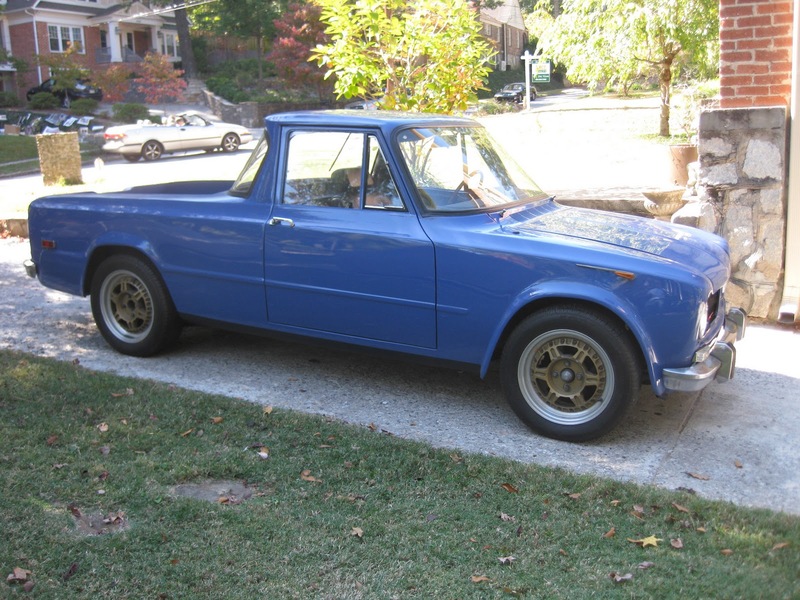 The Series 500 became the last conventional Alfa Romeo’s truck. 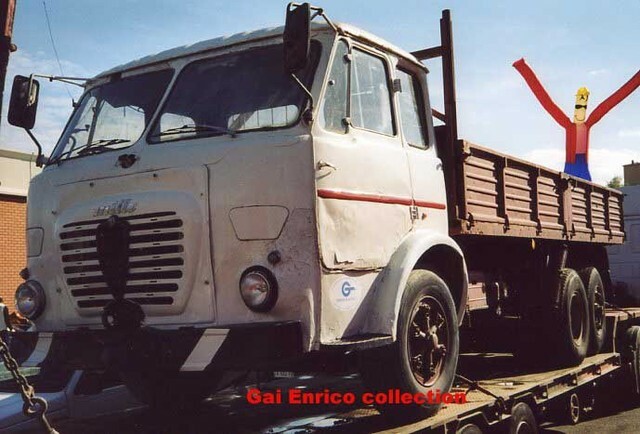 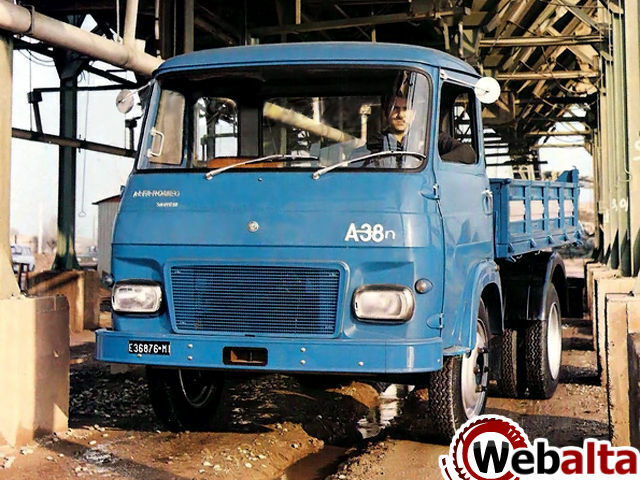 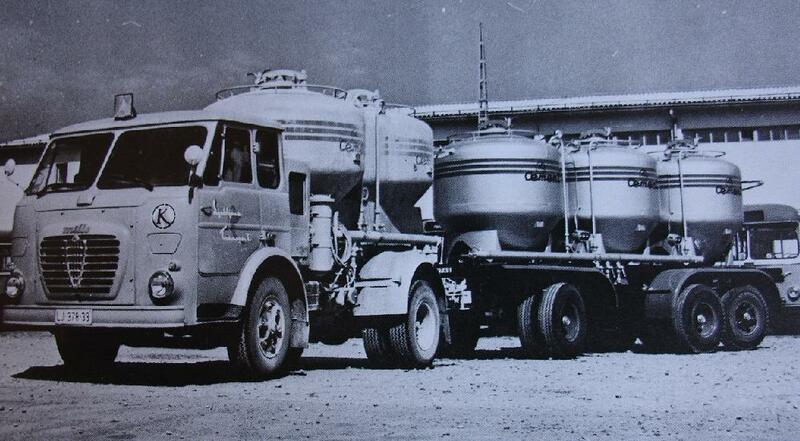 Since begins of 40ies the company concentrated on a producing of cabover trucks. 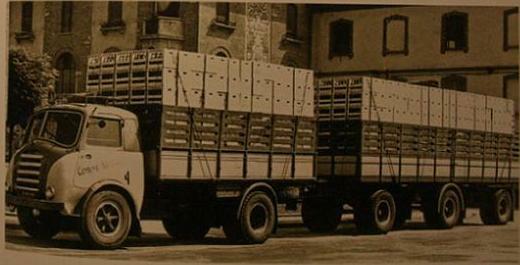 Heavy and expensive trucks, such as the Model 85 or 110, could not find a proper demand in Italy. 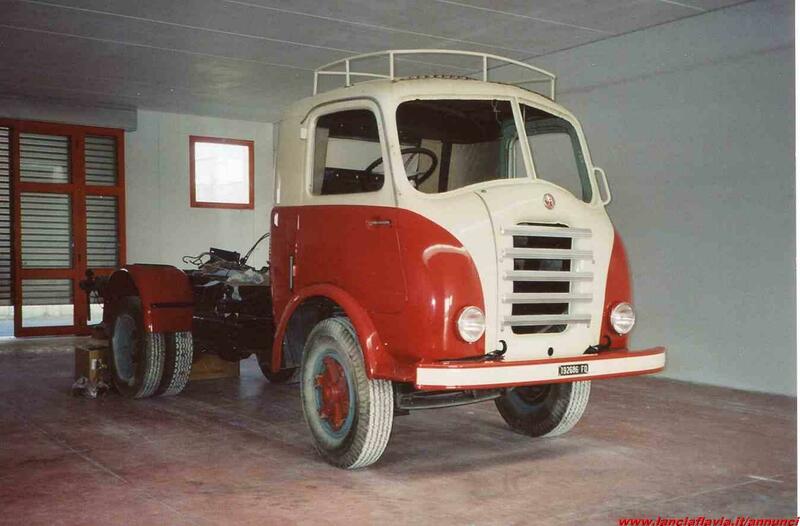 That is why in 1935 the Alfa Romeo company introduced a lighter four-ton the Model 350, which was equipped with a new 6-liter diesel engine with an output of 85 hp. 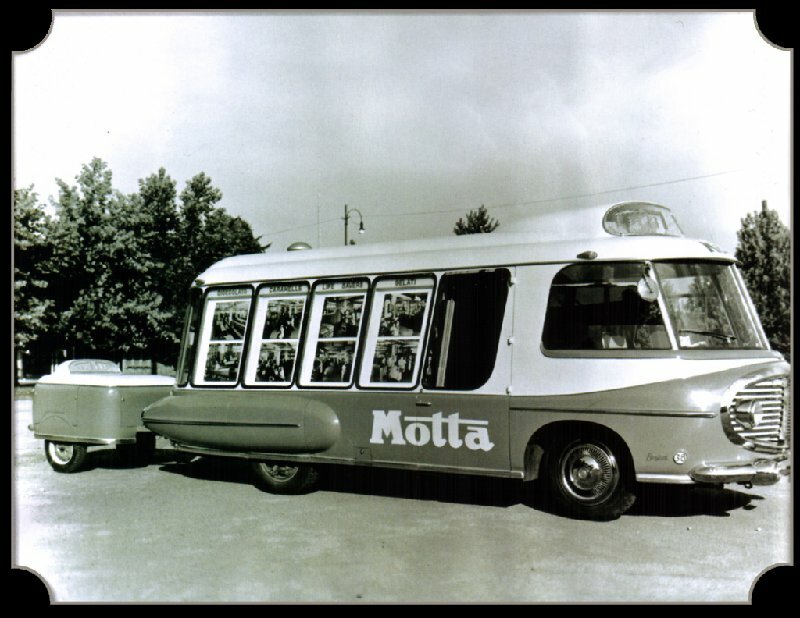 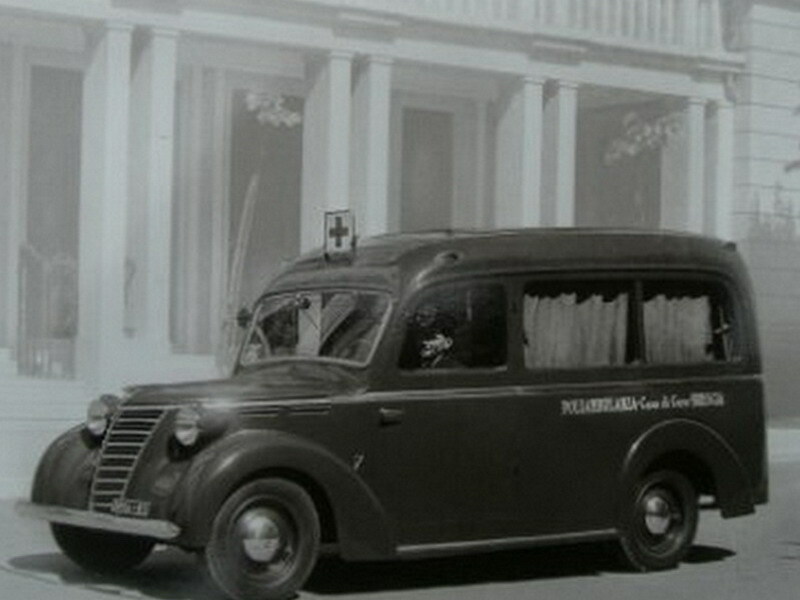 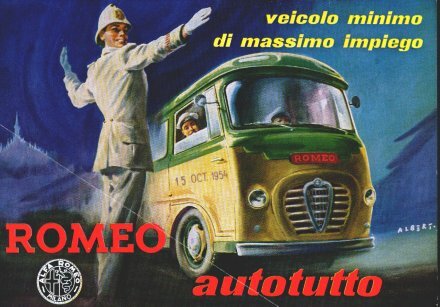 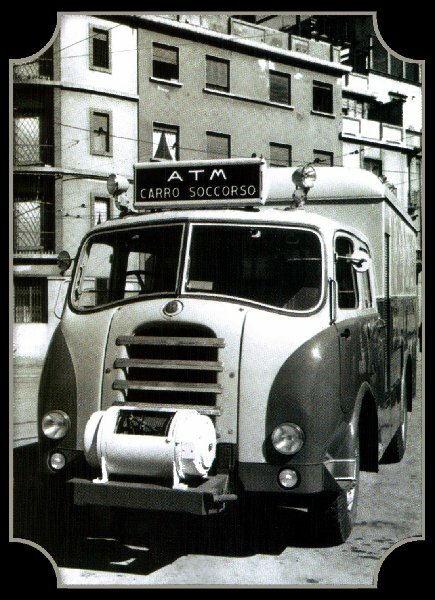 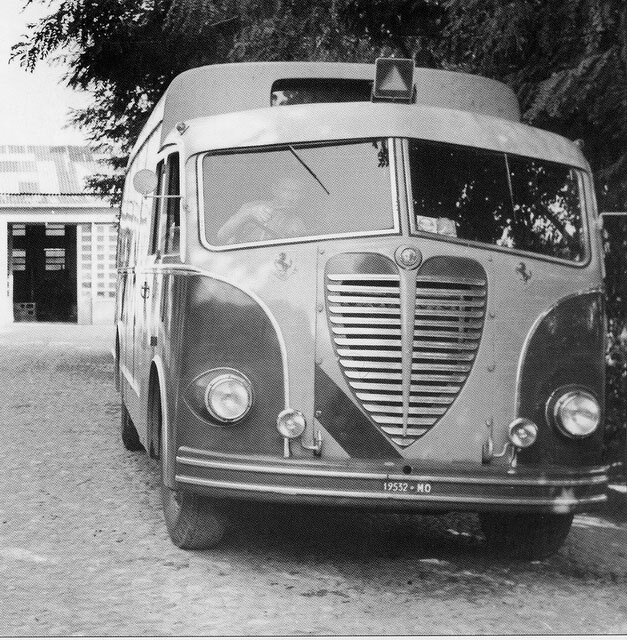 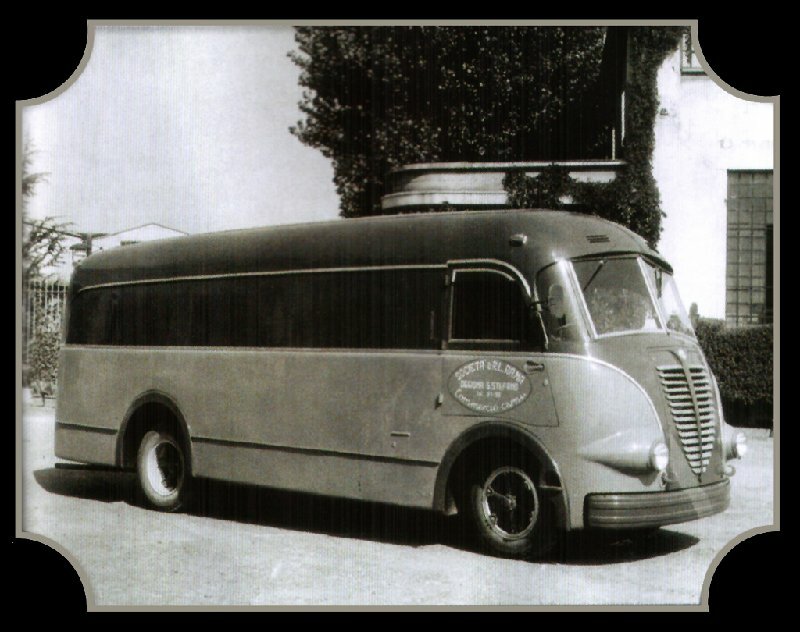 Since 1934 produced an updated version of the licensed Bussing truck with a streamlined cabin and radiator grille in the style of Alfa Romeo. 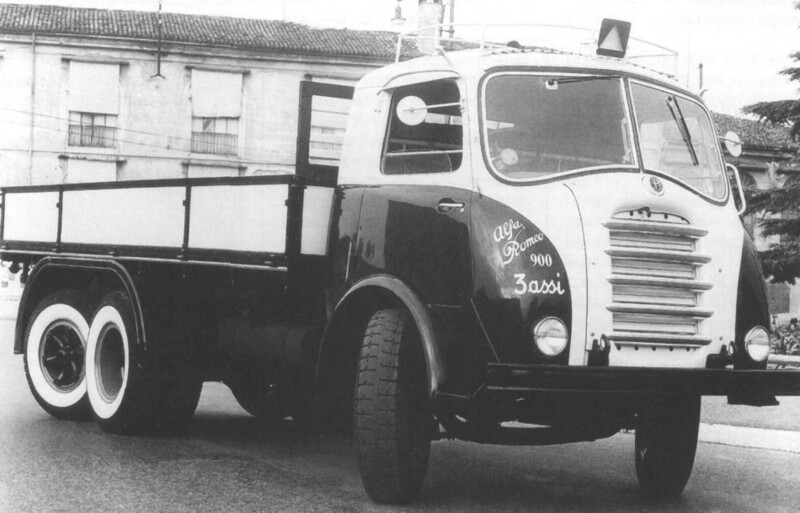 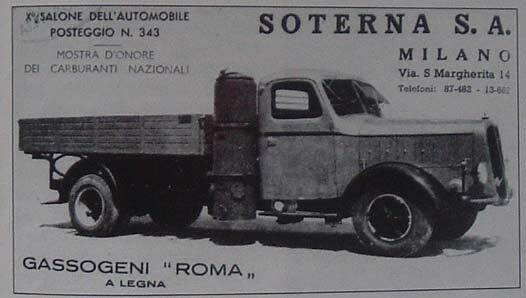 This 5/6-ton truck got an index “85” and was equipped with 11,560 cc engine from the Alfa Romeo “80” Model, which developed 110 hp. 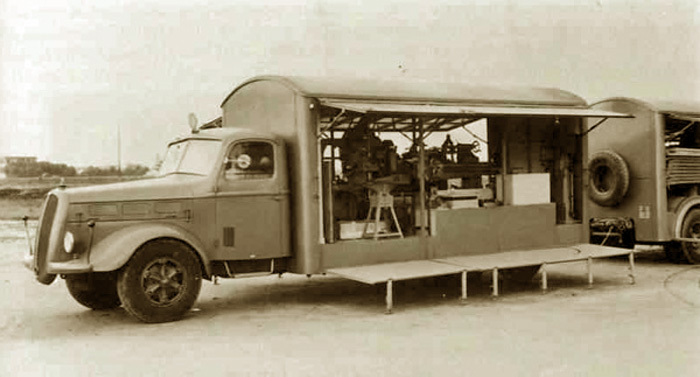 In 1935, the gas generator version “85-G” was presented. 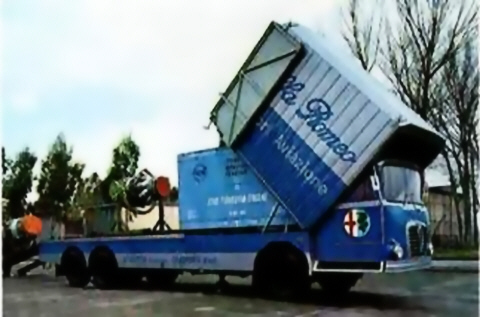 It won the race on the route of Rome-Brussels-Paris. 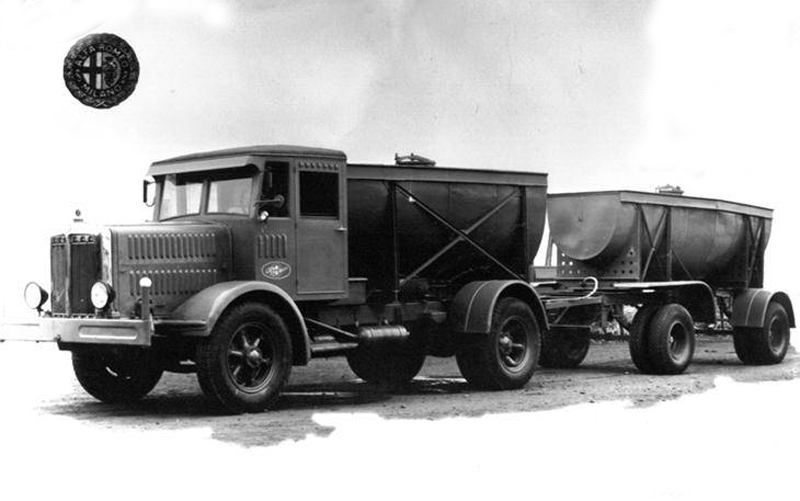 In 1938, 10-ton tri-axle model “110” was showed. 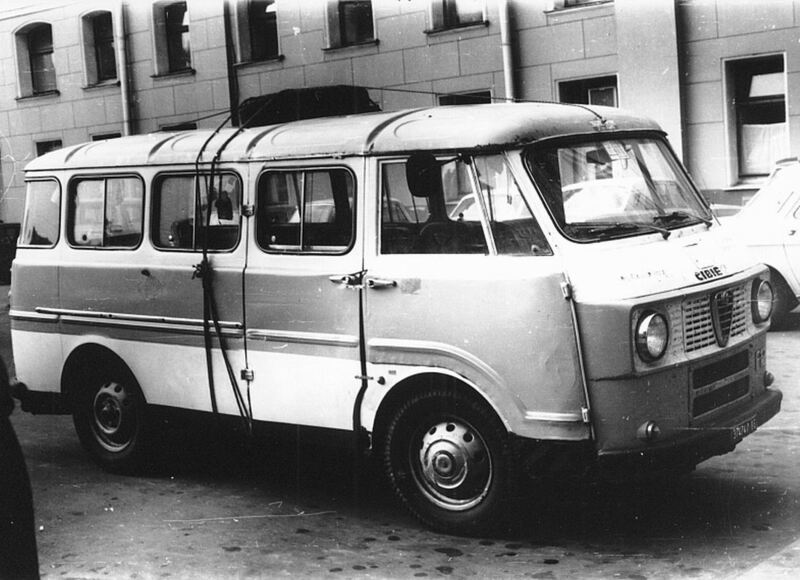 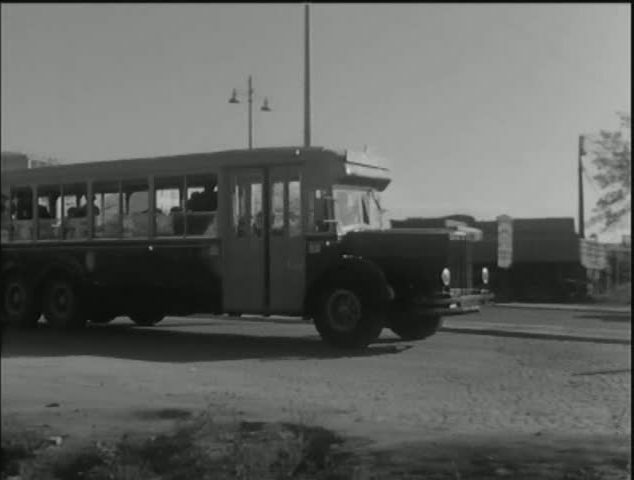 It was equipped with 125 hp engine and became the basis for large city buses. 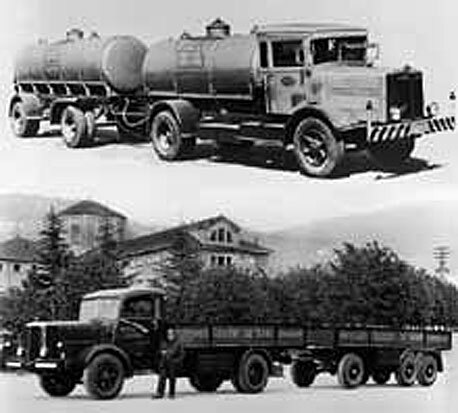 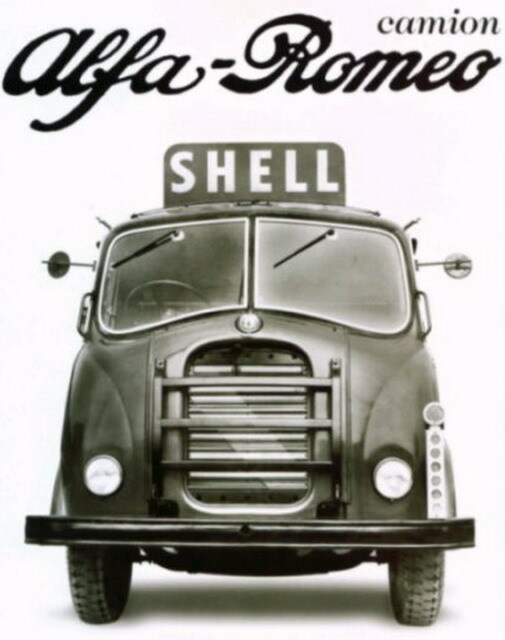 1929, autumn, the Alfa Romeo company enters into an agreement with the German Bussing and Deutz companies about the licensed production of heavy trucks and engines for them. 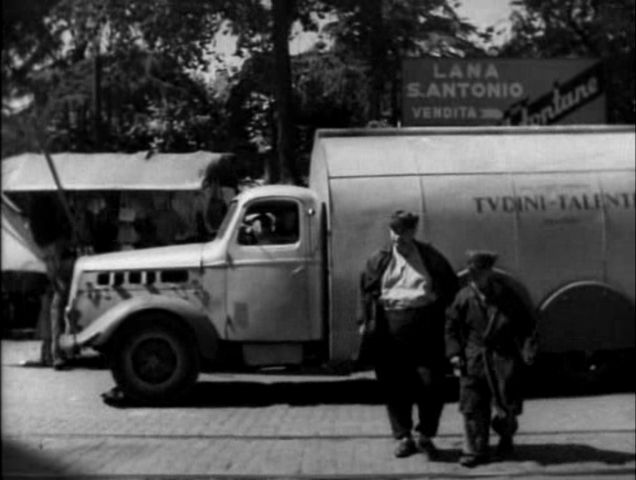 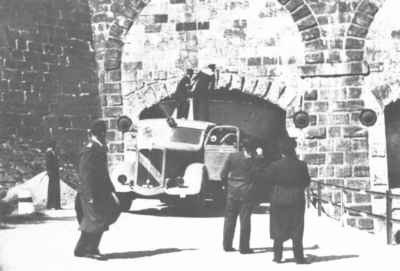 In 1931, the first truck Alfa Romeo – the Model 50 “Biscione”, a licensed copy of the German truck Bussing-NAG 50, came out from the factory’s doors in Portello, near Milan. 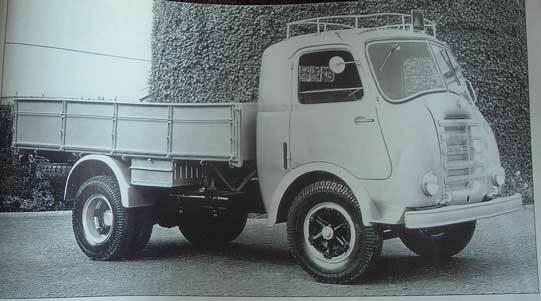 It was a two-axle 5-ton truck with a 6-cylinder diesel engine of 10,600 cc (Model F6M217) with 80 hp at 1200 rpm. 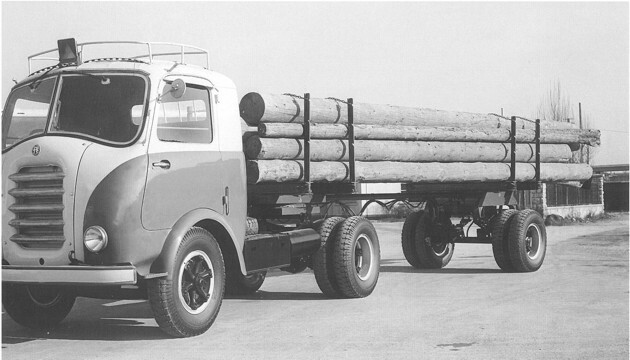 It had a wheelbase of 5200 mm, a length of about 8950 mm and width of 2450 mm. 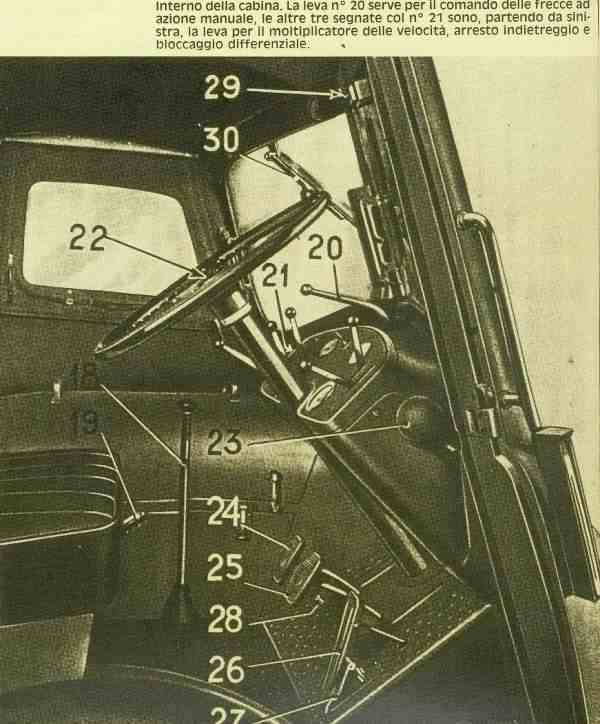 Transmission was manual 4-speed. 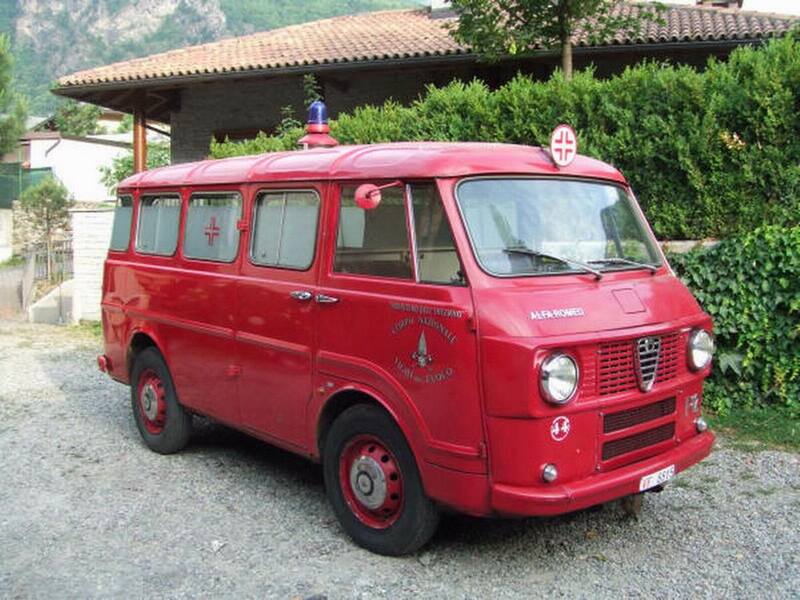 Alfa Romeo 50 “Biscione” could move at a maximum speed of only 33 km/h. 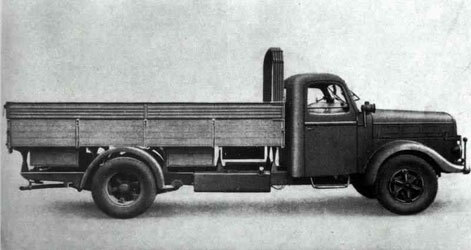 The angular design of the cabin and hood was completely identical to the German truck. 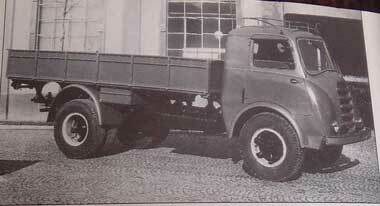 Later in the production was launched a tri-axle 6-ton model “80” with the 11,560 cc engine, which developed 110 hp. 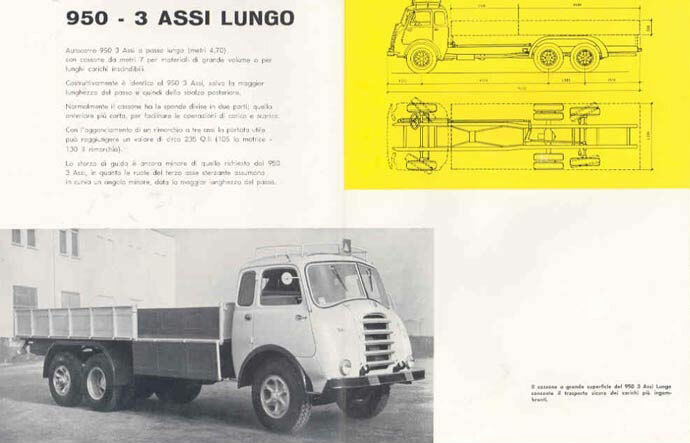 According to archival documents, totally 115 trucks of the model “50” and 29 truck of the model “80” were built. 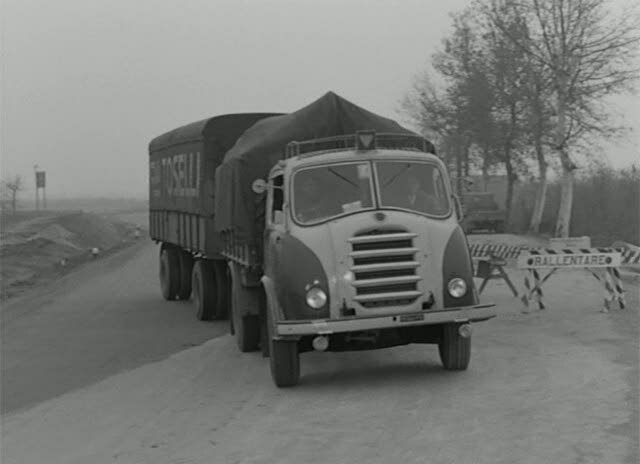 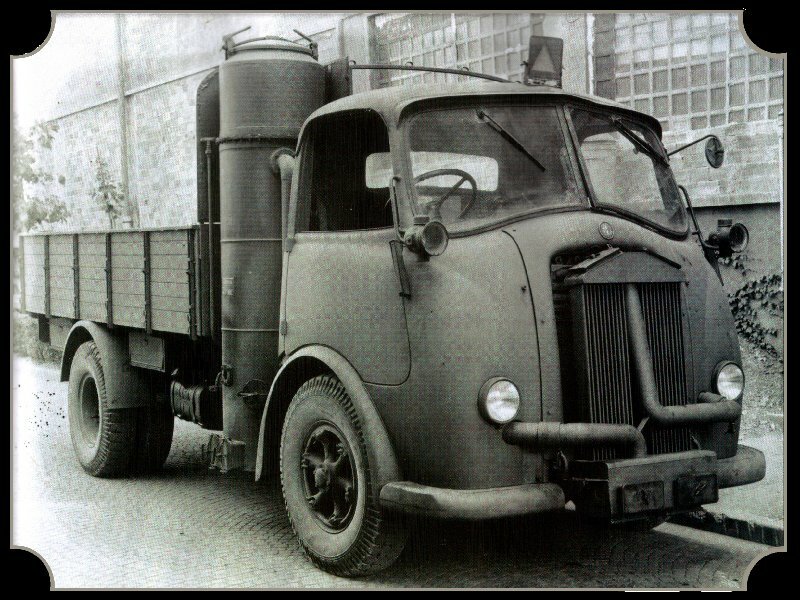 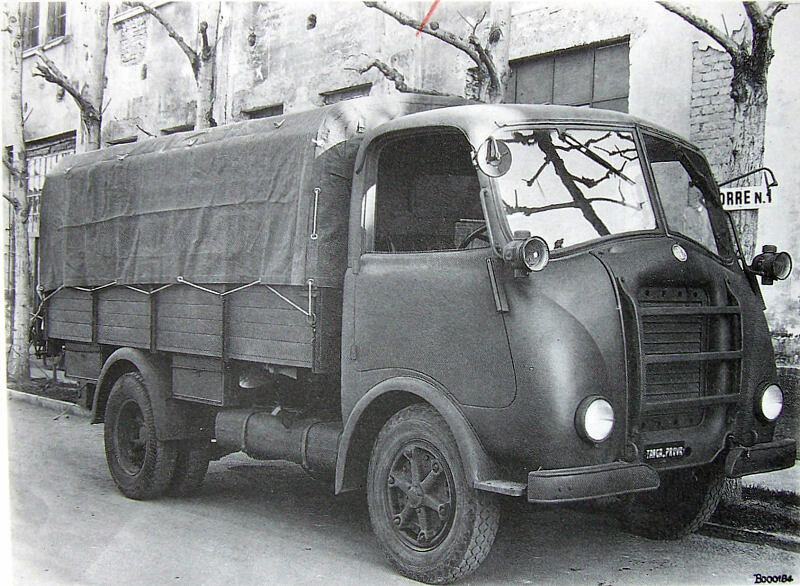 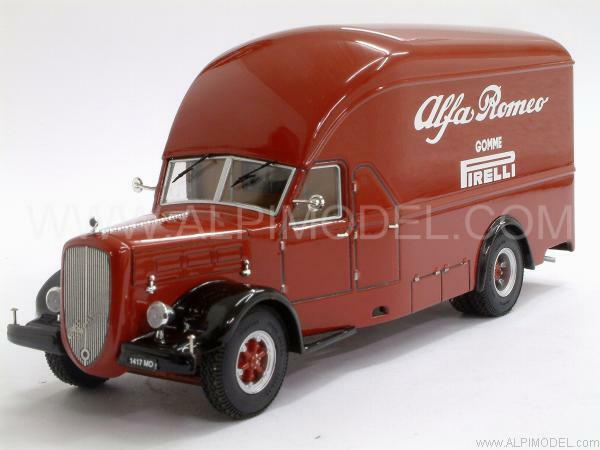 There was a prototype of a half track version of the Alfa Romeo 800RE cargo truck. 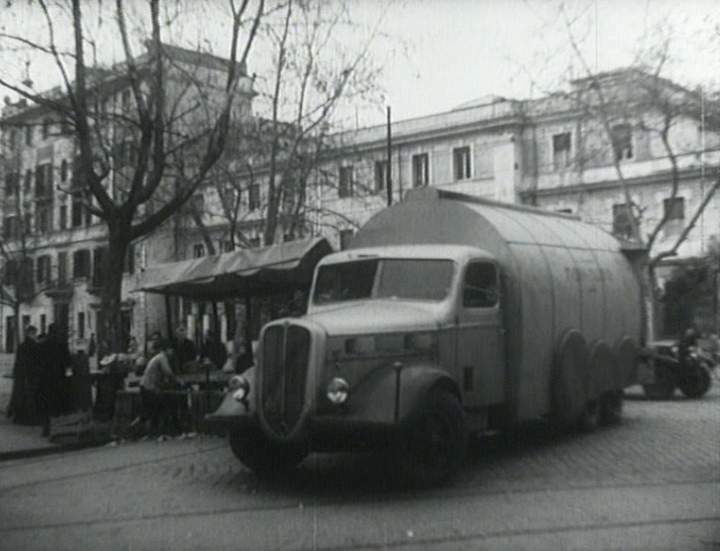 Details are lacking but there is evidence that this vehicle was known as CSEM (Centro Studi ed Esperienze della Motorizzazione – the Italian Army’s vehicle research and development organization). 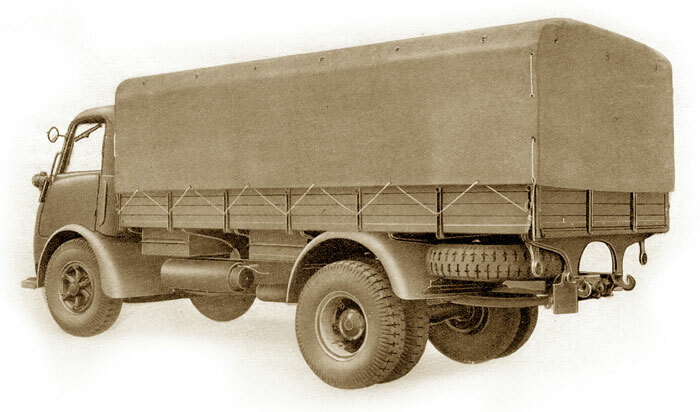 The commercial Model 430 was widely used in the Army during the World War II as a 4-ton military model 430RE with streamlined all-metal cab over the engine, which received the status of a standardized vehicle of the Italian army, and became the most beautiful truck of the World War II. 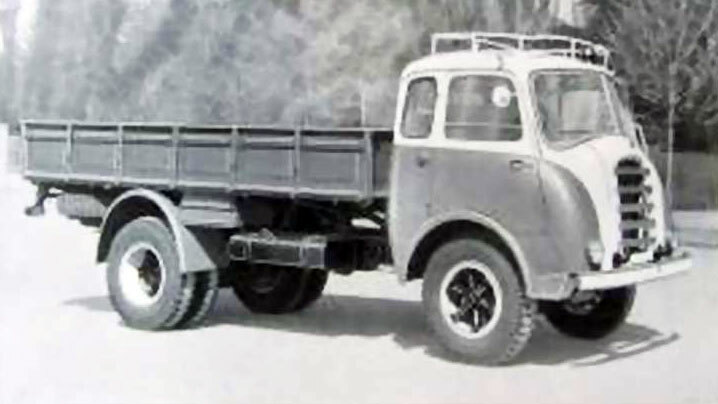 It was equipped with 80 horsepower, diesel engine 4-speed transmission with 2-speed transfer gearbox, hydraulic brakes with vacuum booster, front independent spring suspension and 24-volt electrical equipment. 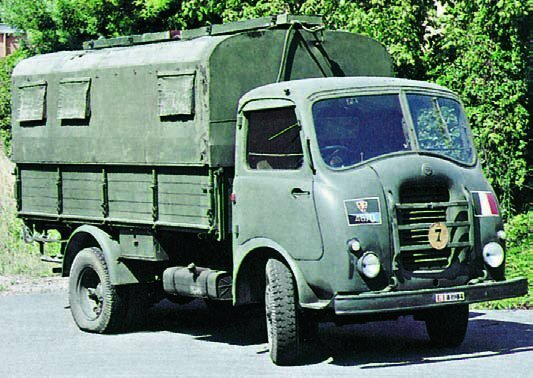 The truck could carry 16 soldiers and tow a trailer, and has a maximum speed of 66 km/h. 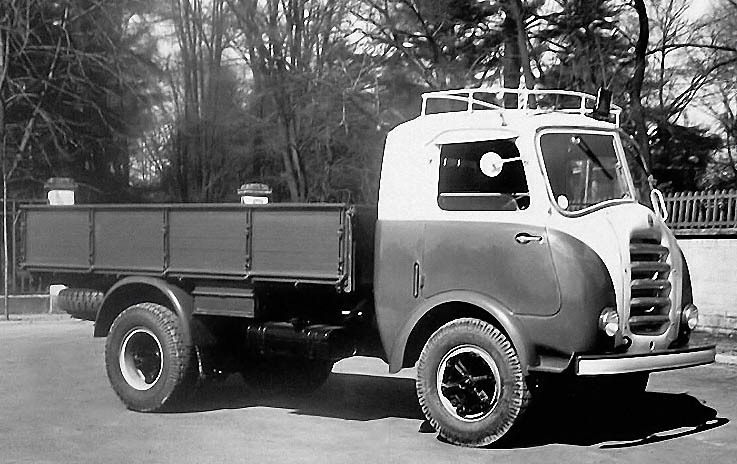 The Model 430RE was produced until 1950, in version CP50 with a short cabin and CM50 with an extended cabin. 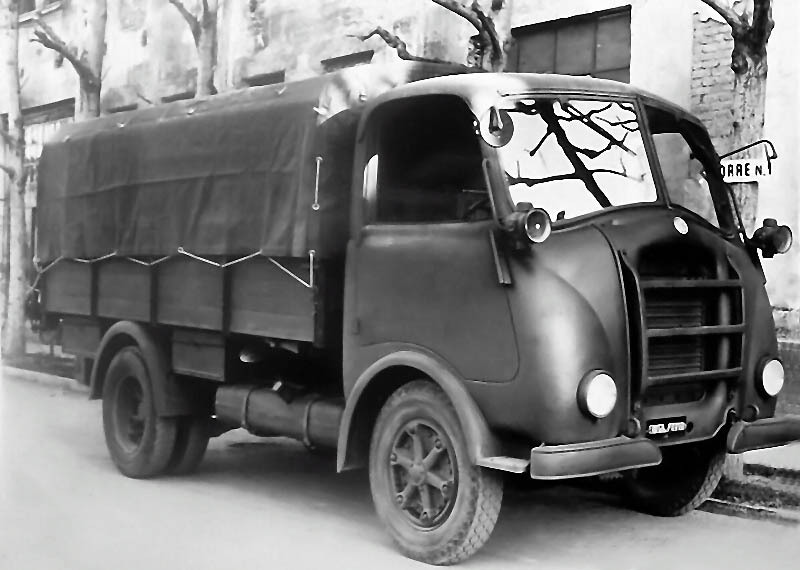 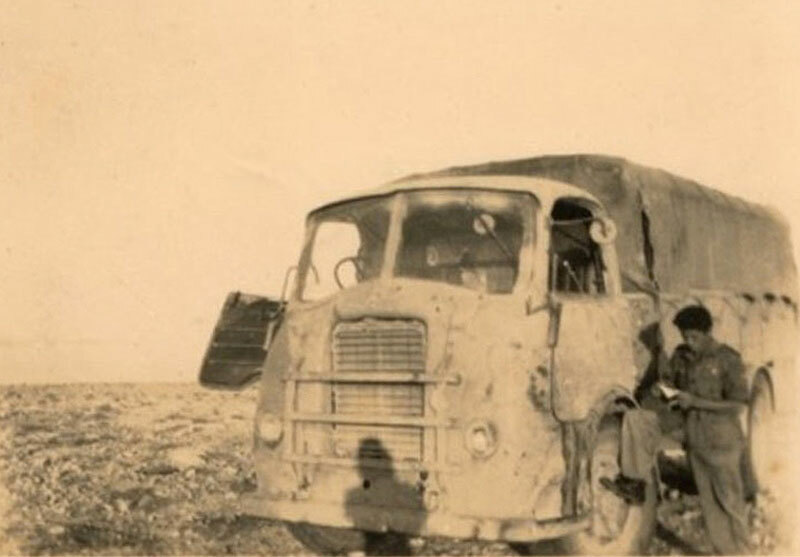 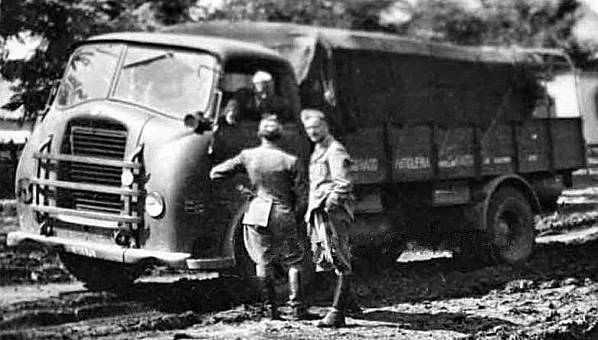 The 6.5-tons Alfa Romeo 800RE heavy diesel truck was produced between 1940 and 1943 and initially served only in the Italian Army (“Regio Esercito”), mainly in North Africa, Russia and occupied France. 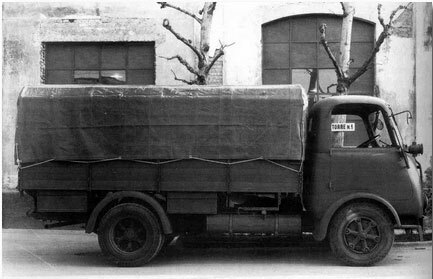 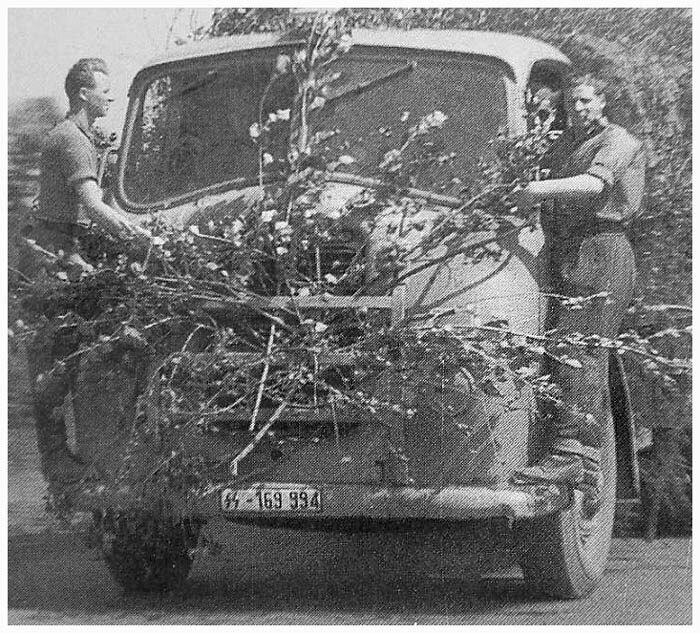 After September 8, 1943, the Italian surrender, the Germans captured and deployed many trucks under the designation “Lastkraftwagen 6,5 t Alpha (i) Typ 800 R.E.”, in Italy and abroad. 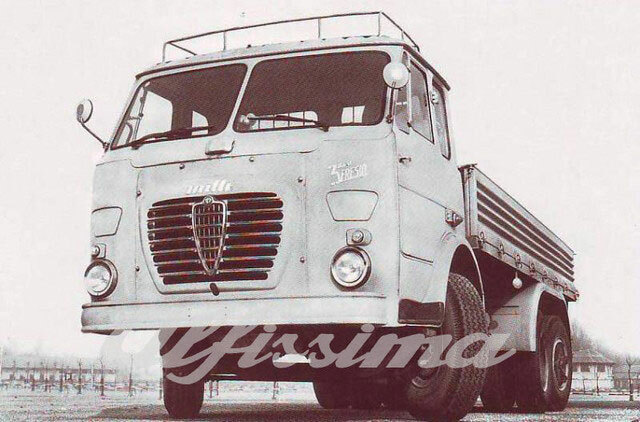 It was equipped with a new 8725 cm3 108 hp 6-cylinder diesel engine with direct injection and an additional 4-speed transfer gearbox in the transmission. 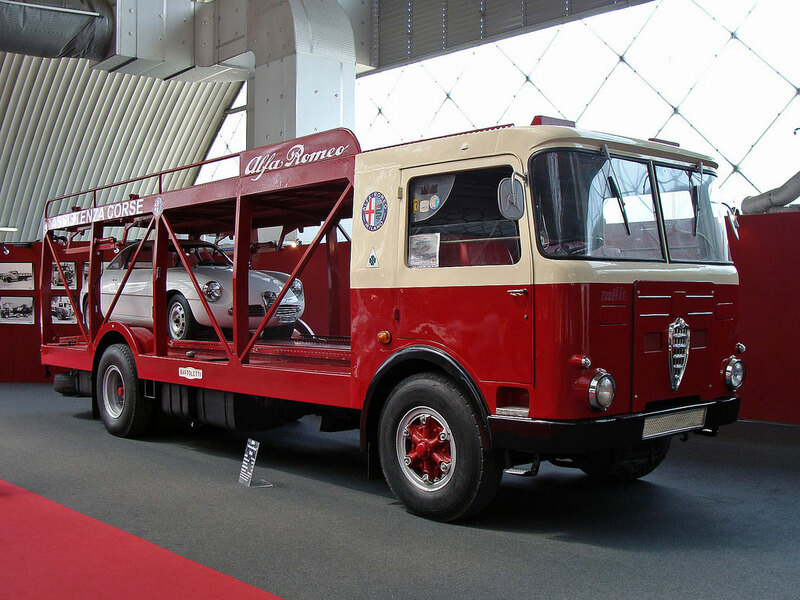 Alfa Romeo 800RE could reach 50 km/h of maximum speed. 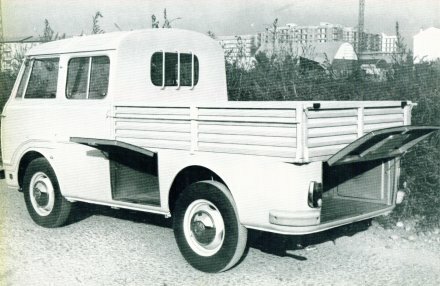 Some trucks had full doors rather than half doors. 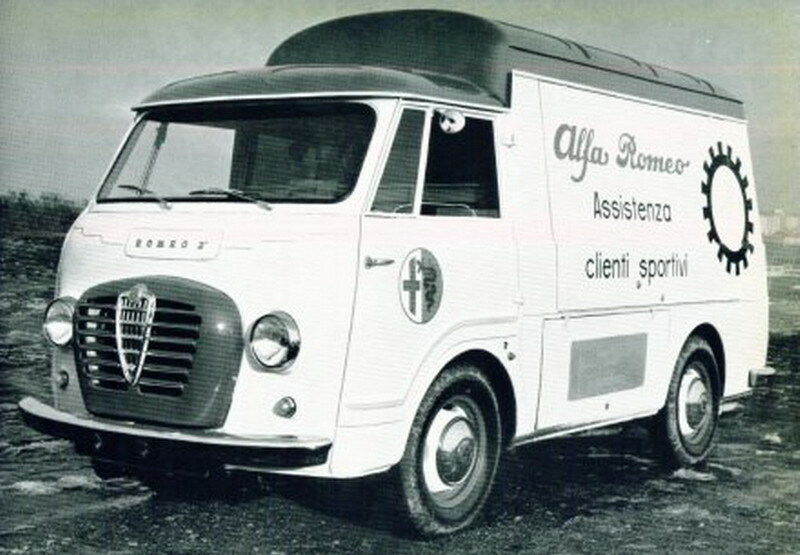 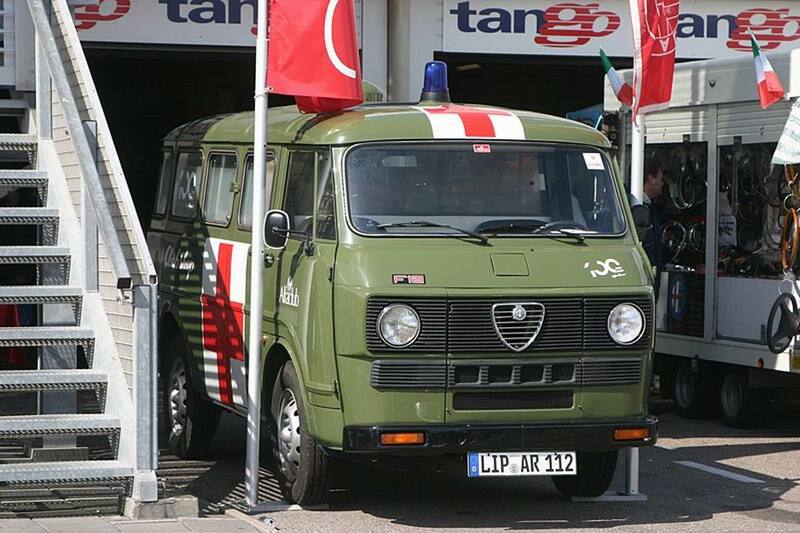 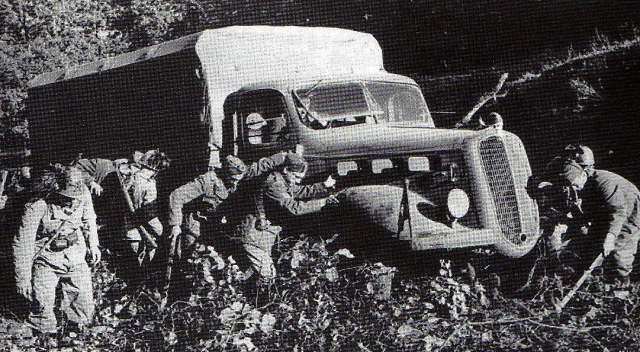 It was the most popular Alfa Romeo army truck of the World War II. 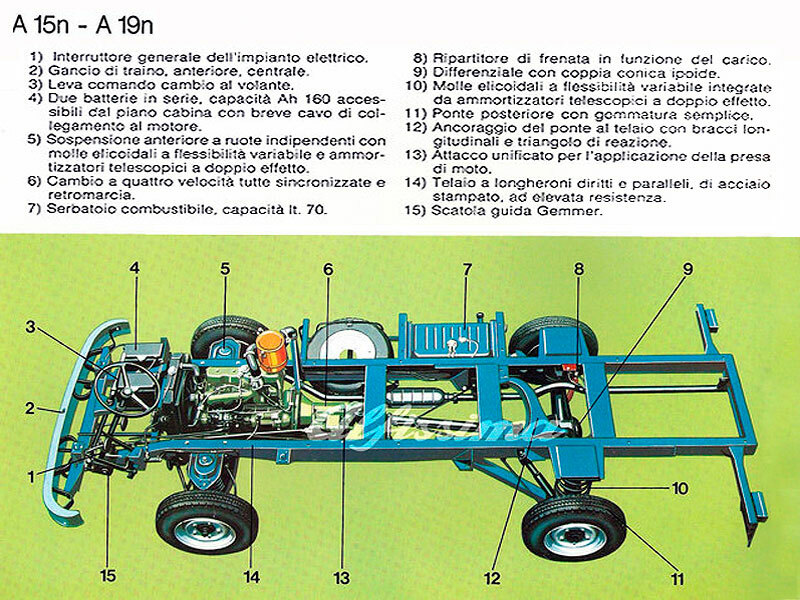 There was a gas-generator version too, which was made in small quantities. 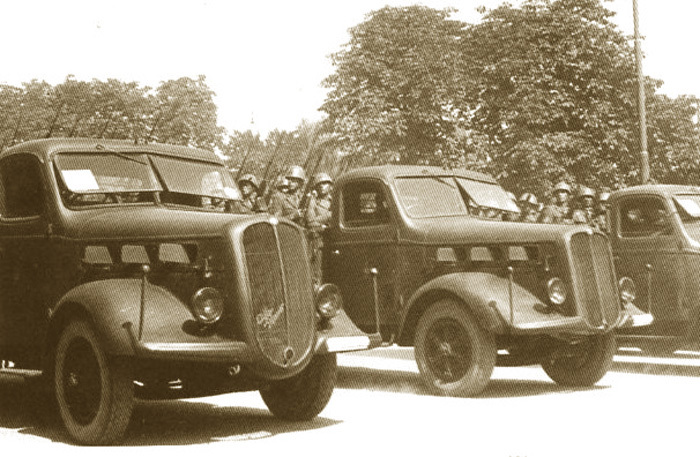 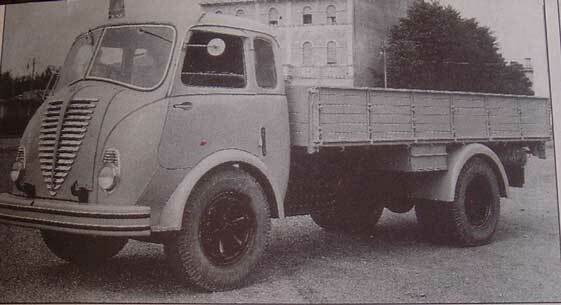 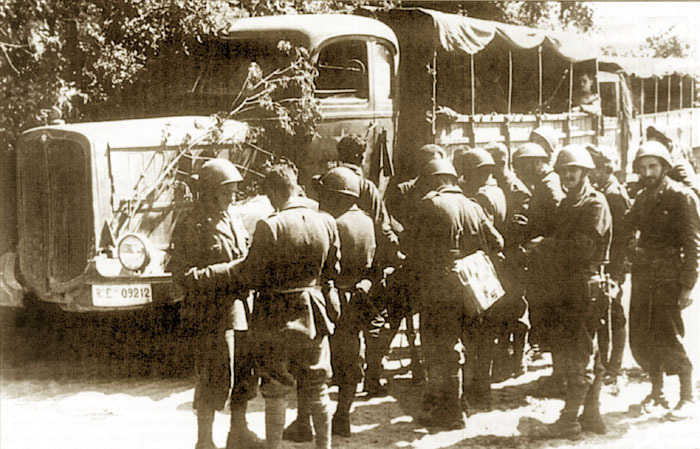 In 1939-44б Alfa Romeo produced military version of civilian 3-ton truck series “500”. 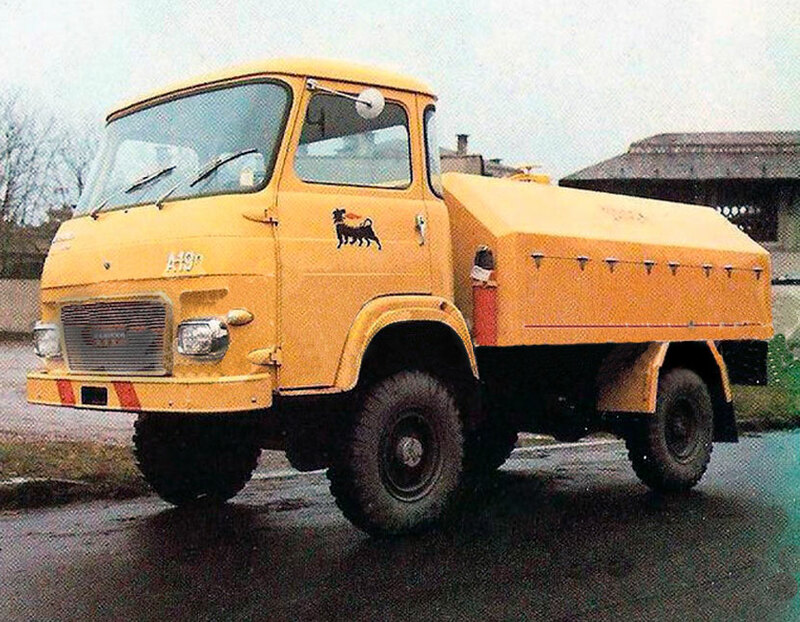 The range included diesel-powered 75 hp version 500RE, petrol version 500B and gas generator version 500BR. 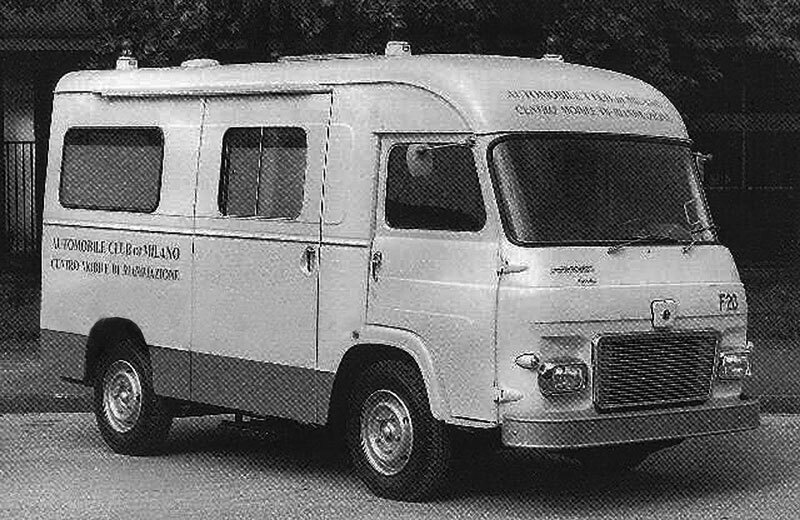 The staff buses 500DR were produced on its base. 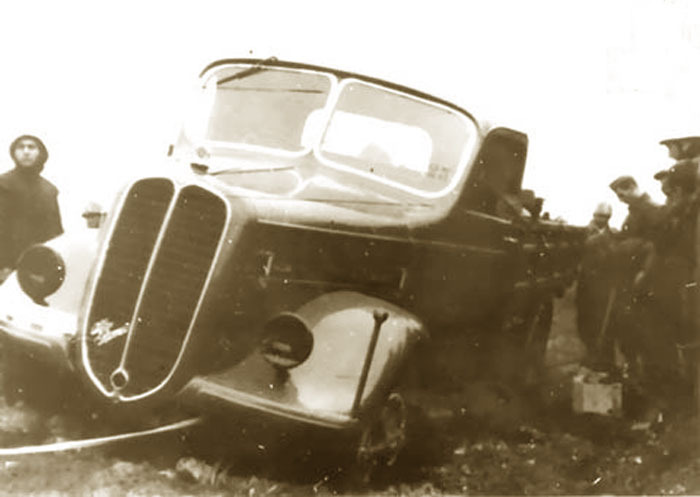 This special version of the Alfa Romeo Mille intended for transportation of aircraft engines, which produced by the company. 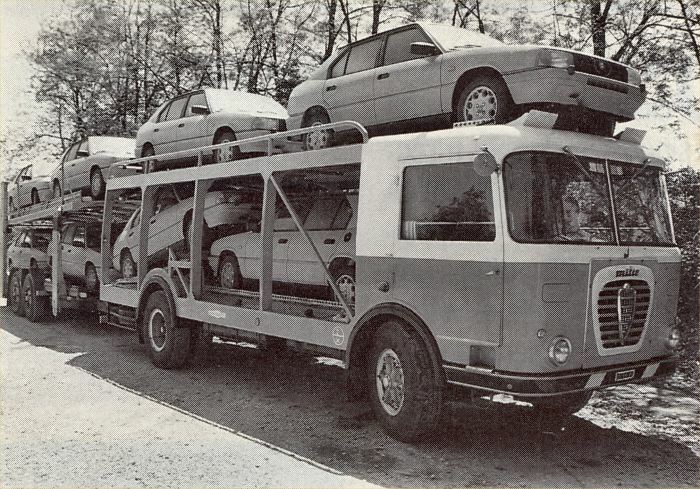 The truck had a custom built cab and a very interesting way of loading. 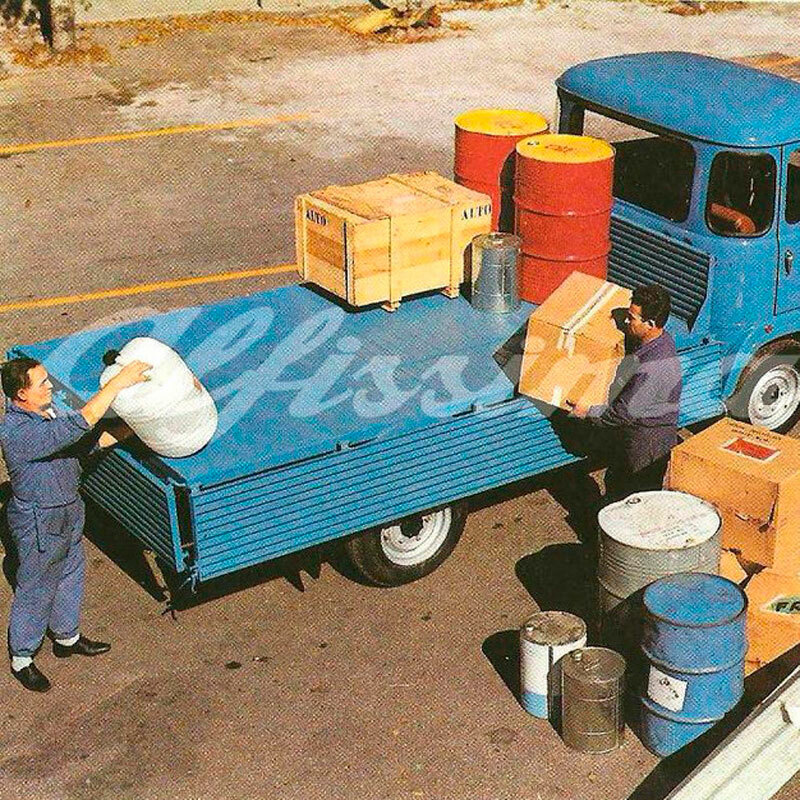 With the help of two retractable pneumatic metal legs, front of the truck rose to 20-30 degrees, making a convenient way to loading of special equipment. 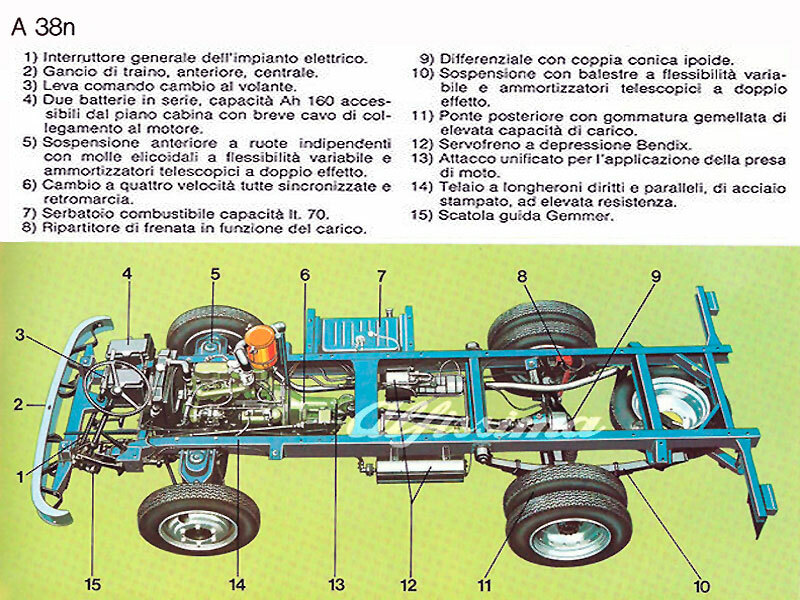 Upper of the body is no less interesting. 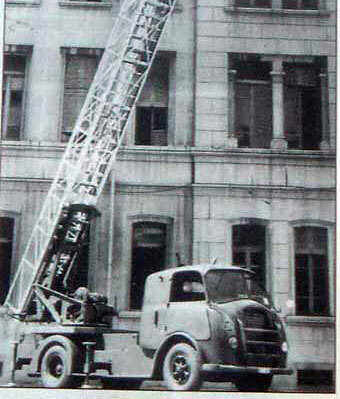 It consisted of three parts that are retracted into one another during loading and unloading. 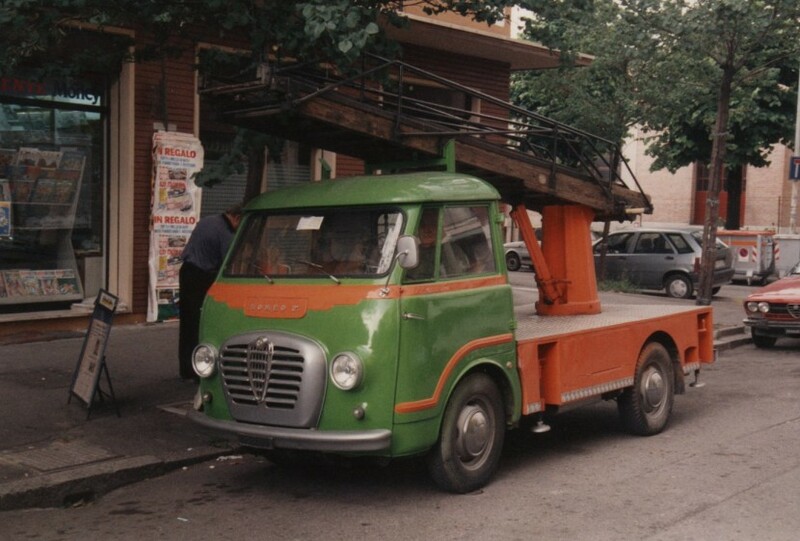 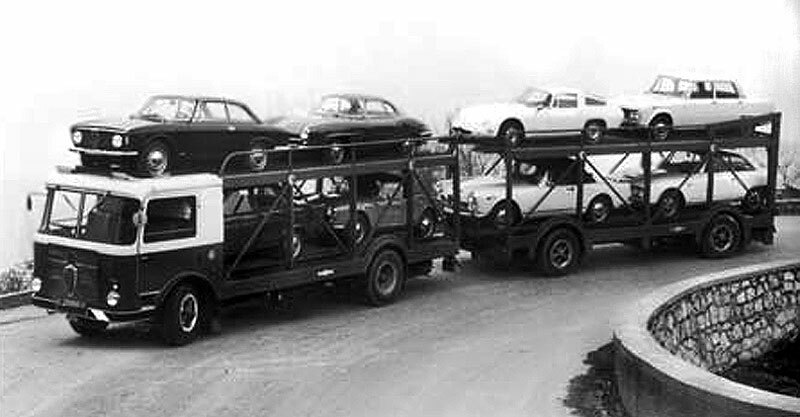 This car transporter was built on the chassis of Alfa Romeo Mille by well known Italian company Bartoletti. 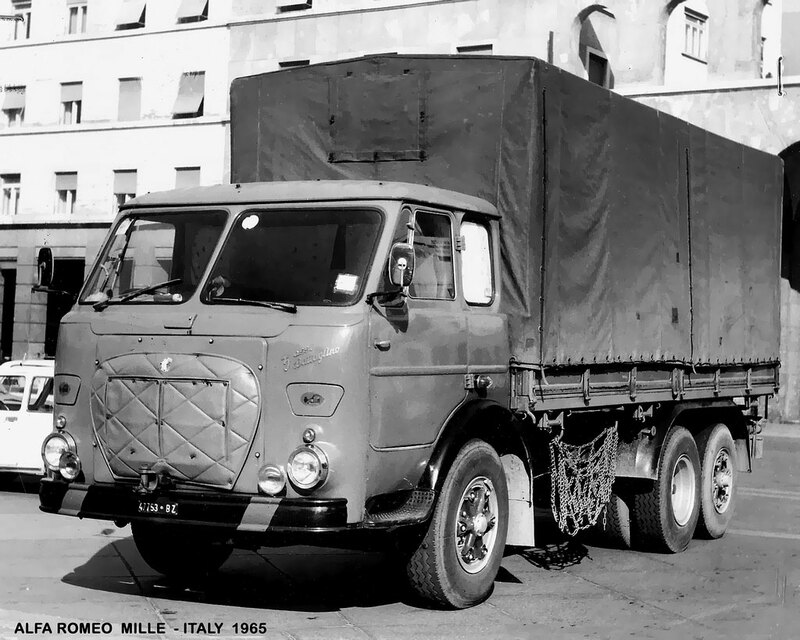 It had an original rectangular cab and the radiator grille was made in a style of Mille truck. 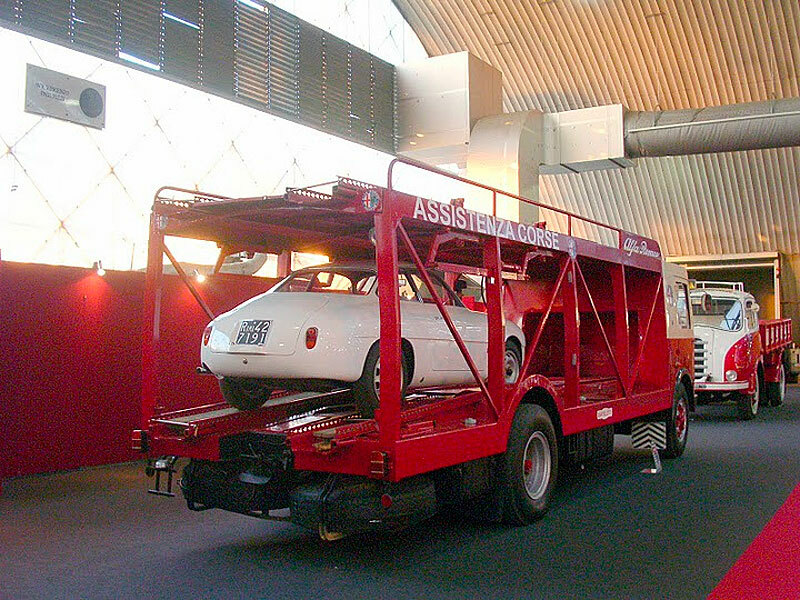 The combination could carry up to 8 cars on two levels of the car and trailer. 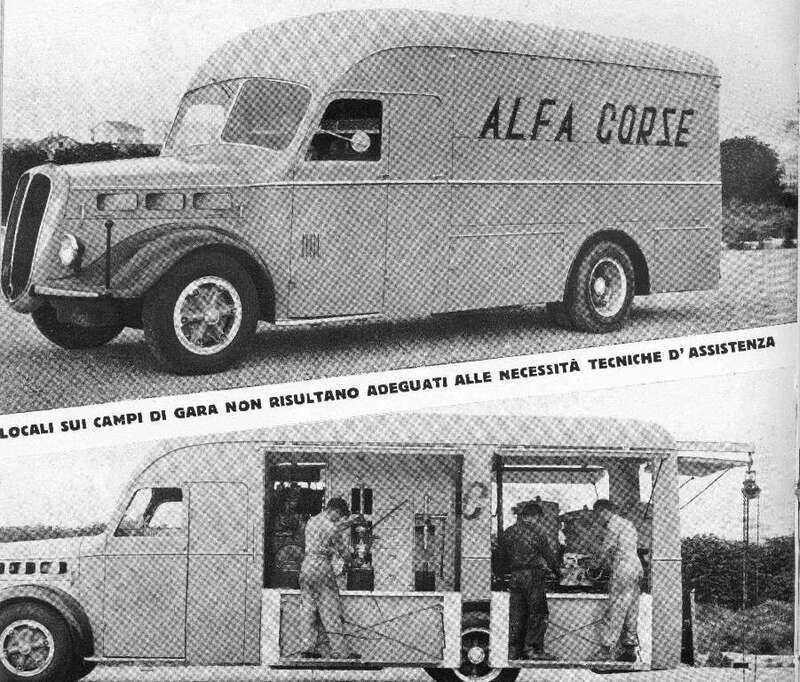 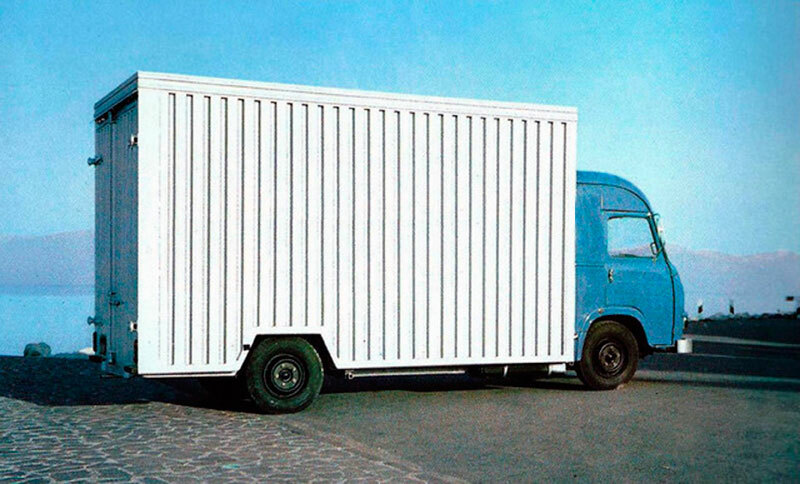 Ferrari racing team used this transporter for their race cars, created on the chassis of Alfa Romeo 800. 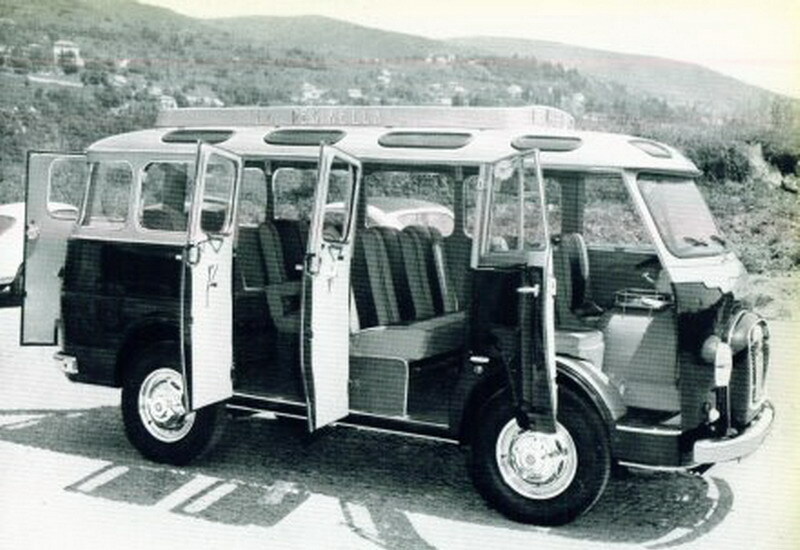 Bus body had an increased height of the roof behind the front seats, where there was a place for sport cars and different equipment. 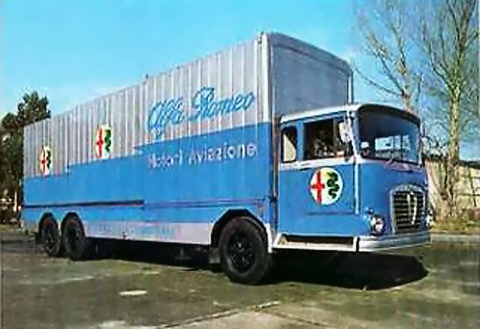 Alfa Romeo 500 was used as race transporter for Formula 1 racing teams. 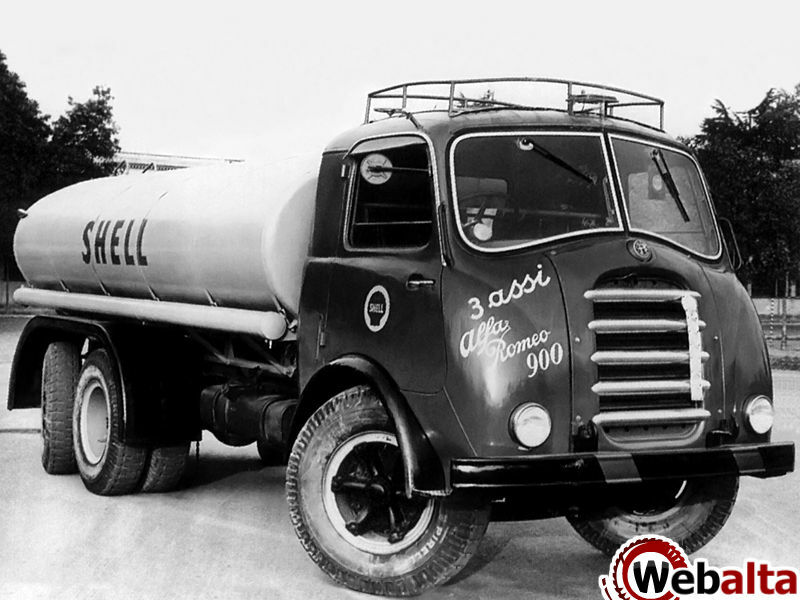 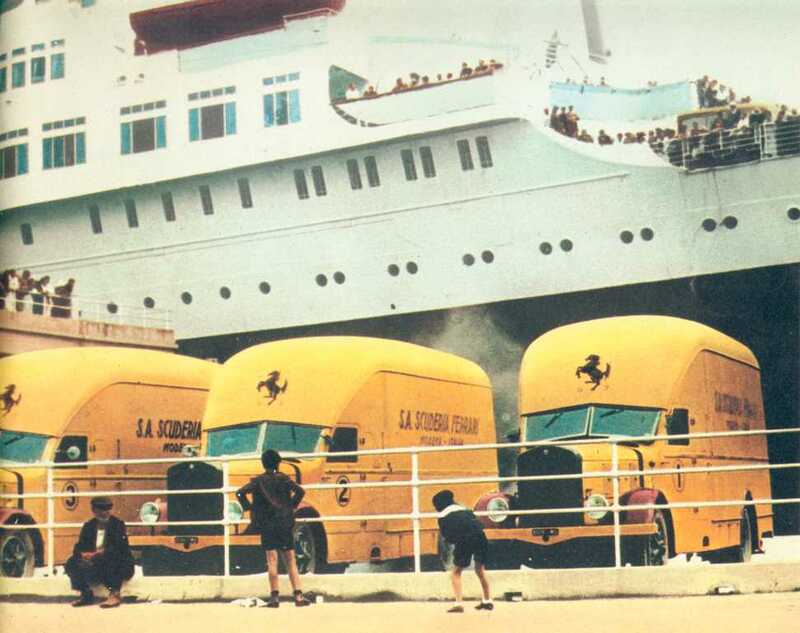 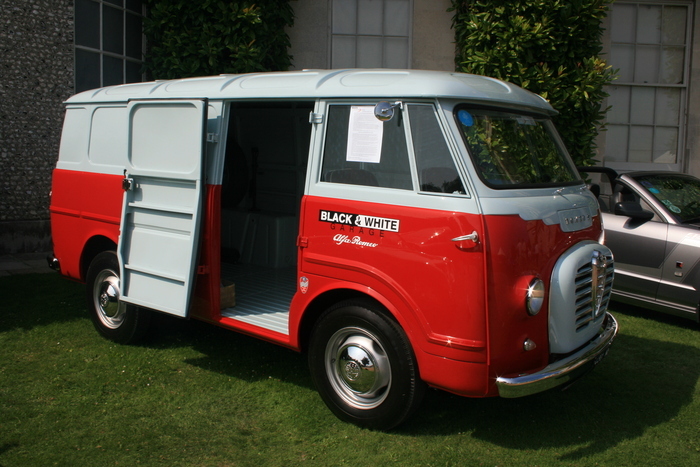 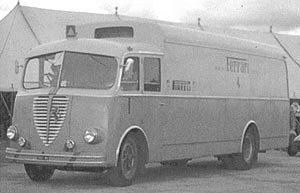 One of such race transporter based on the first generation of Model 500 was used by Ferrari racing team in the mid-30s, and the other transporter, based on the second generation truck was used by the factory team Alfa Romeo in the 50s. 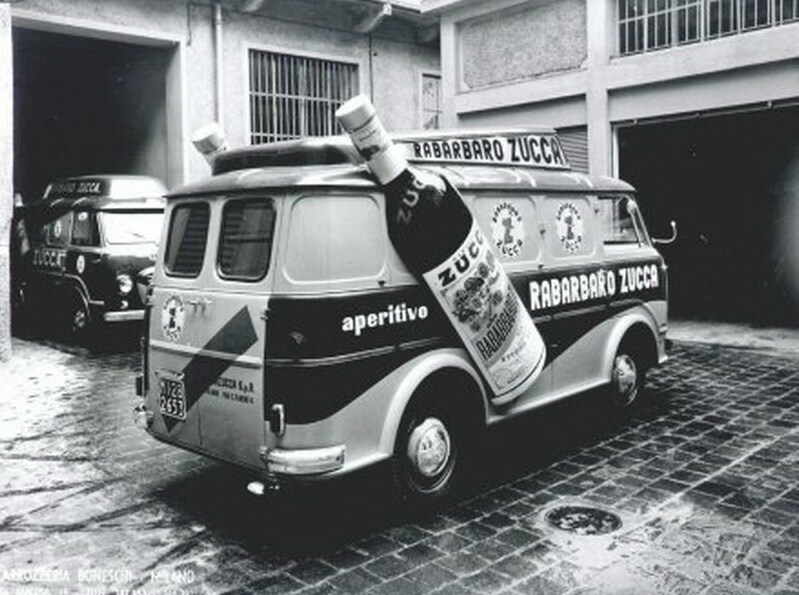 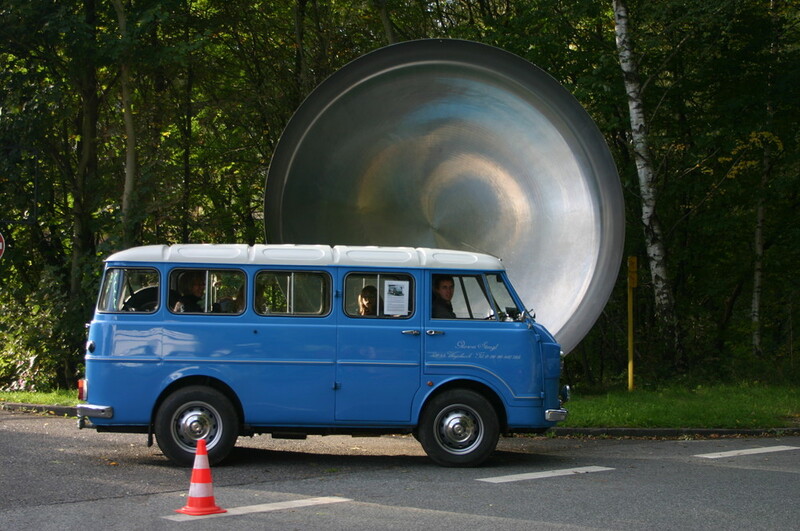 The tucks have a streamlined van body, which could carry a racing car, spare parts and tools. 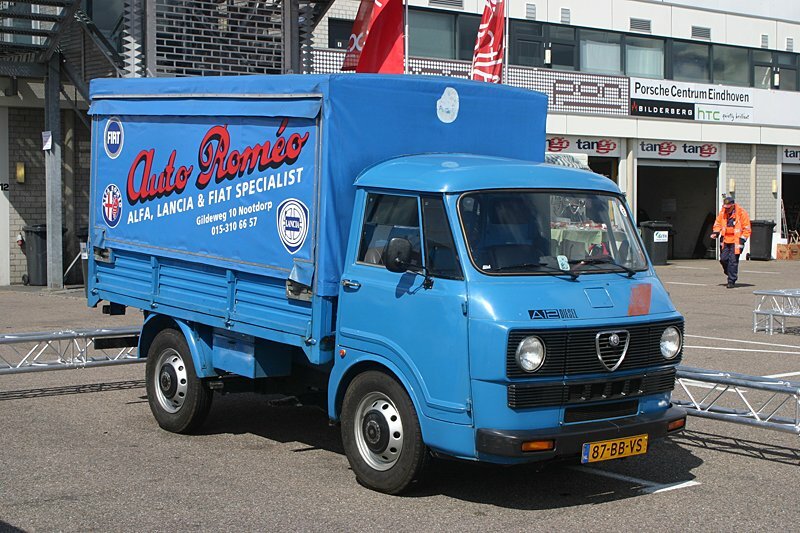 Very nice done, keep going Jeroen with these beautiful Alfa Romeos.